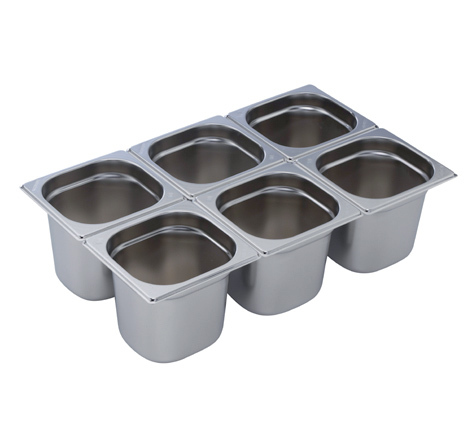 A “team” with a perfect range and above all a winner! 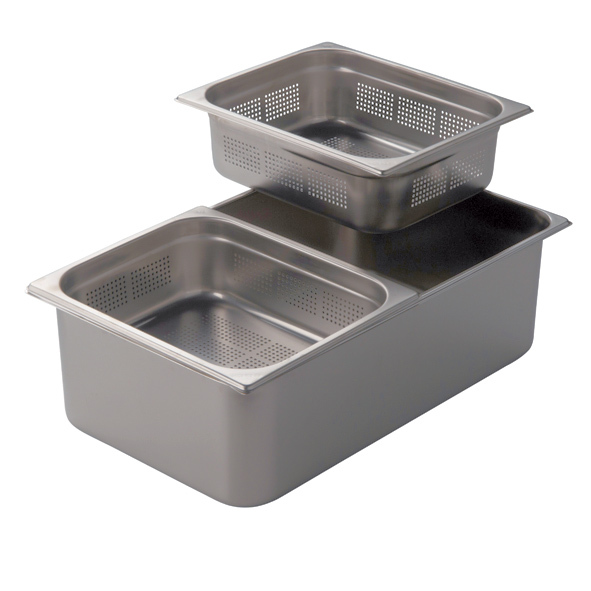 GASTRONORM is a series of interchangeable and stackable products: unity is strength. 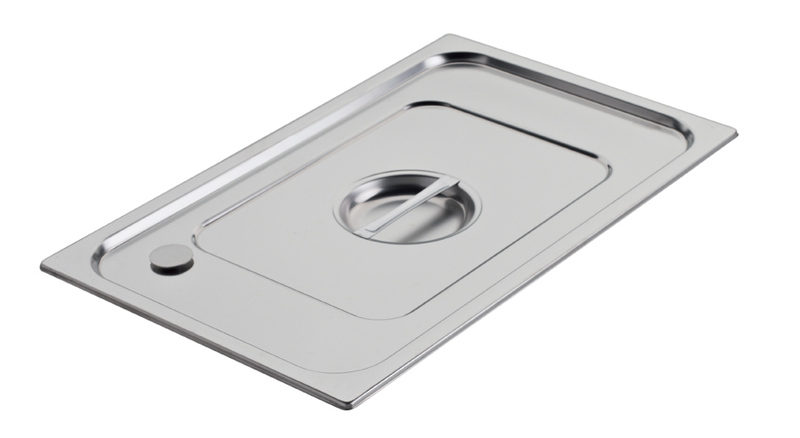 High quality, solid and made to last, thanks to the increased thickness (can vary from 0.7 to 1mm) and the use of stainless steel Aisi304. 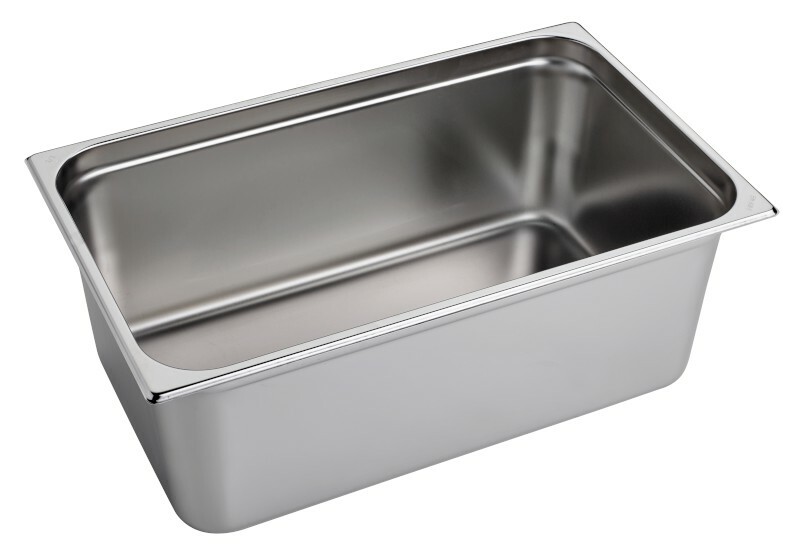 This steel, commercially known as 18/8 or 18/10, contains up to 10 times more nickel than low quality products; this makes it resistant to corrosion and damages caused by aggressive, but common agents like salt and organic solvents included in detergents. 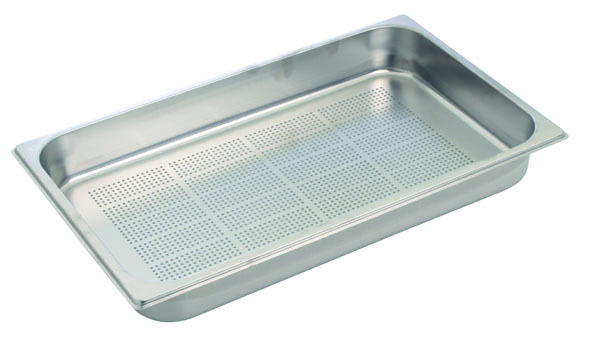 The production is completed by electrolysis cleaning in acid, a special procedure normally reserved for surgical instruments. 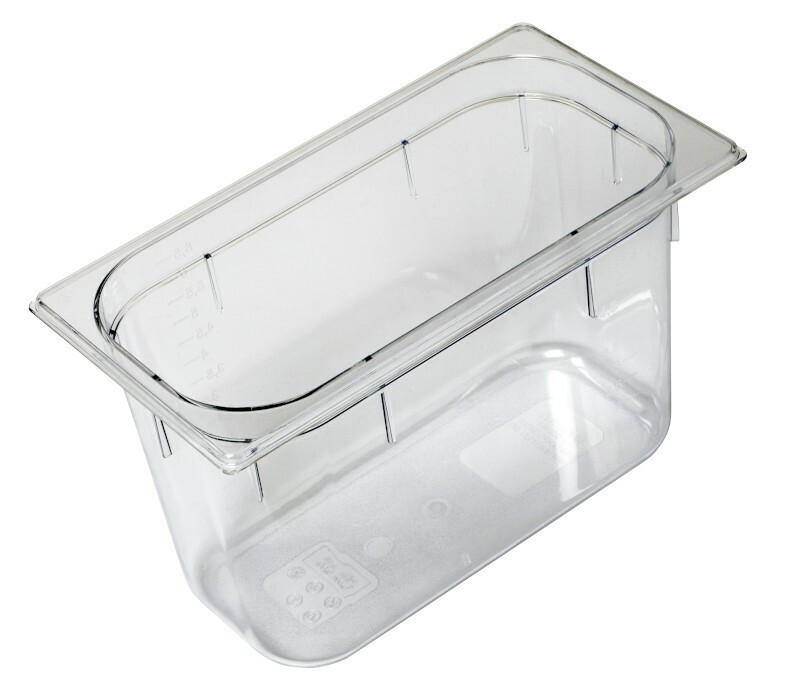 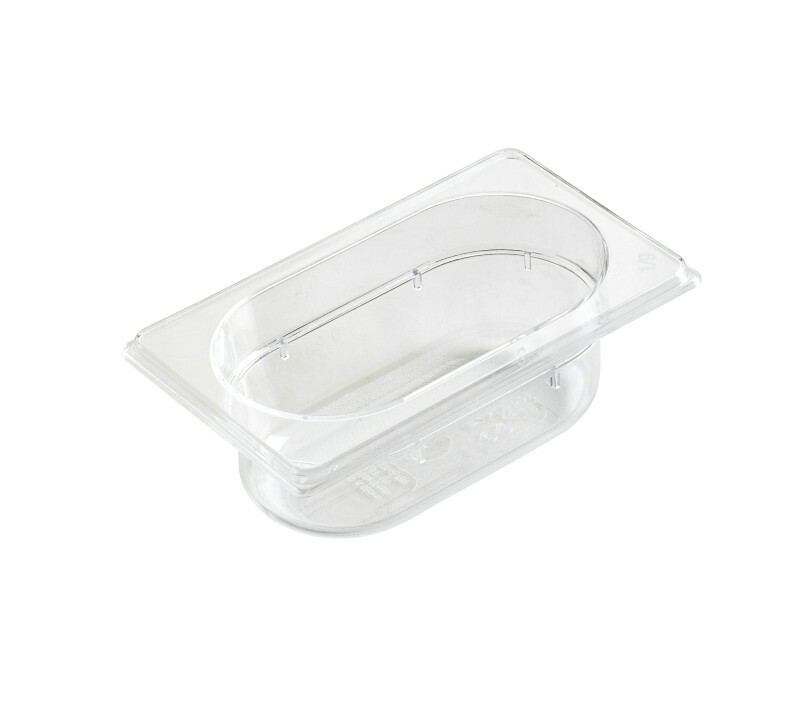 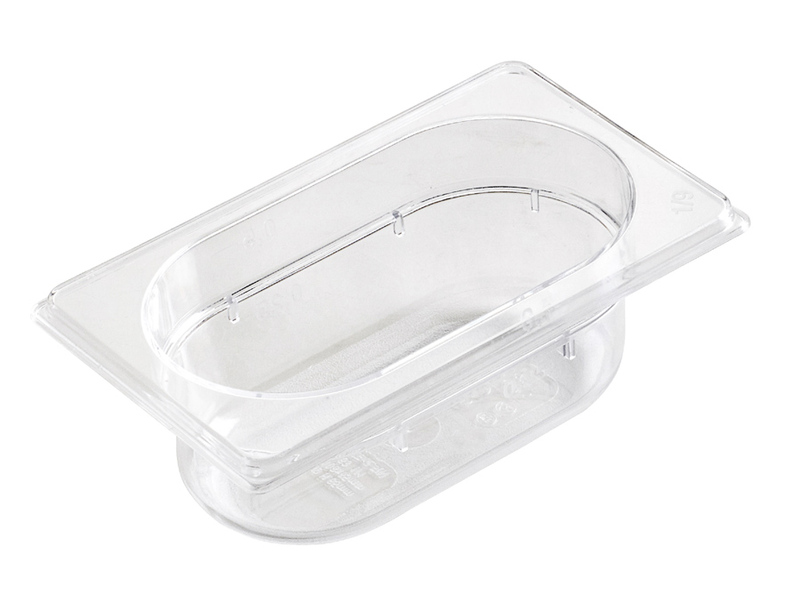 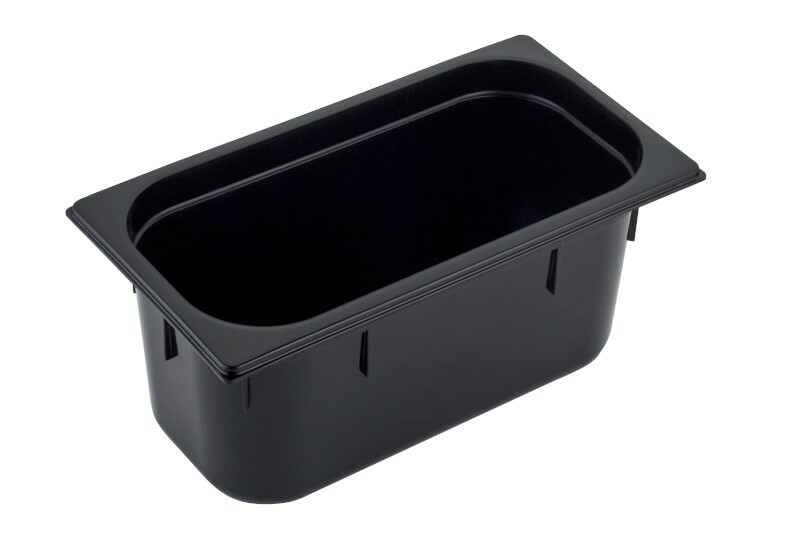 The accurate design makes these Gastronorm containers a great choice for the presentation of food and very practical for the kitchen: the stacking collar on the side lets you stack them without getting them stuck inside each other, while the tight but smooth radius improves capacity and makes them easy to clean. 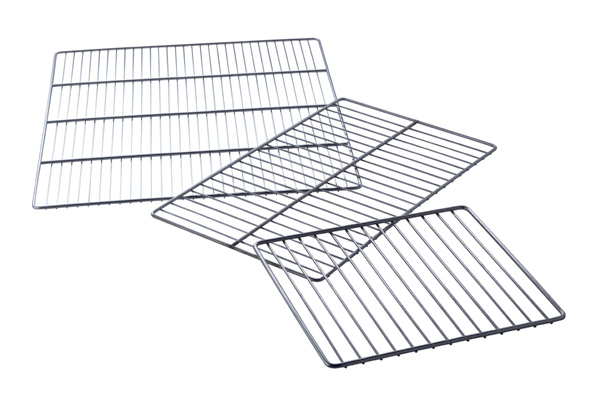 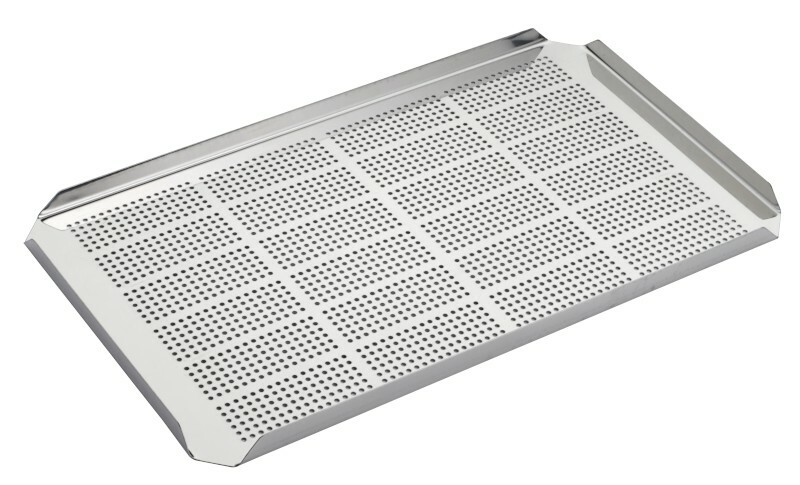 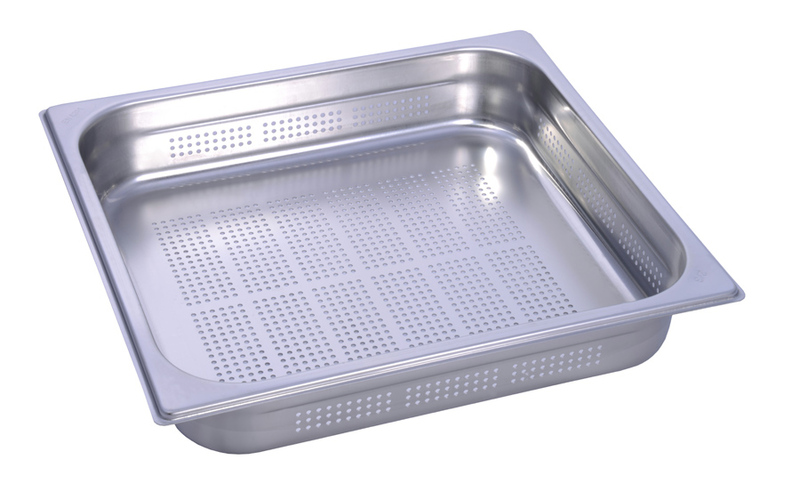 Resistant to high and low temperatures (-40°C, +300°C), they can be used in the oven, bain-marie and to stock or transport hot food. 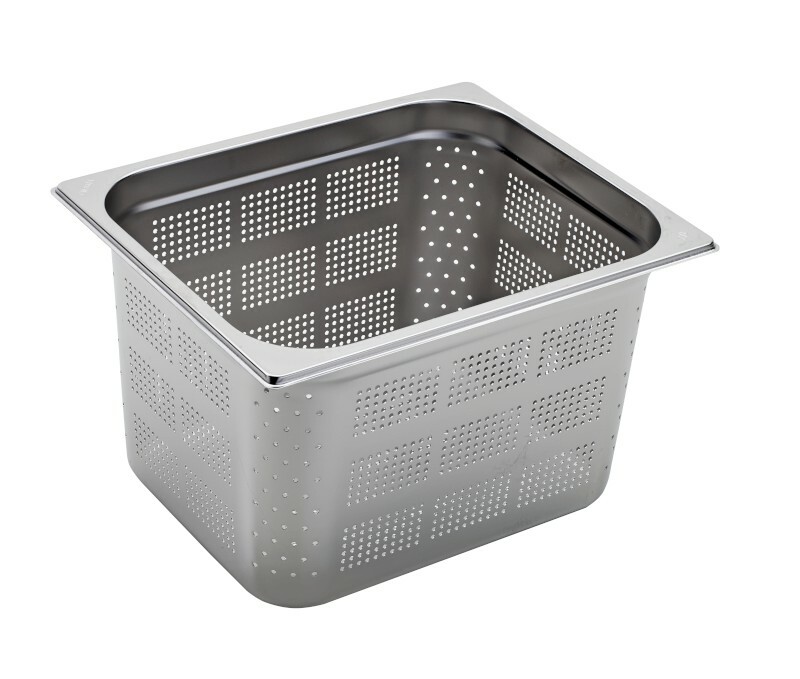 The use of high quality raw material makes them ideal for prolonged use: completely odourless and flavourless, they don’t fear corrosion and repeated washing cycles in the dishwasher. 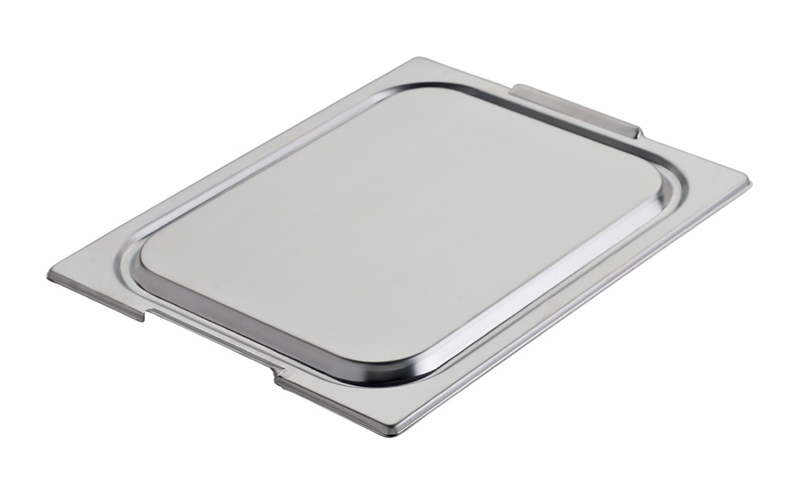 They comply fully with standard EN-631 norms and they’re certified by NSF, the best known quality mark in the American market. 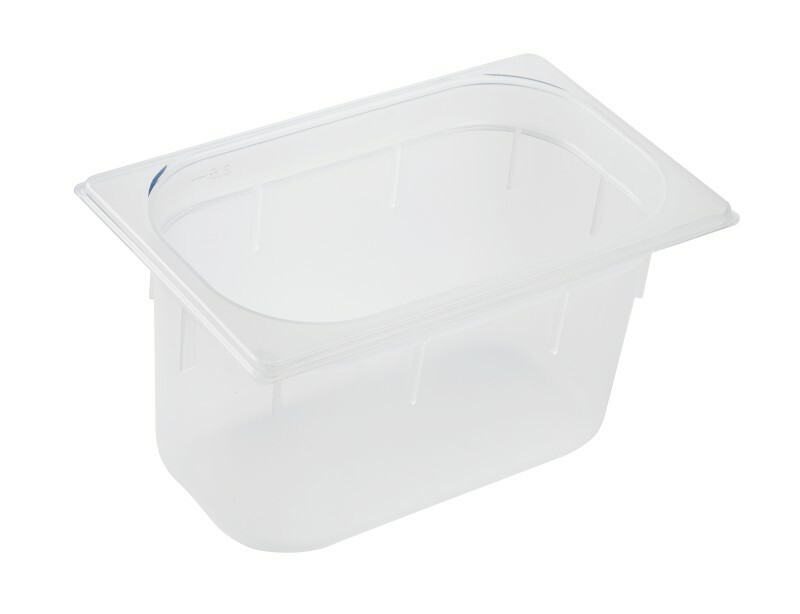 The stacking collars on the walls allow to easily stack and unstack the containers without risks. 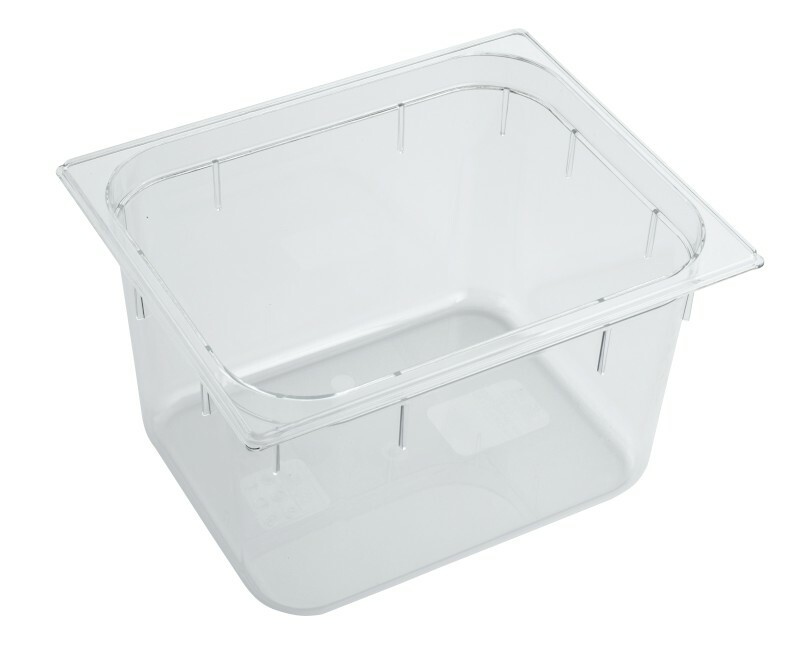 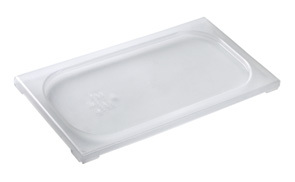 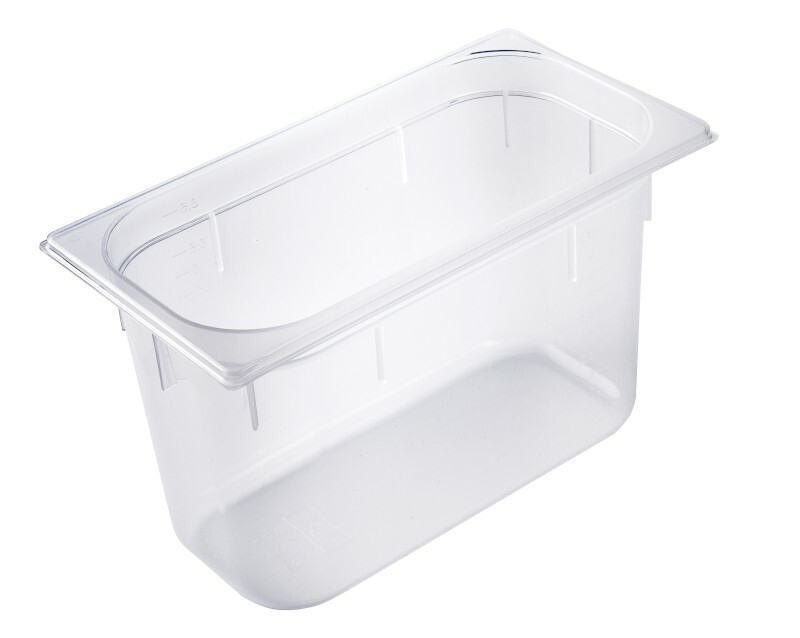 Compatible with our Gastronorm polycarbonate containers. 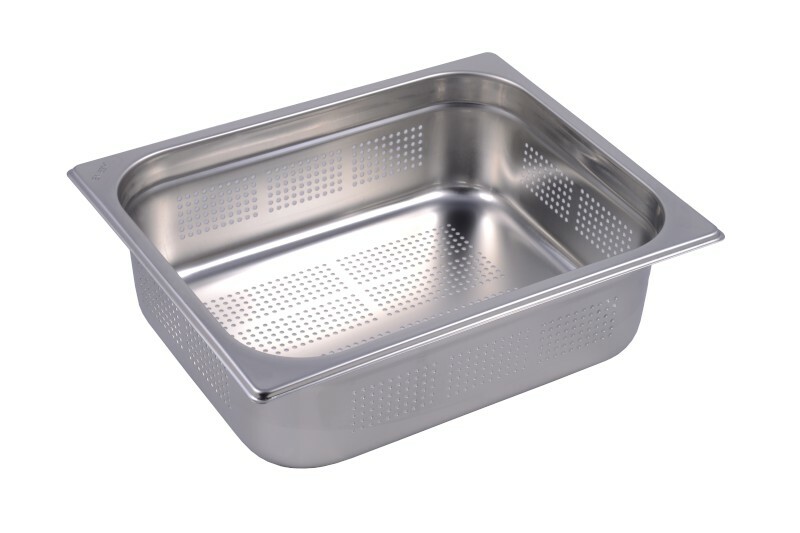 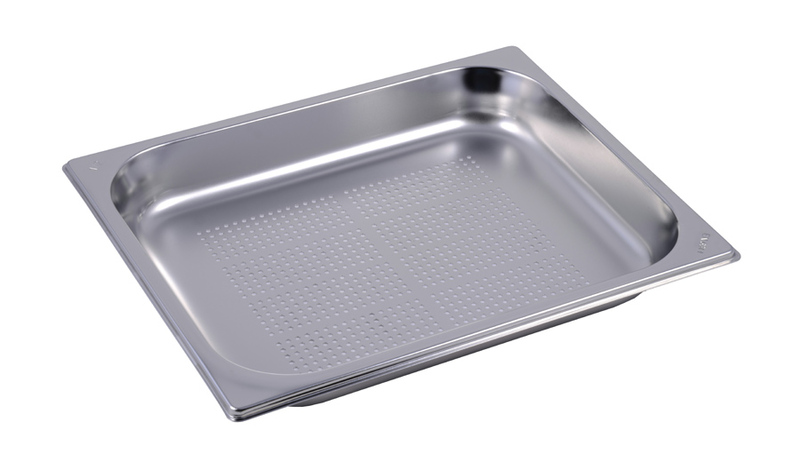 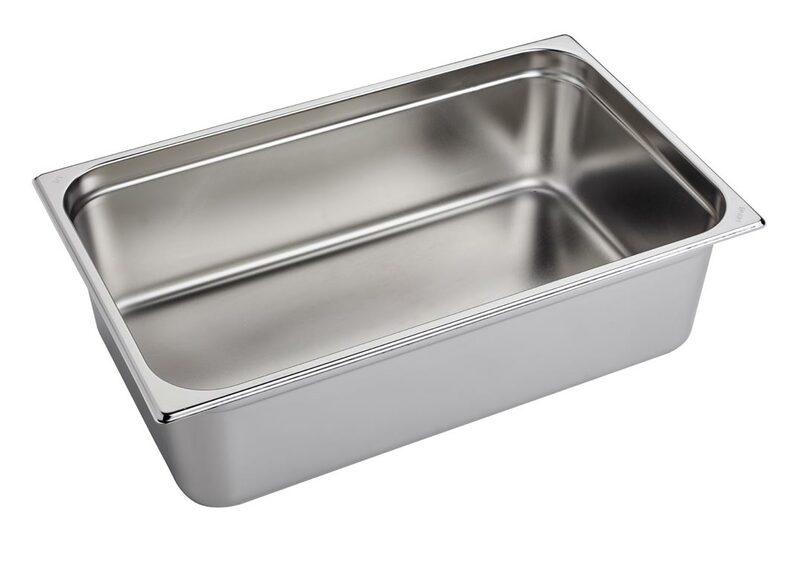 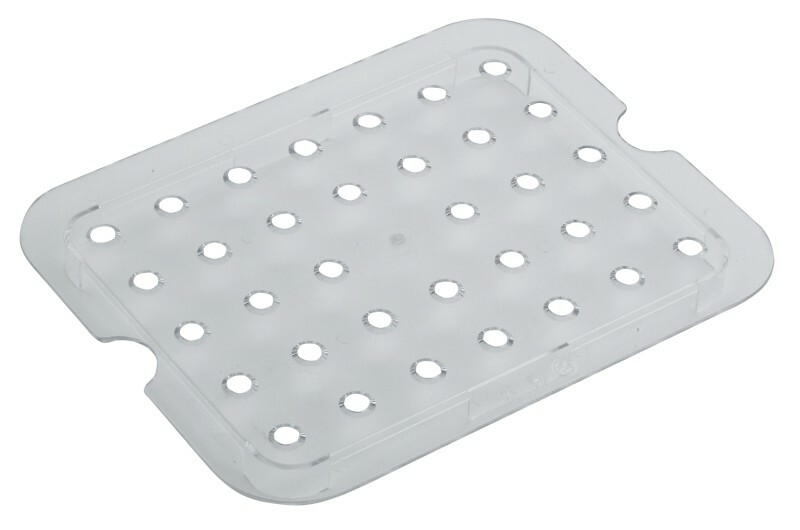 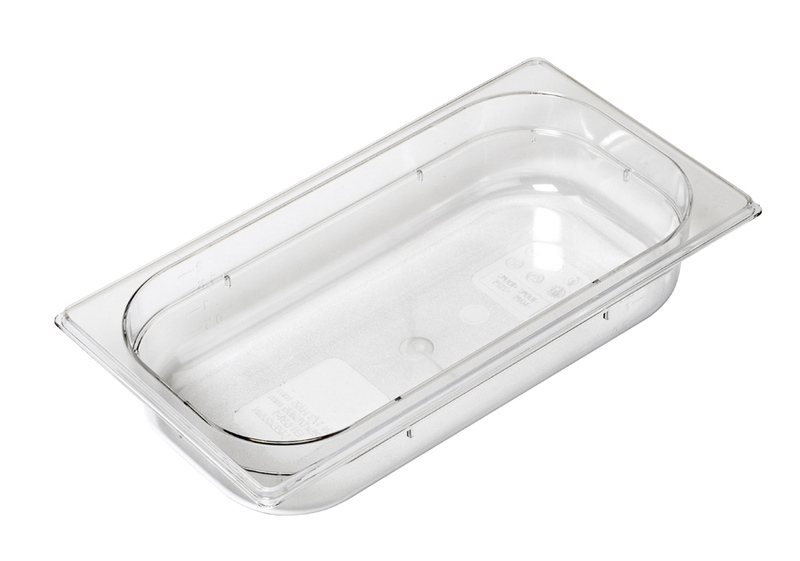 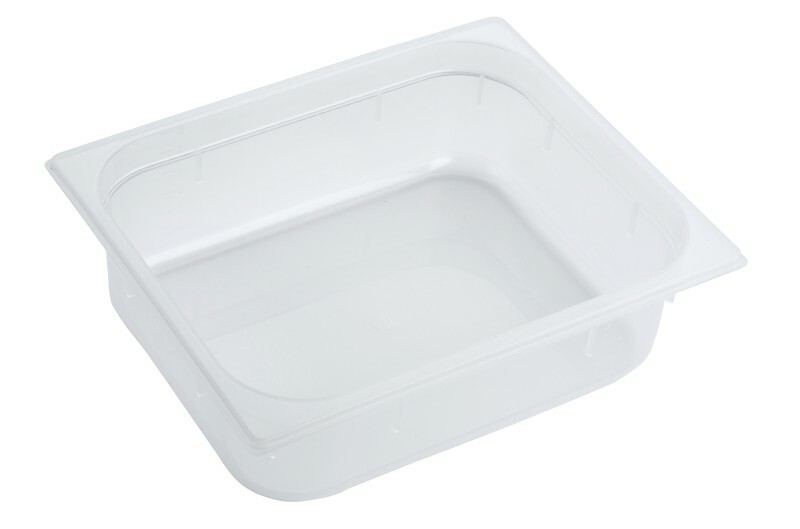 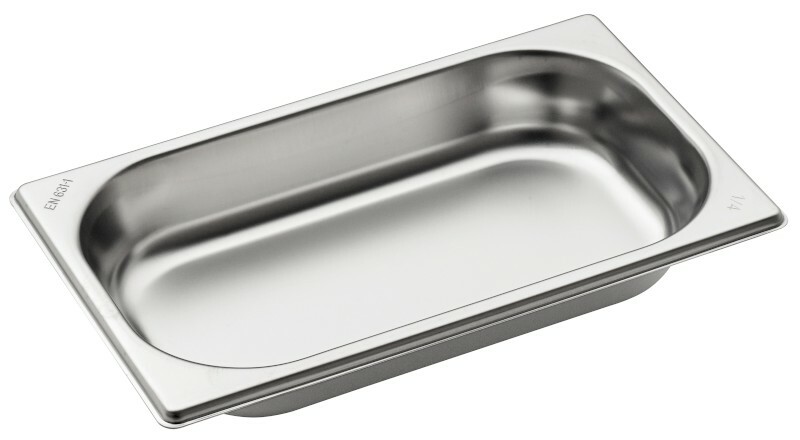 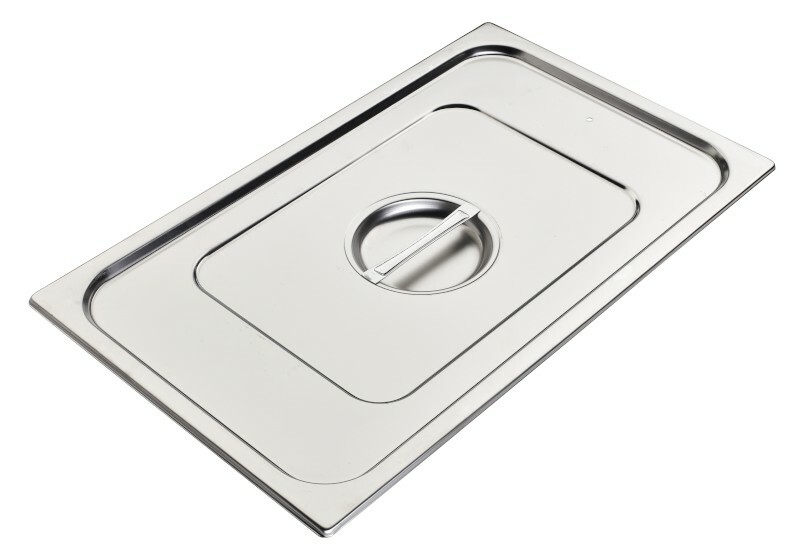 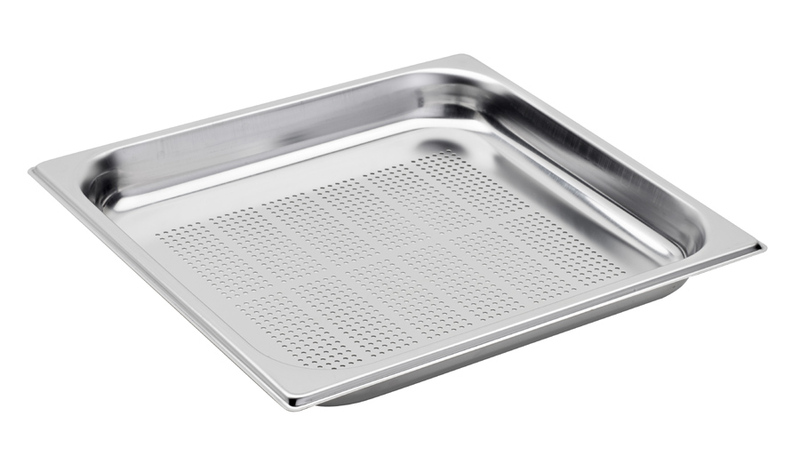 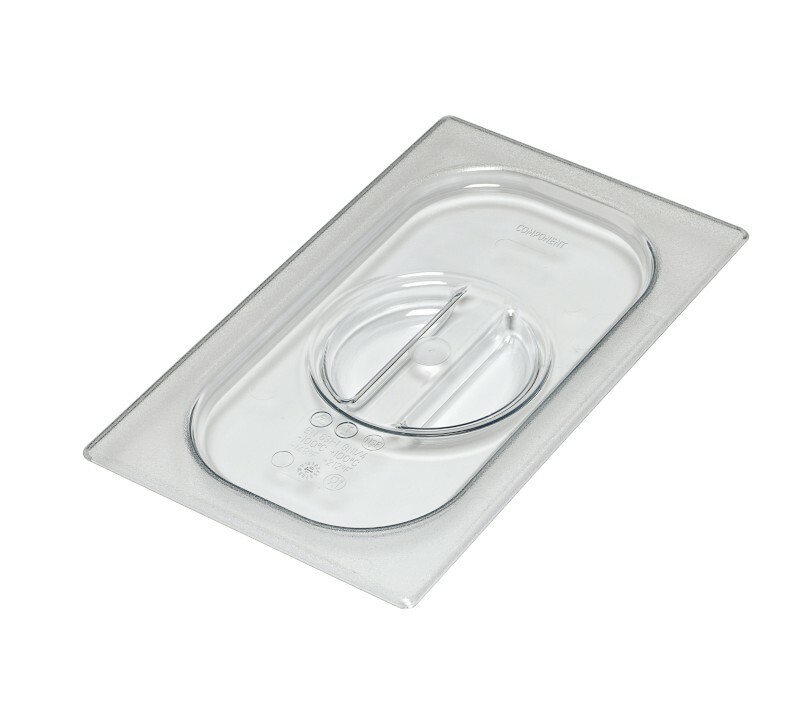 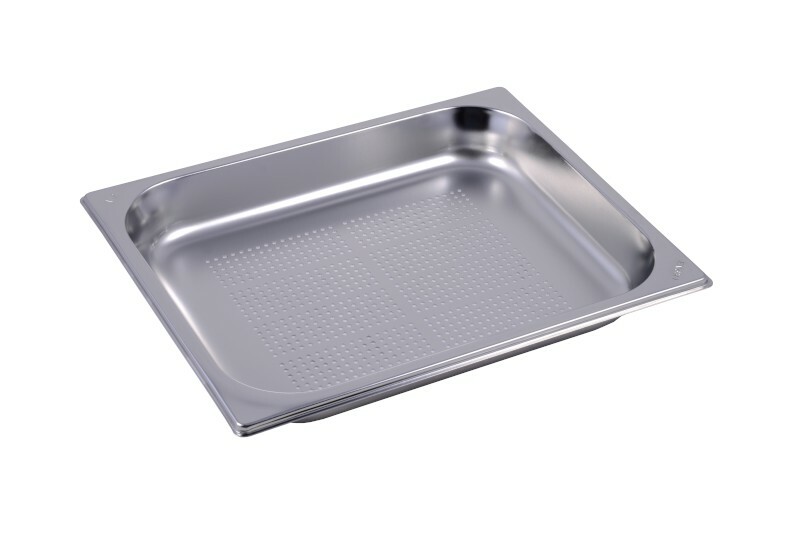 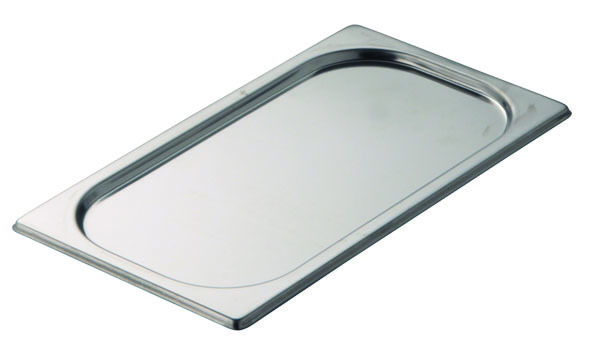 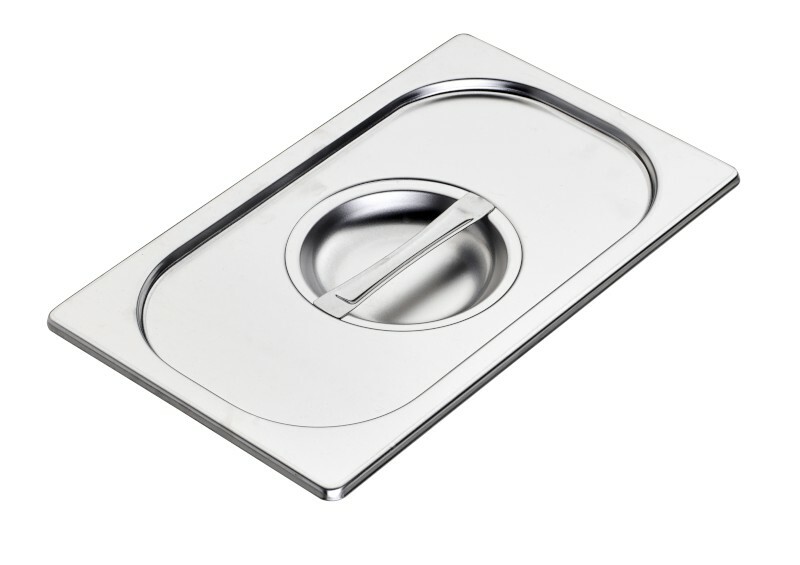 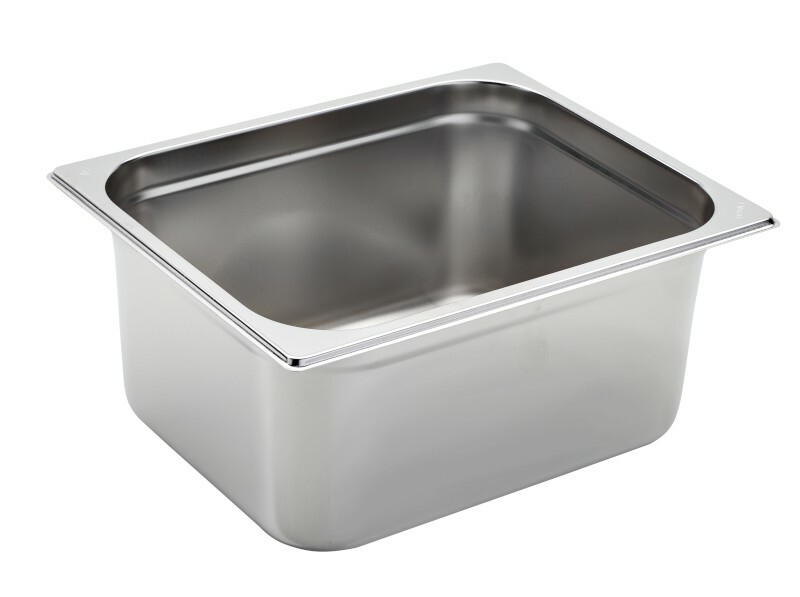 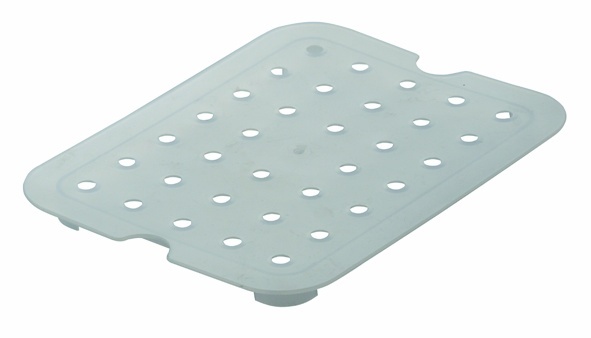 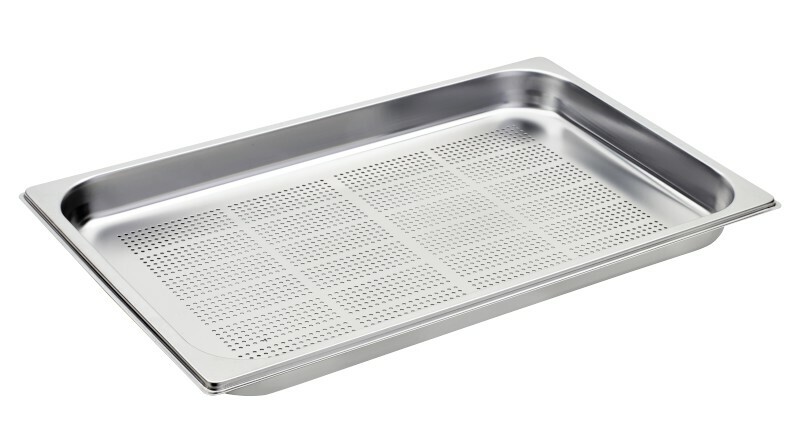 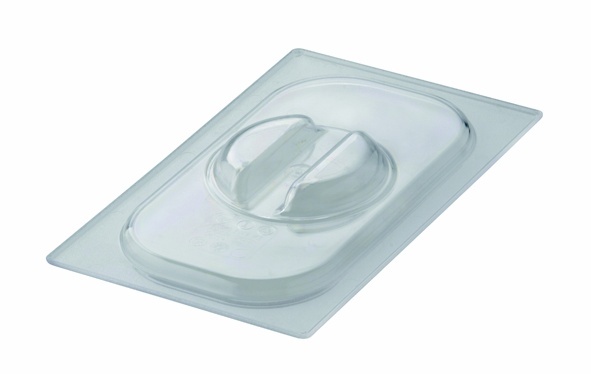 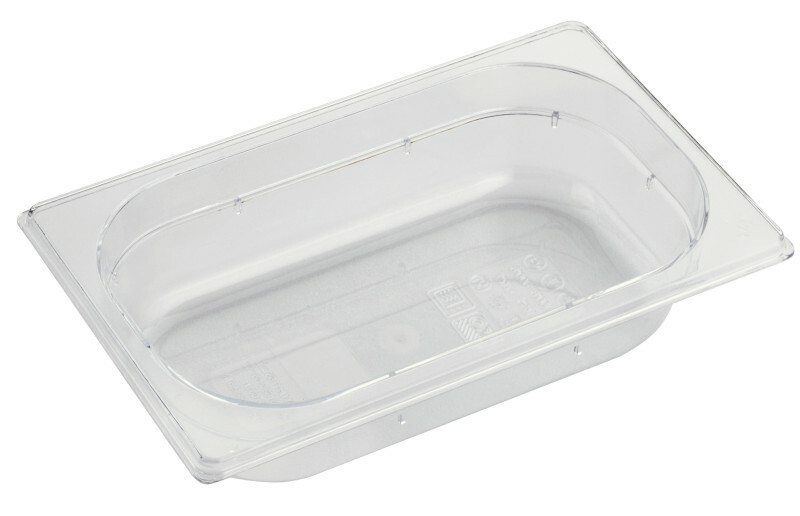 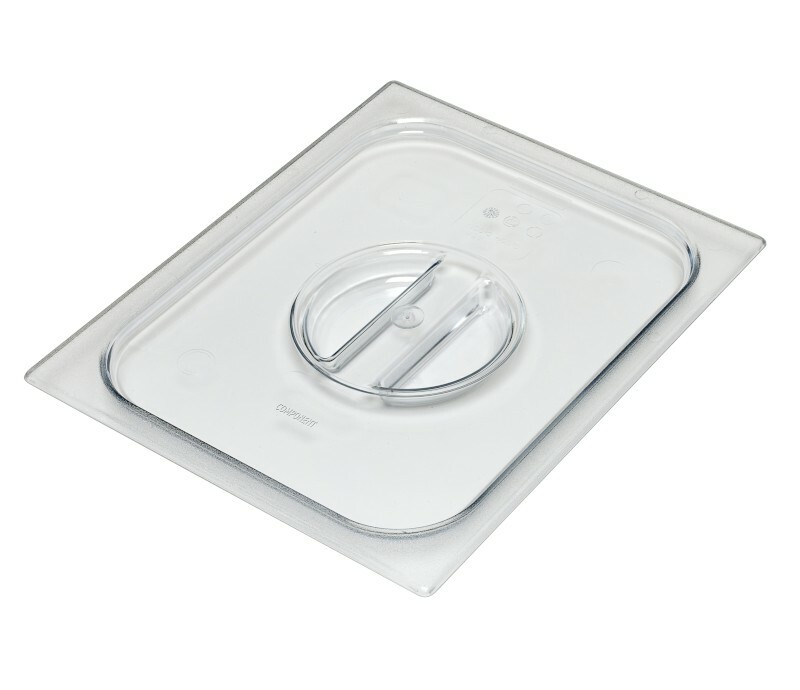 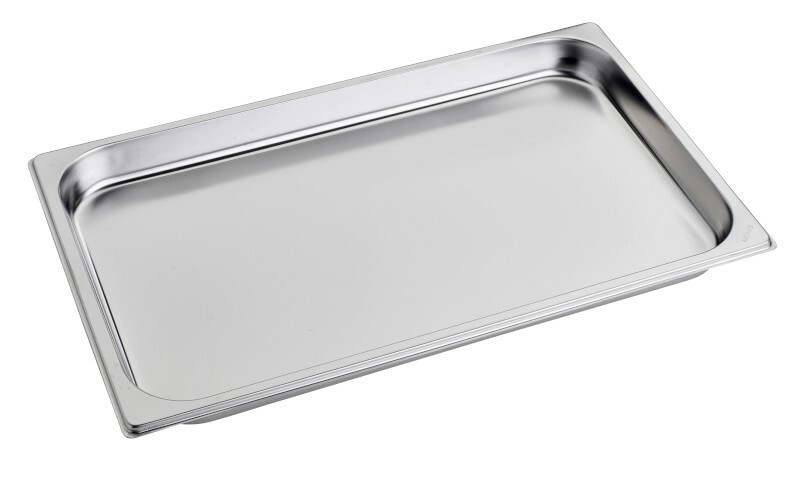 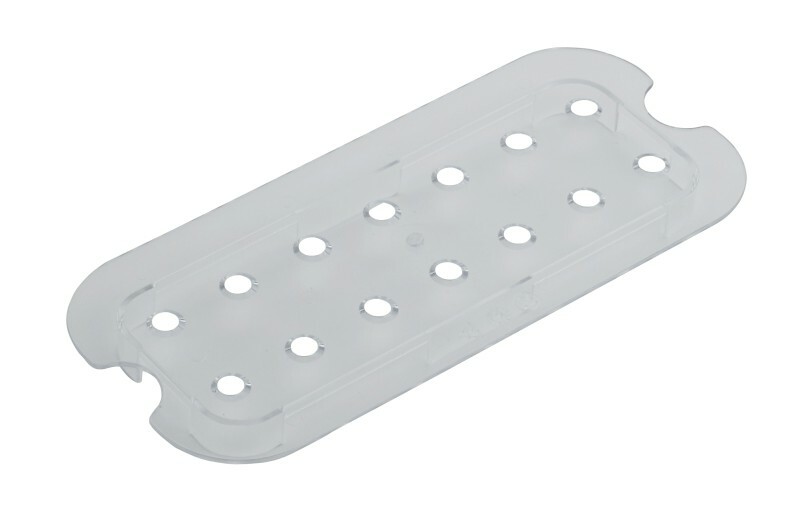 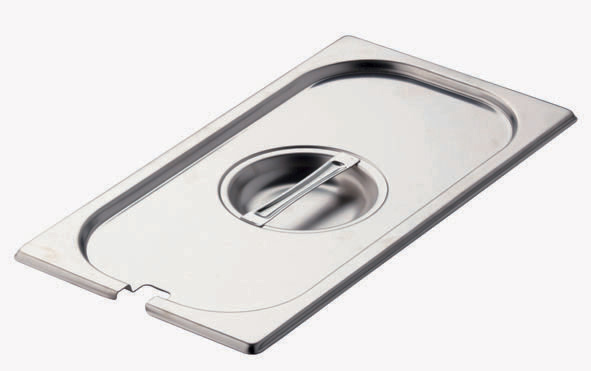 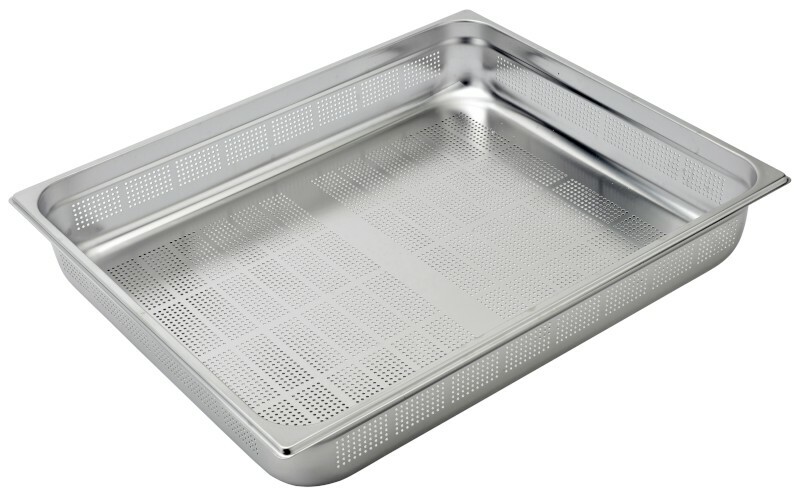 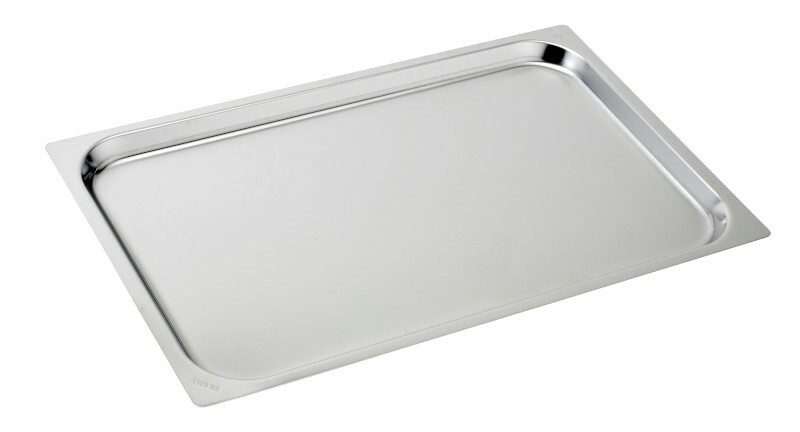 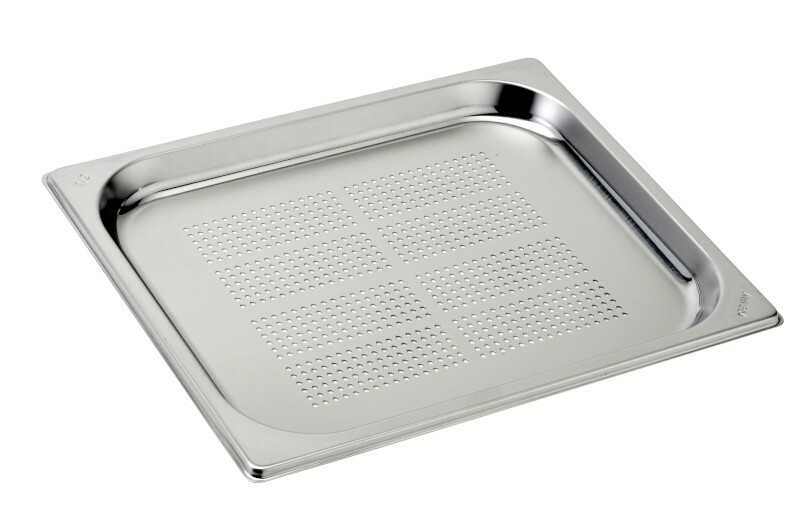 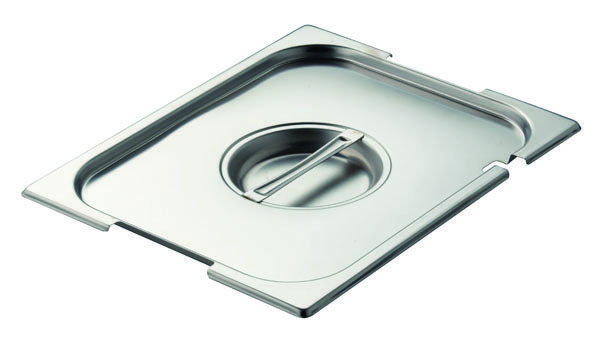 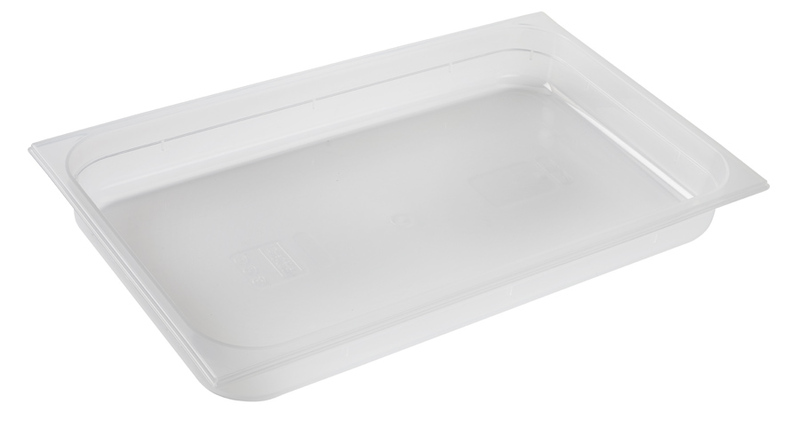 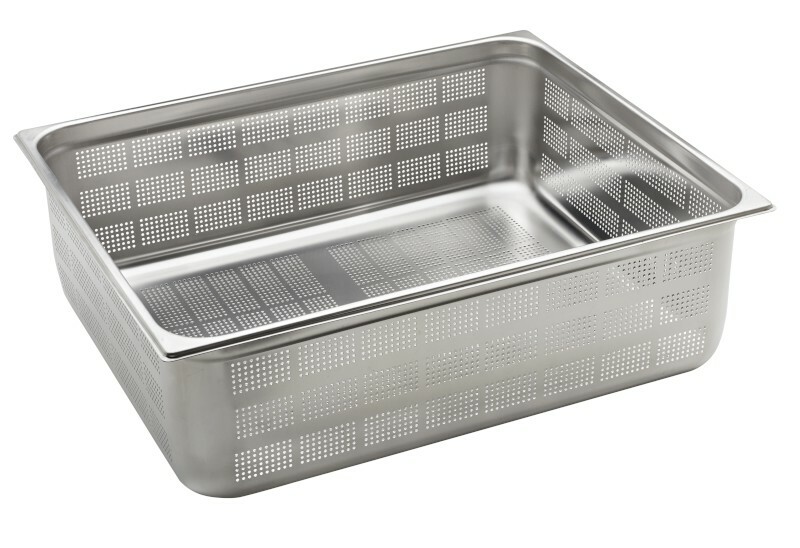 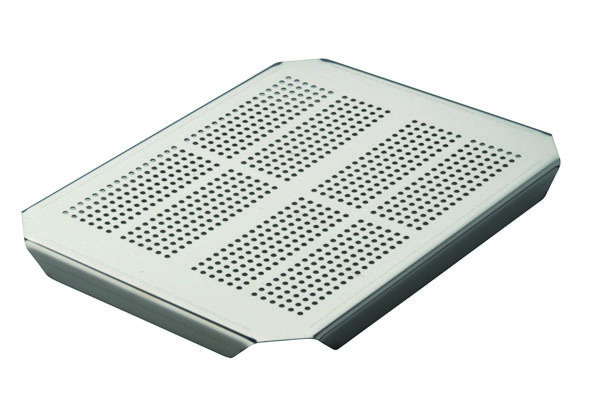 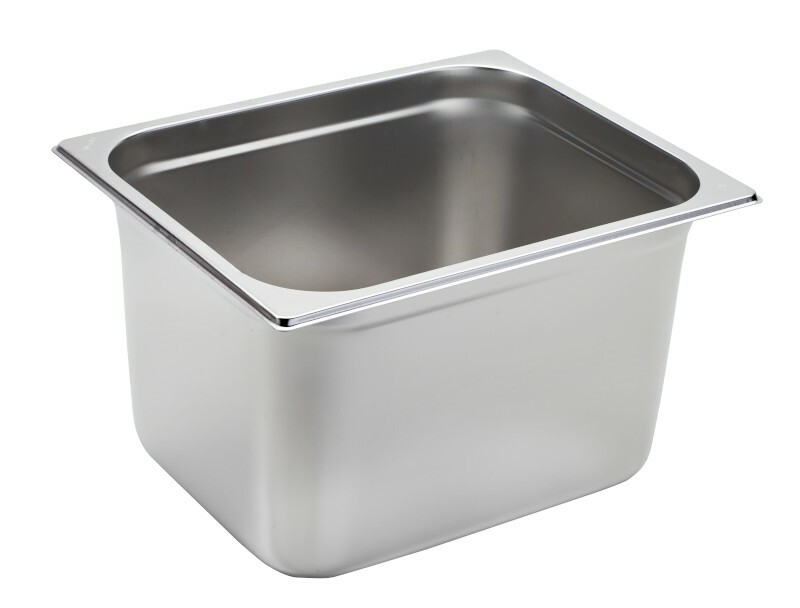 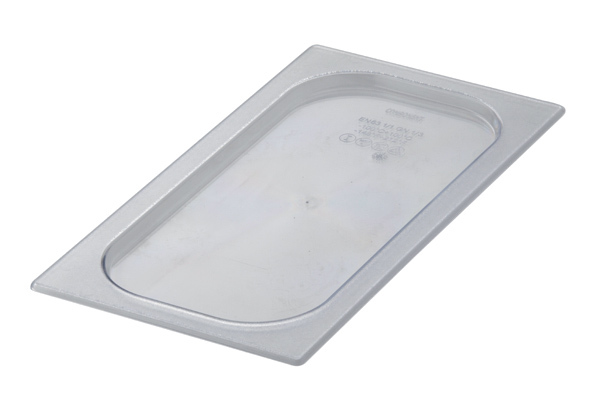 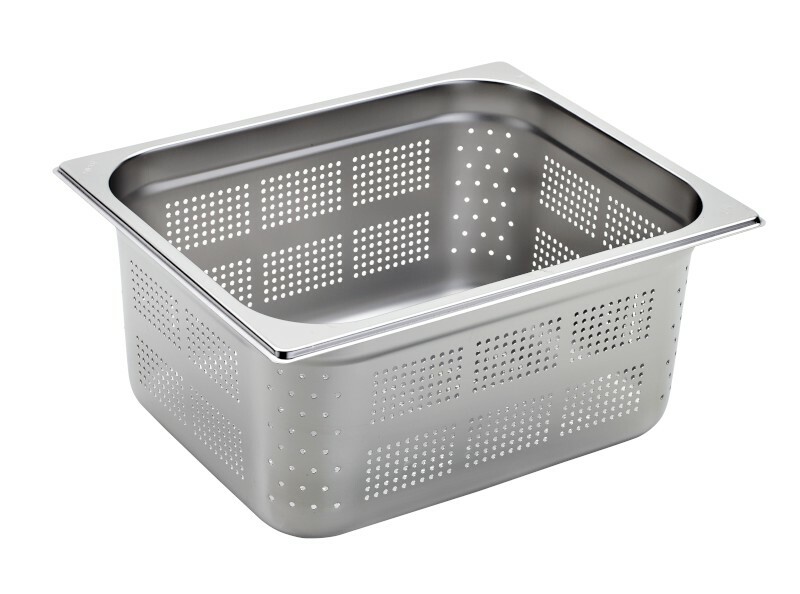 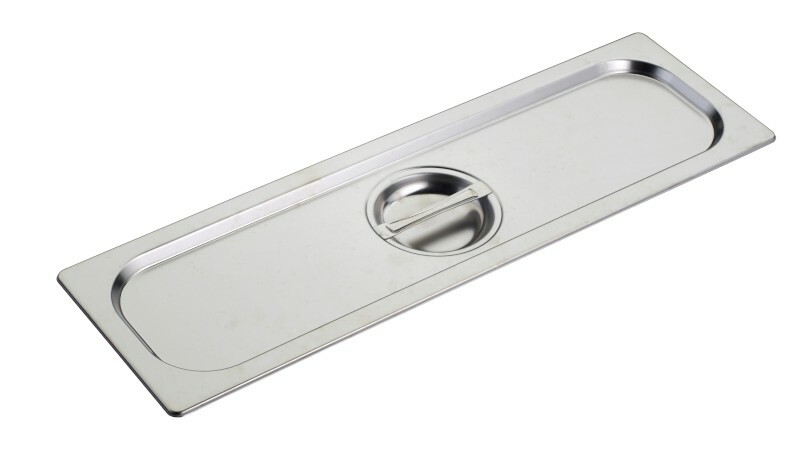 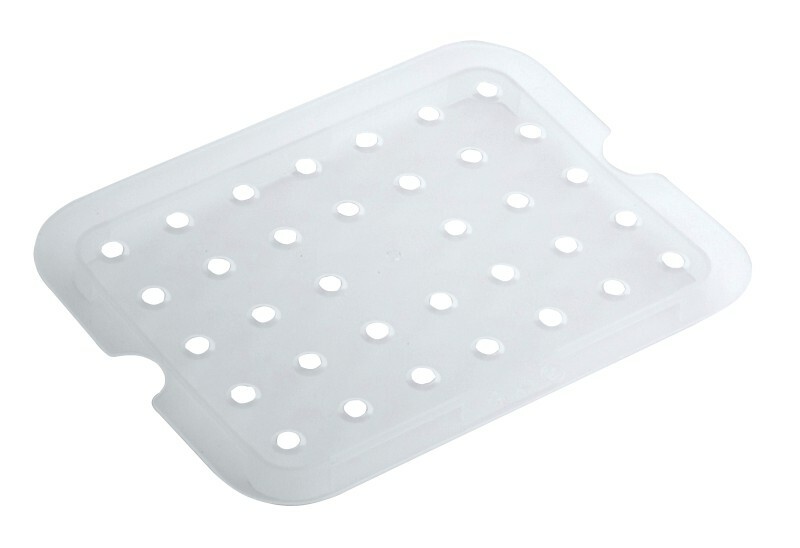 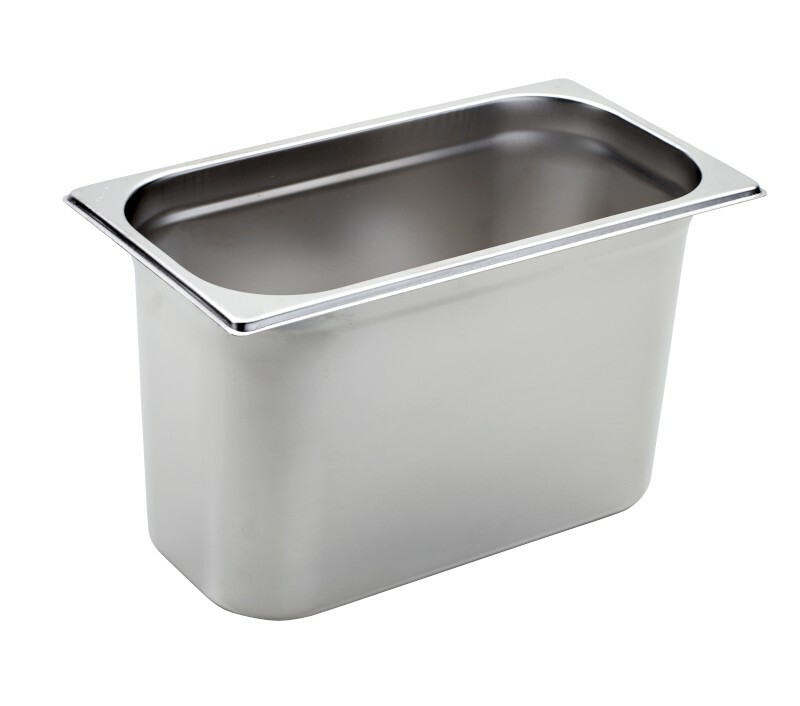 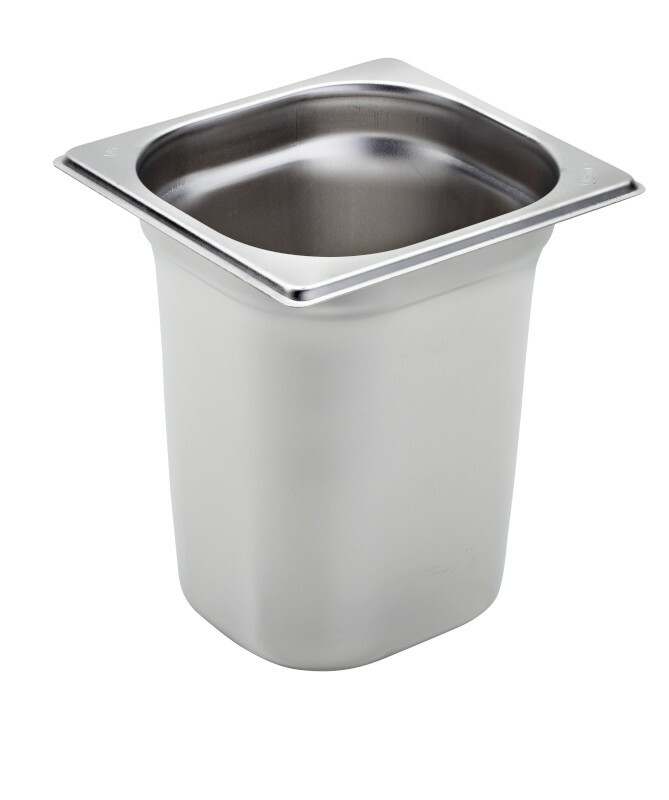 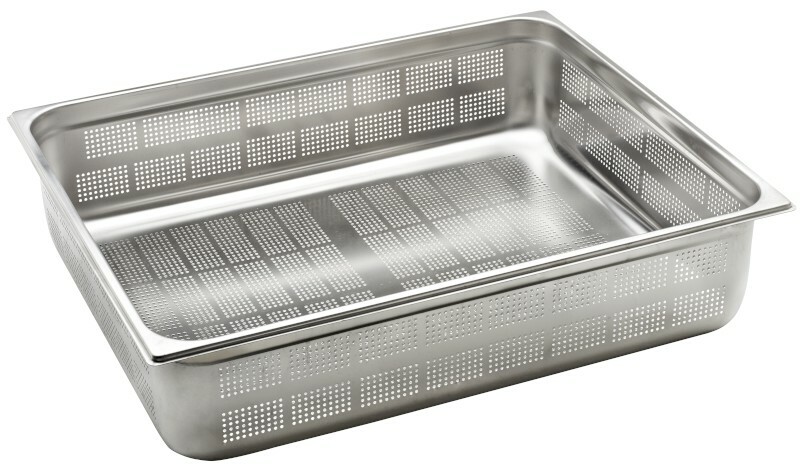 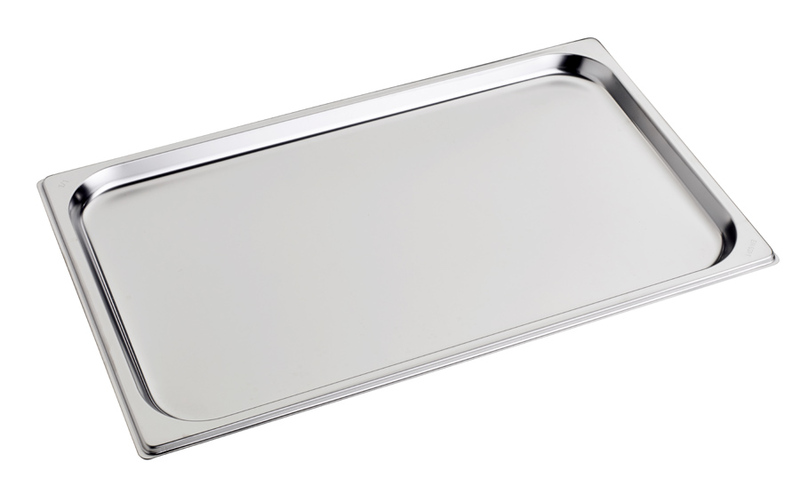 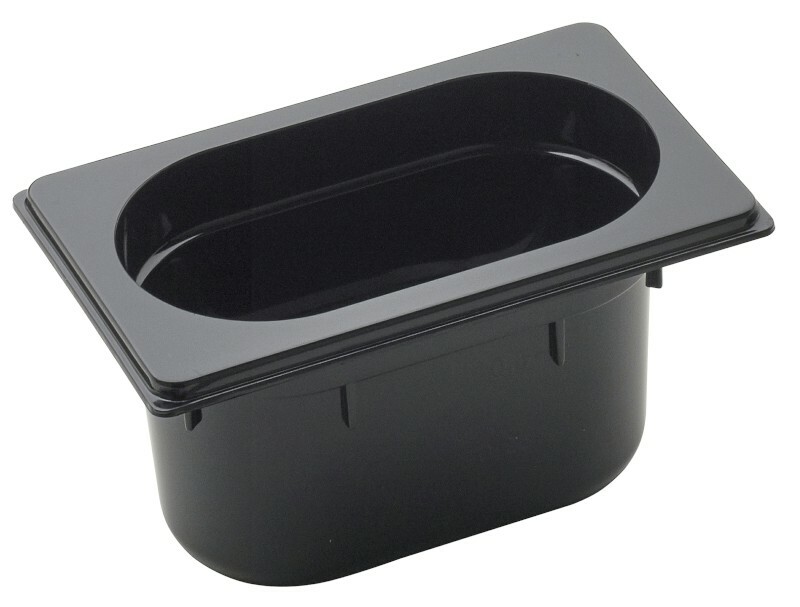 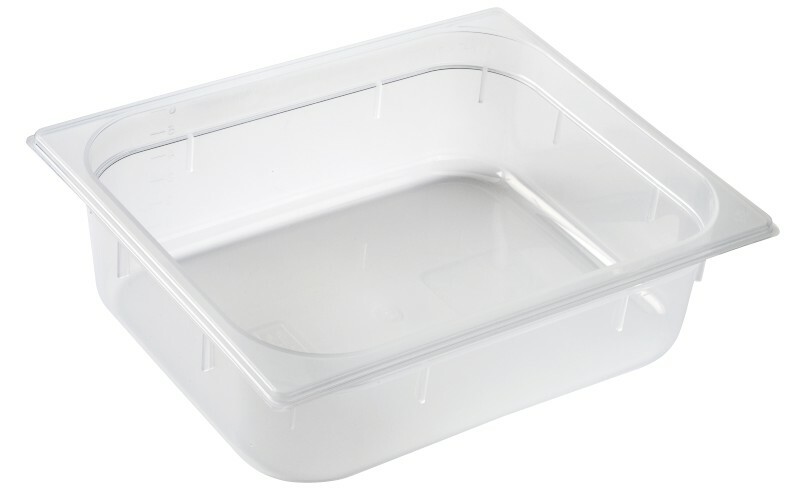 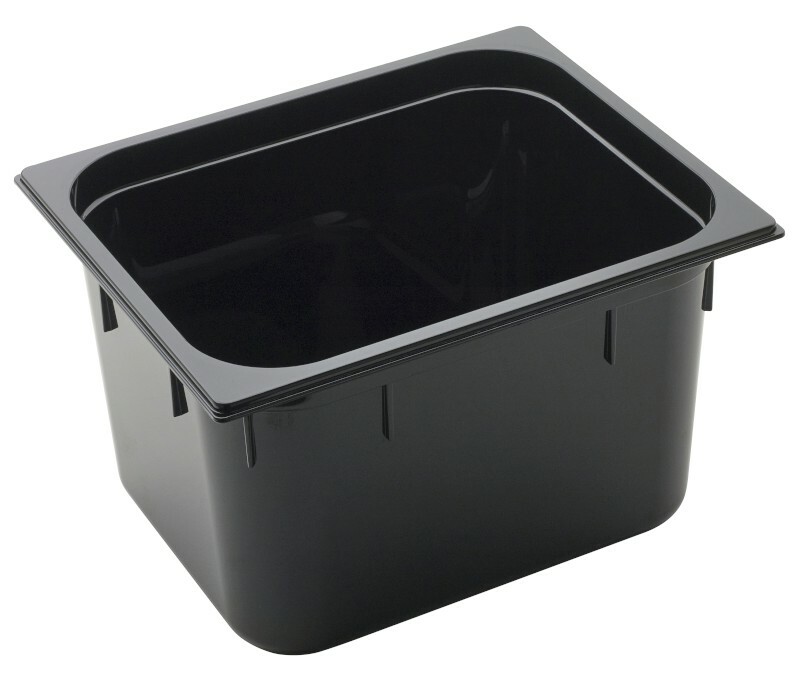 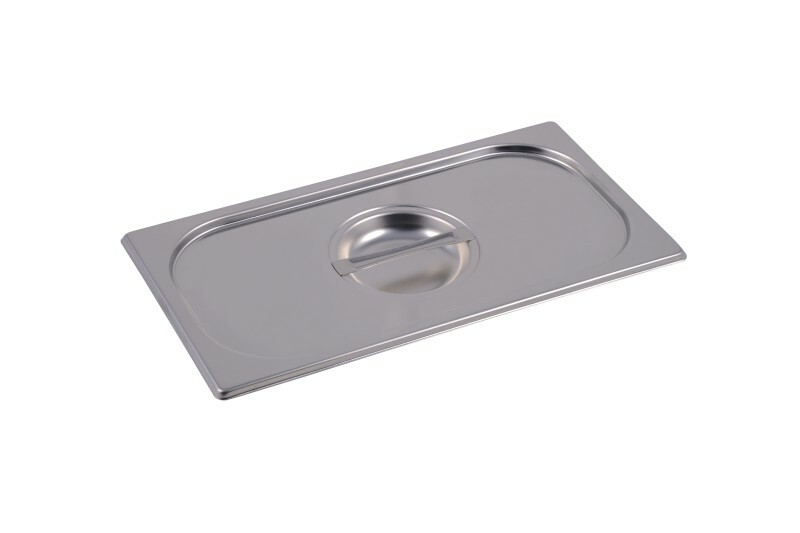 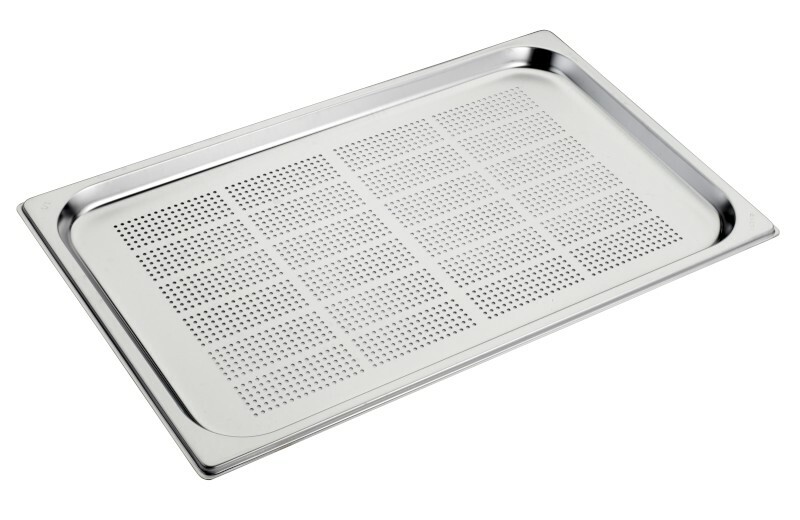 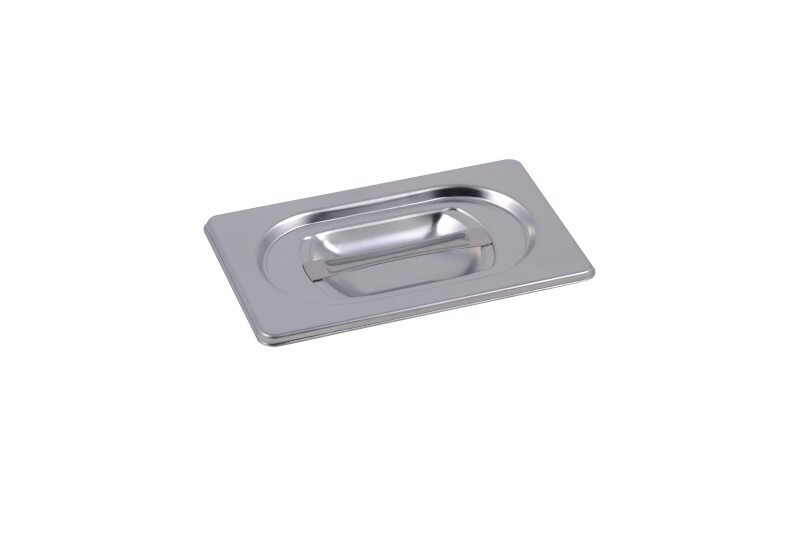 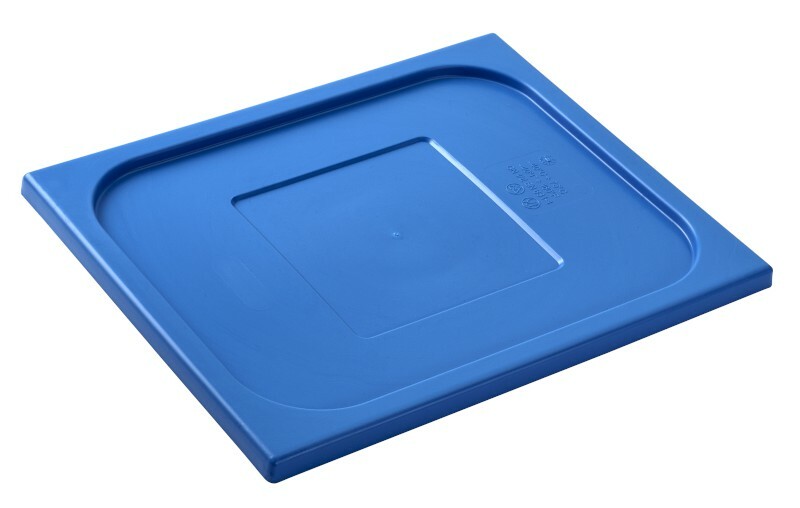 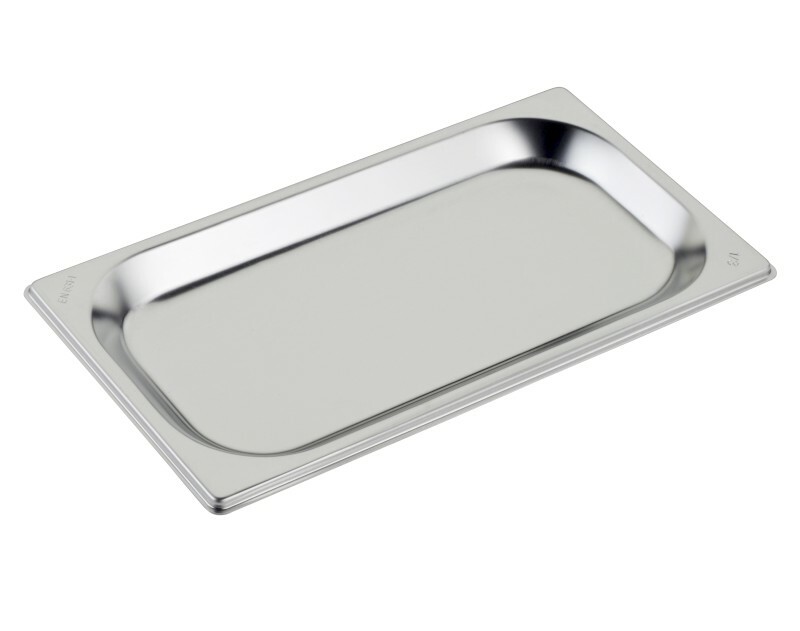 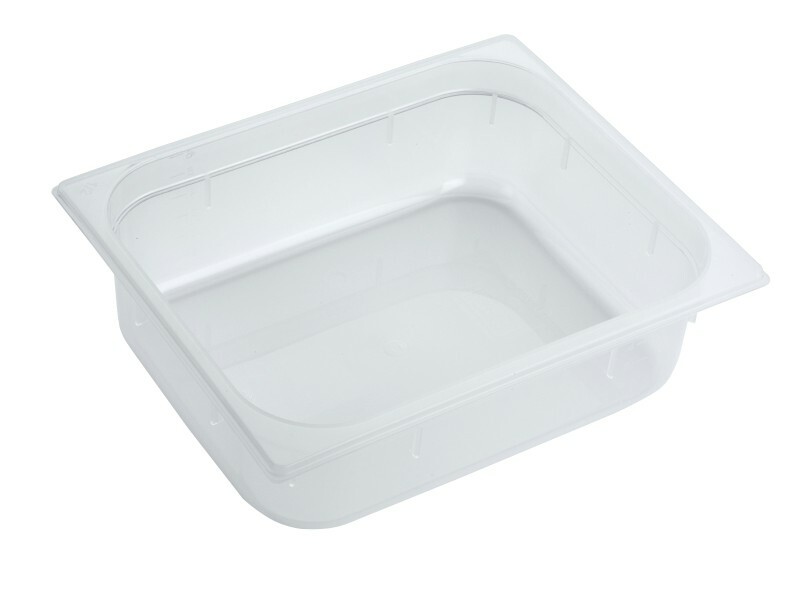 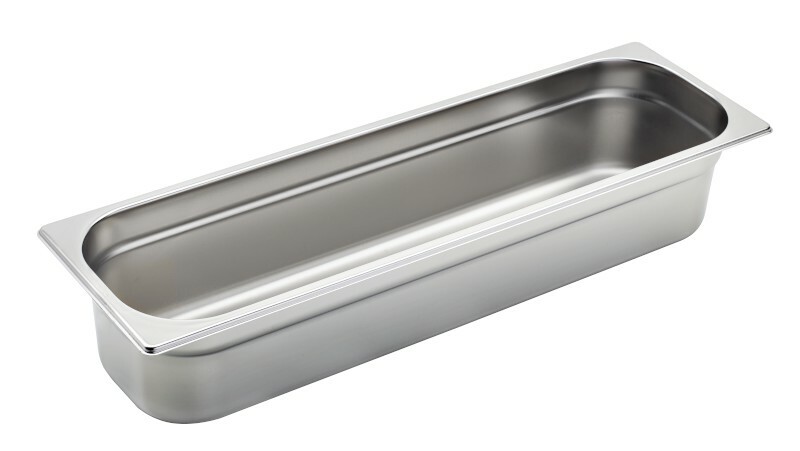 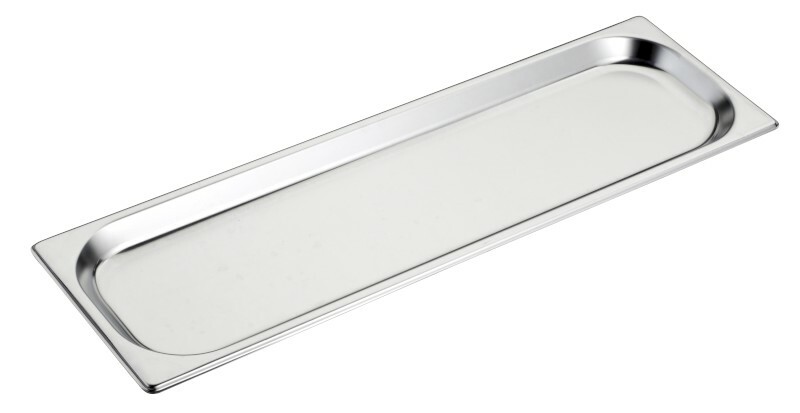 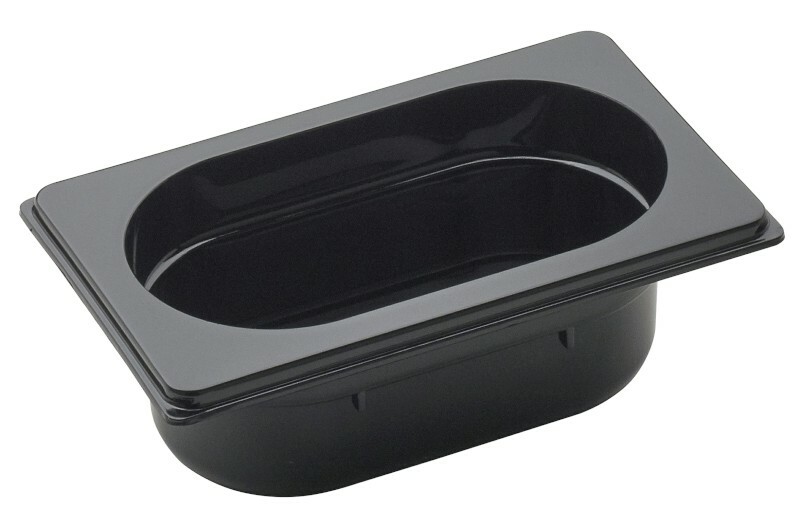 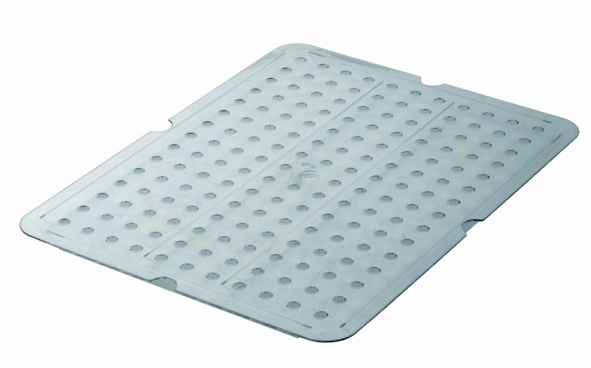 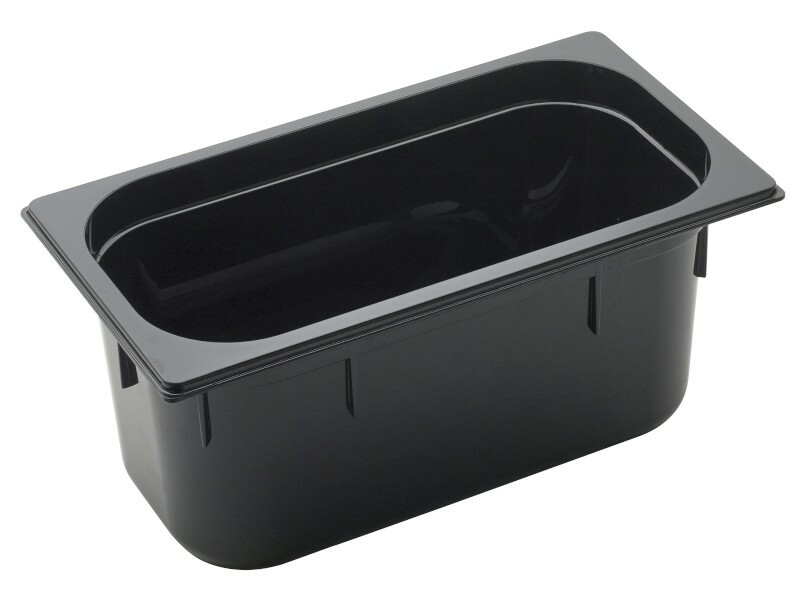 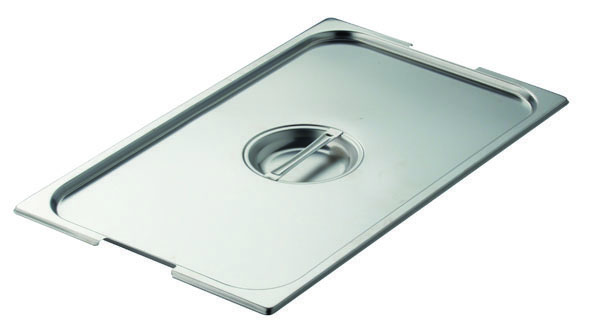 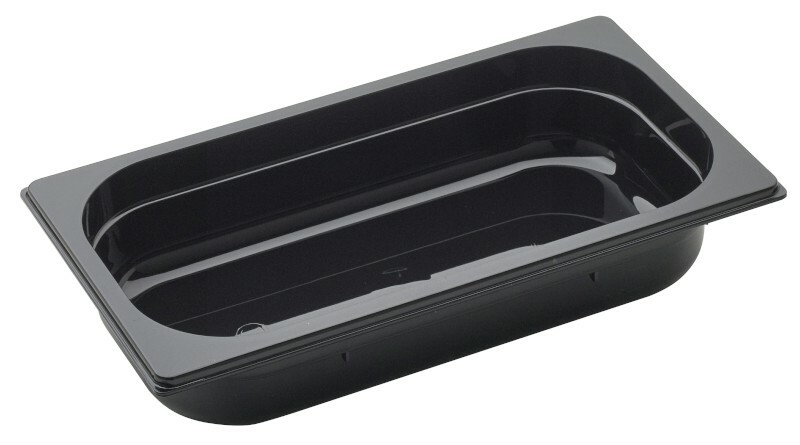 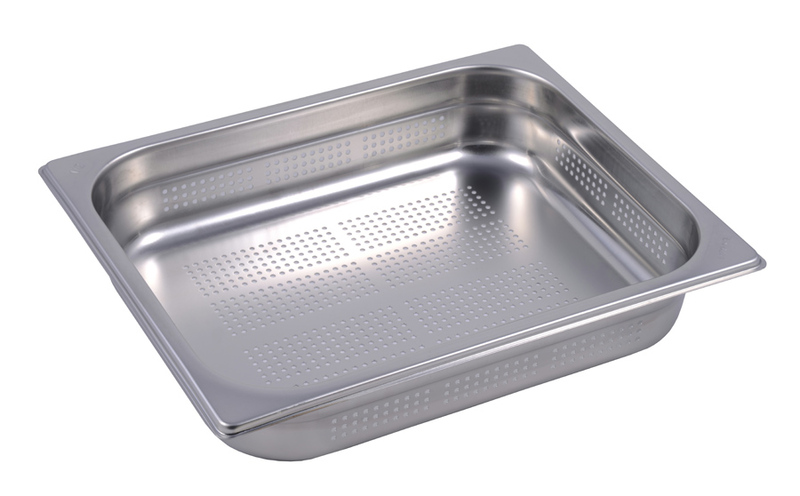 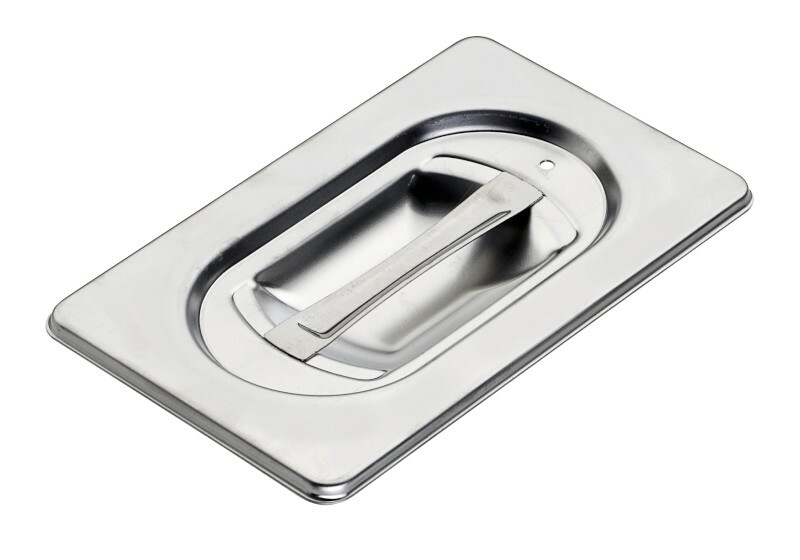 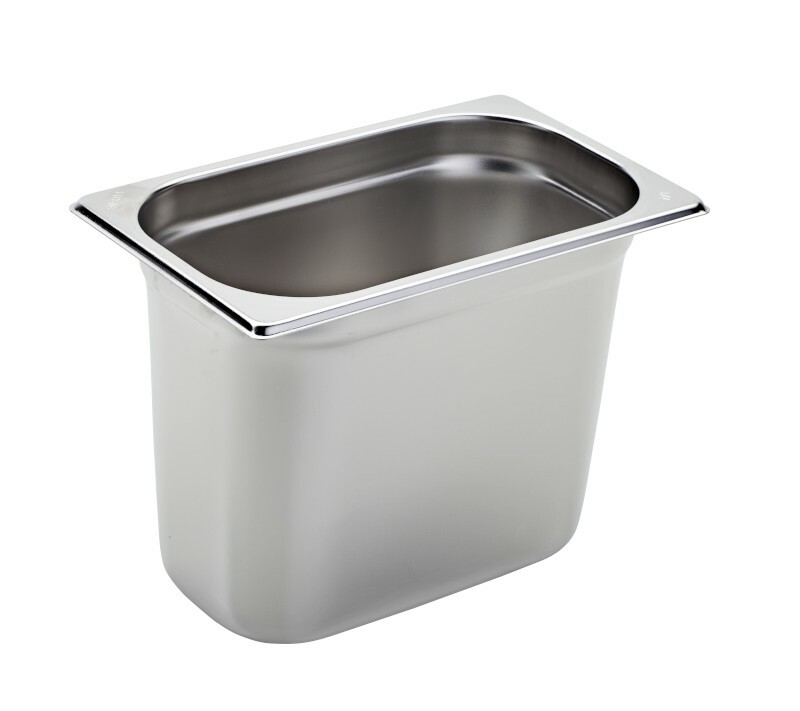 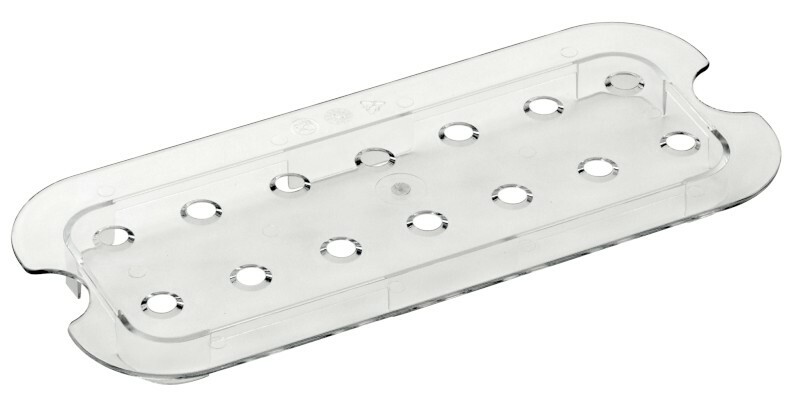 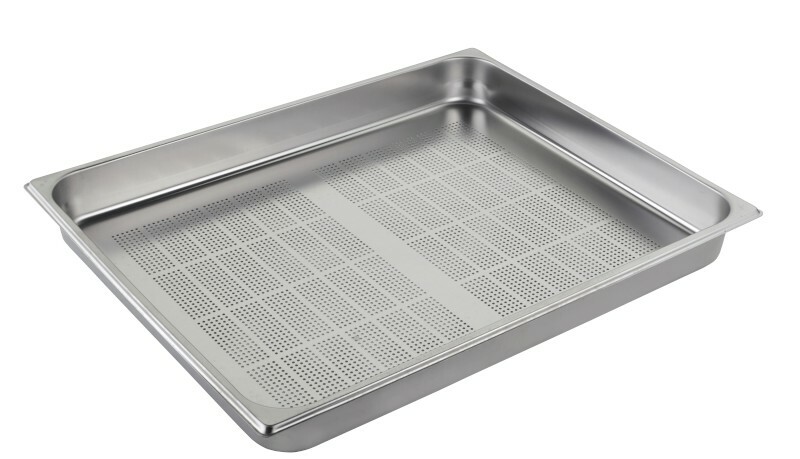 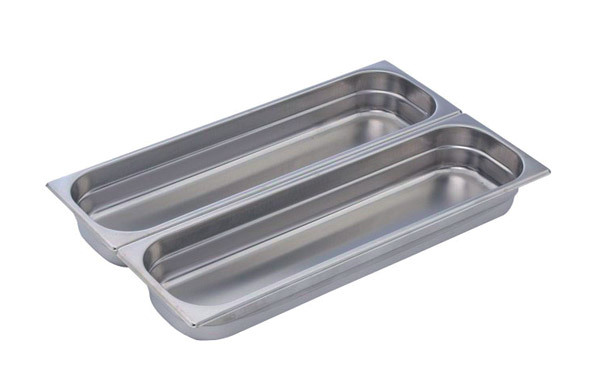 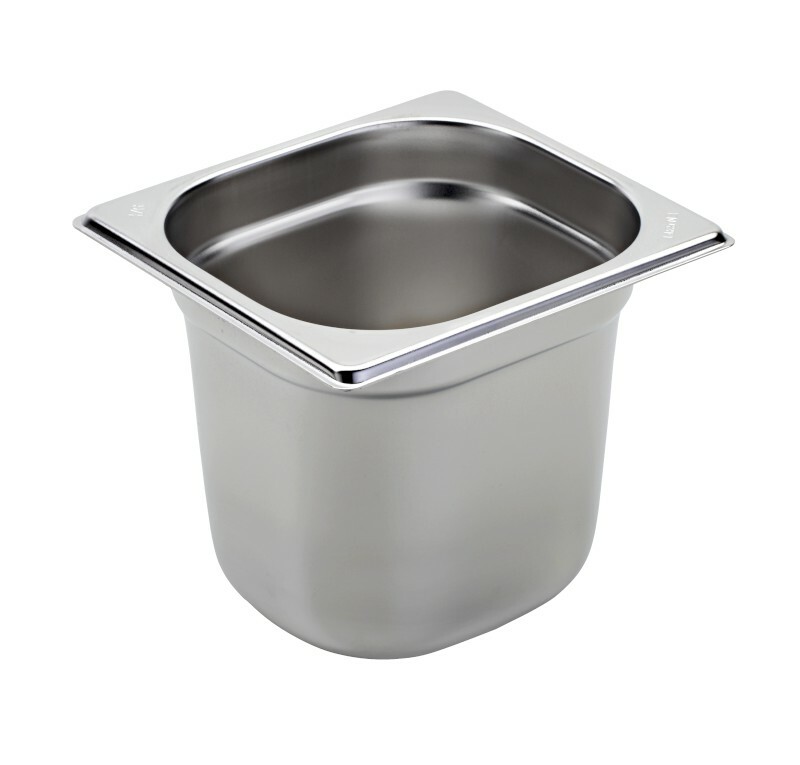 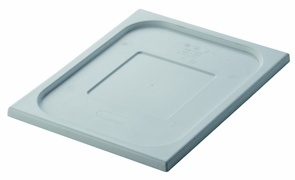 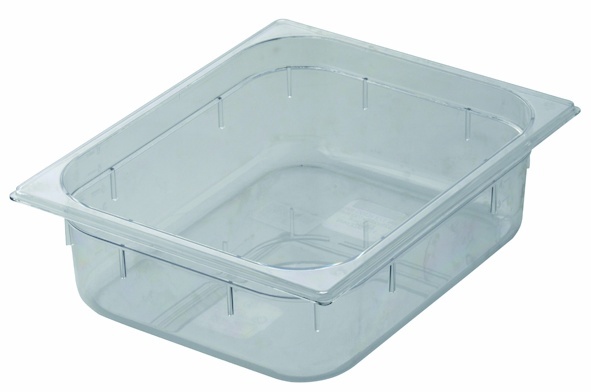 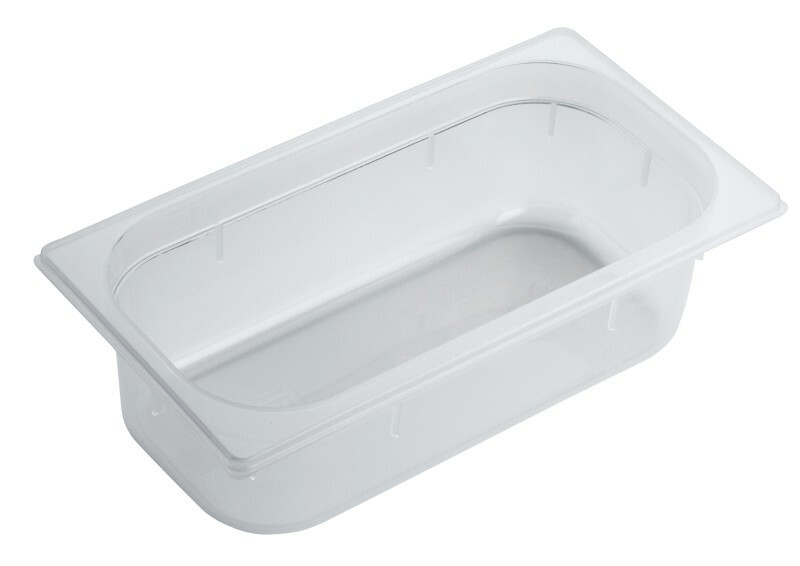 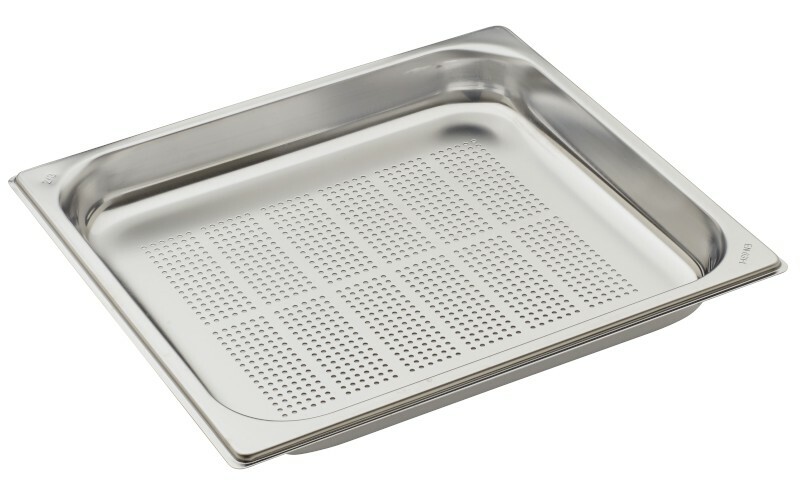 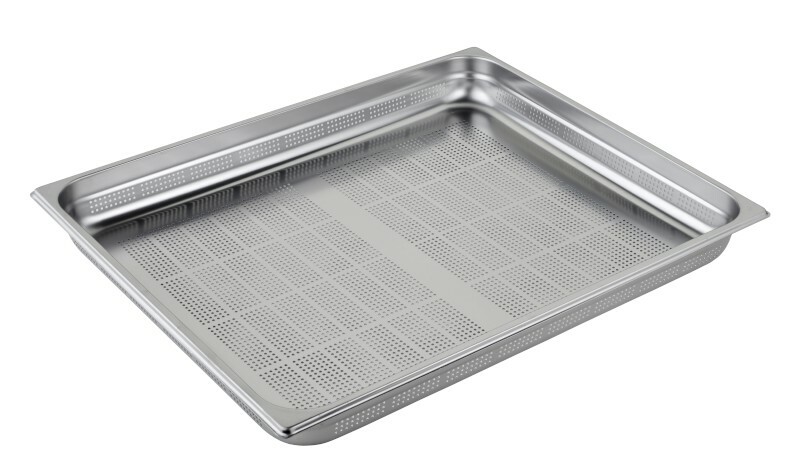 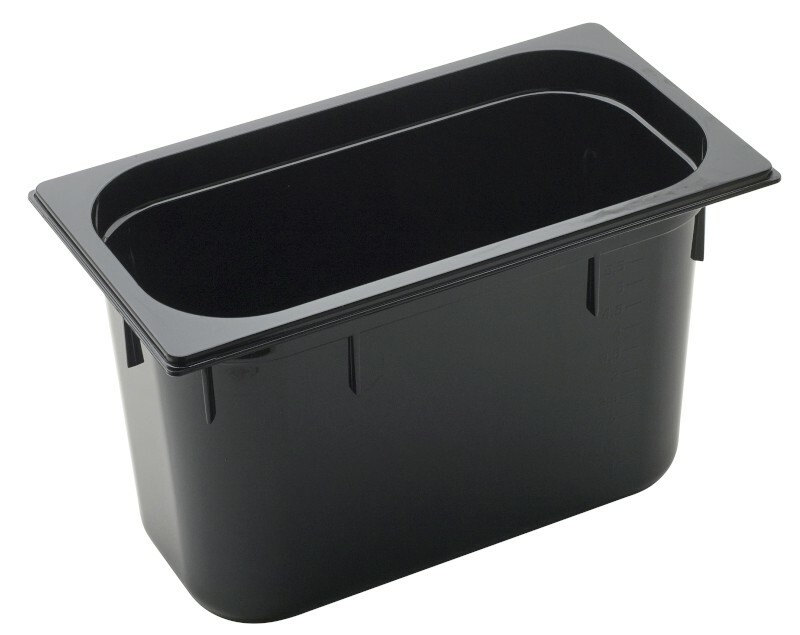 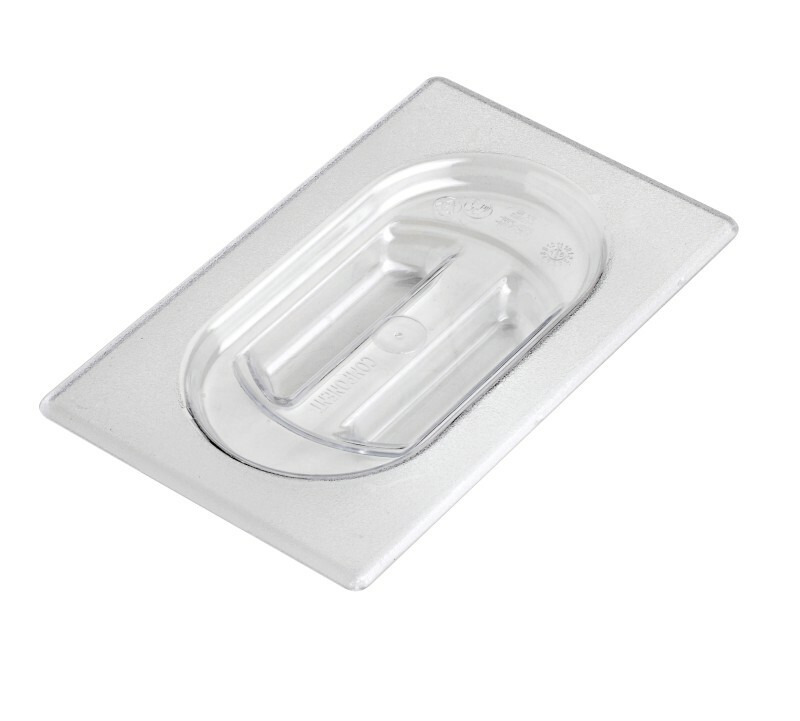 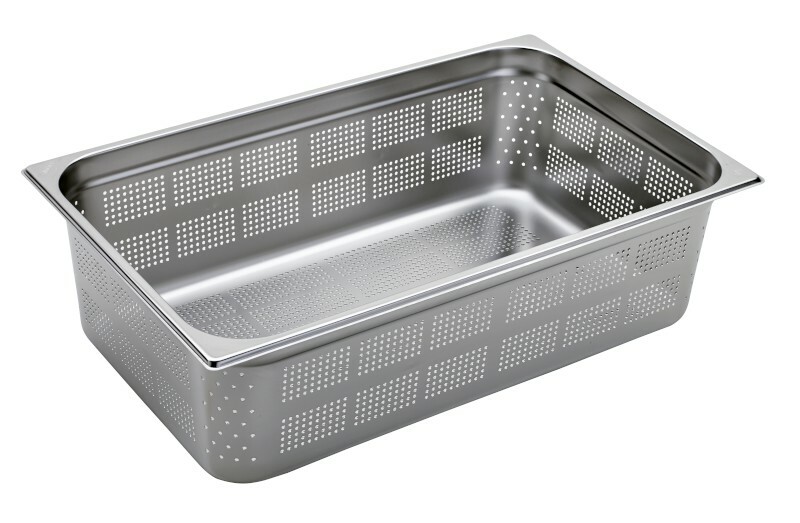 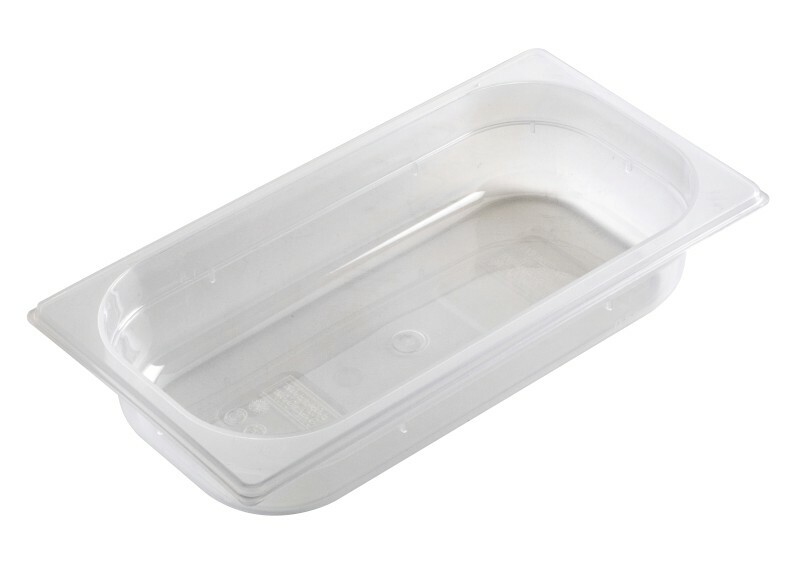 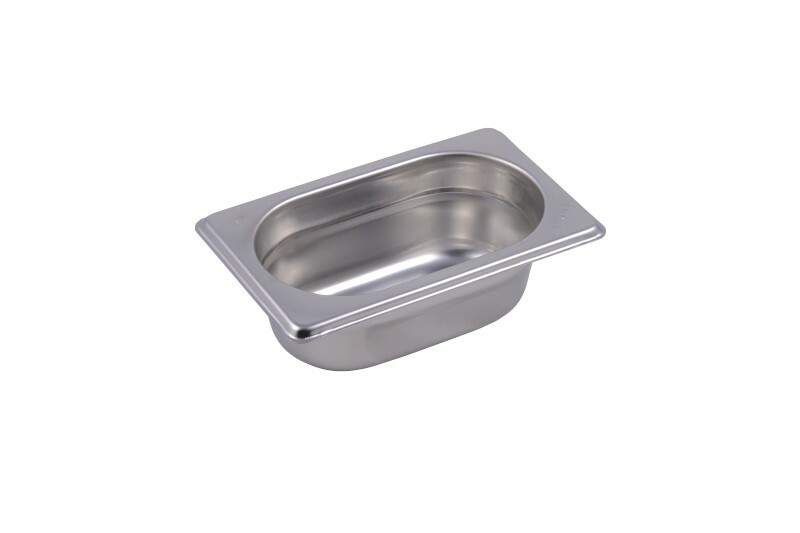 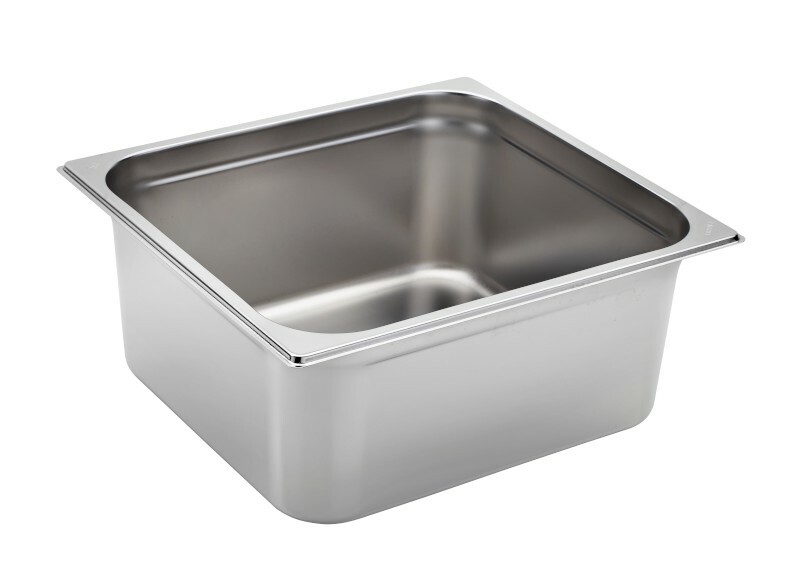 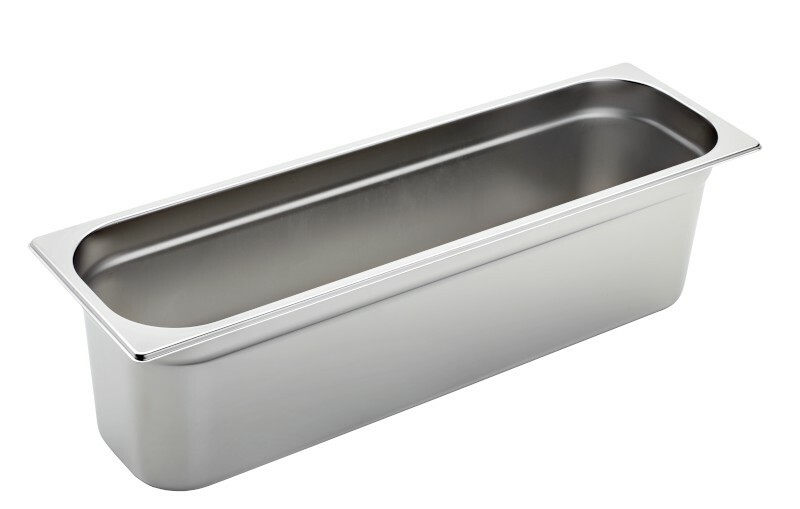 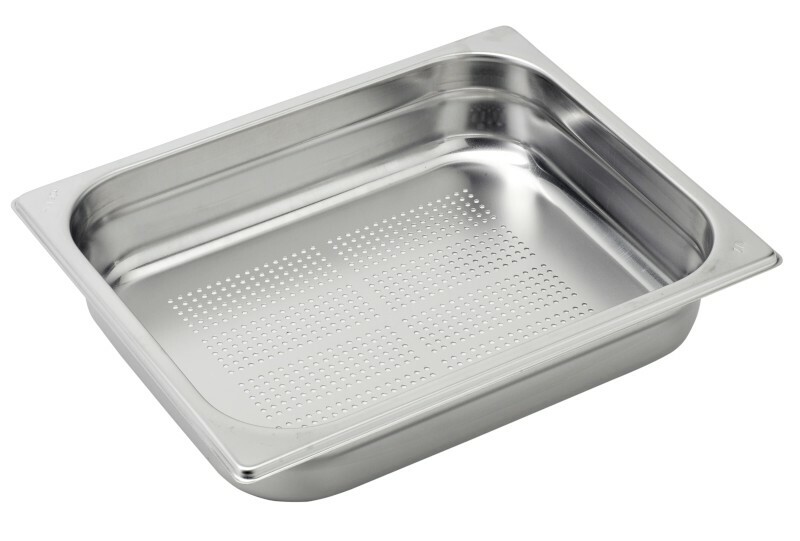 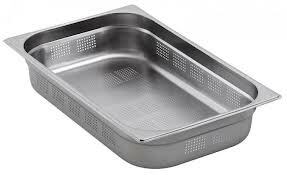 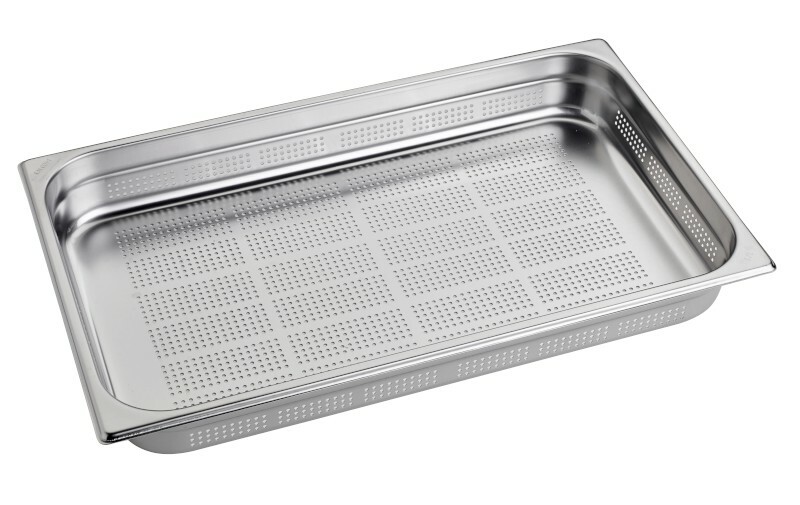 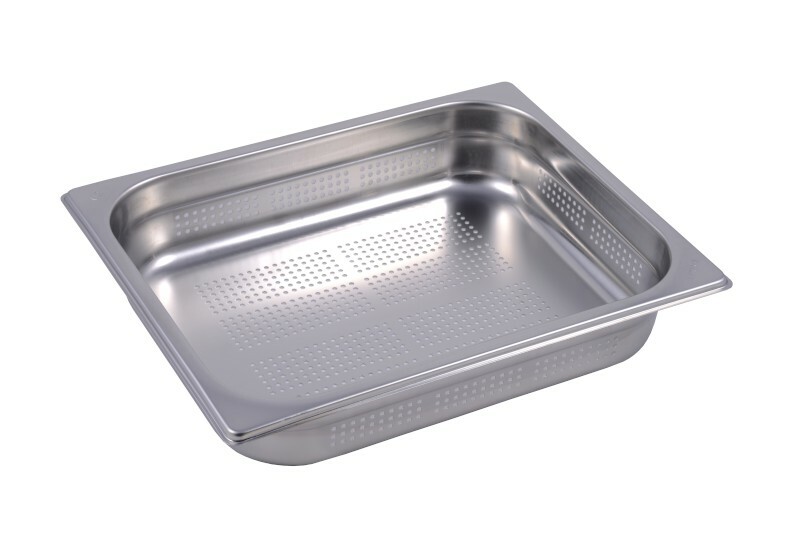 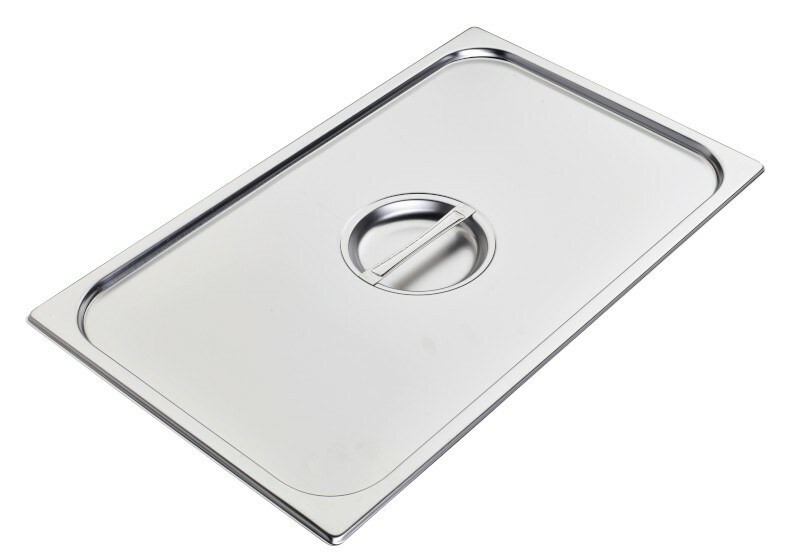 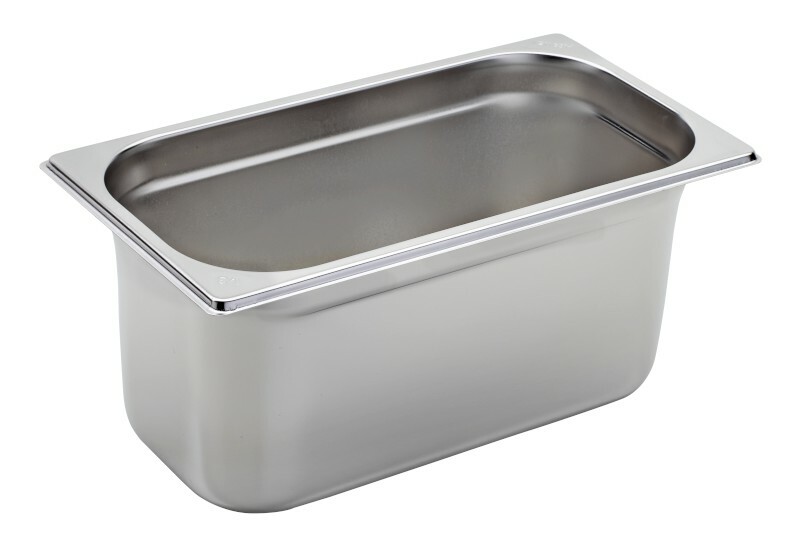 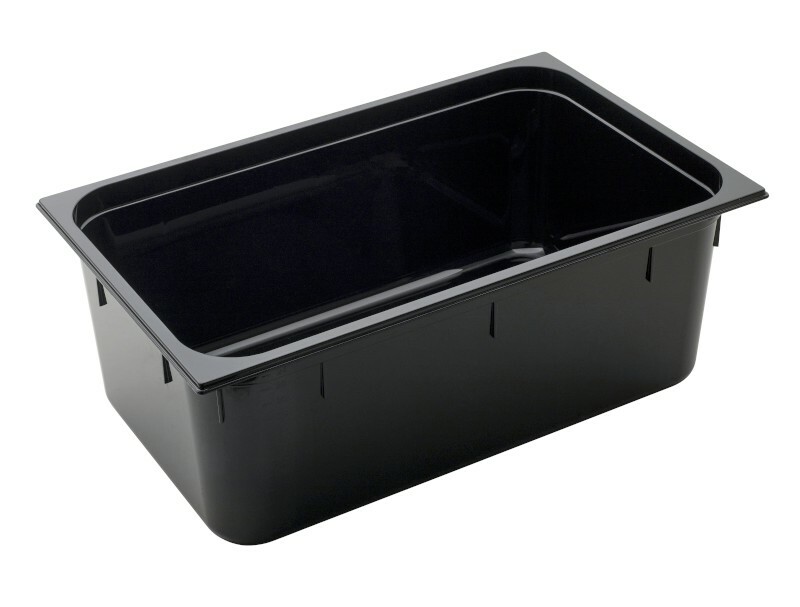 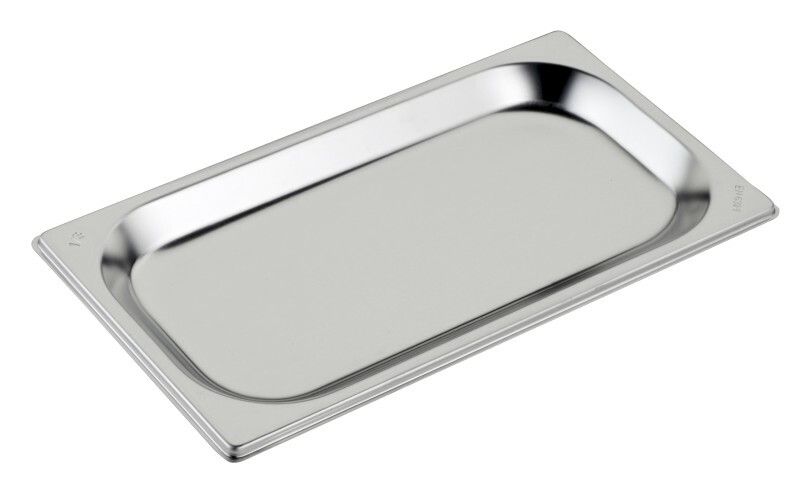 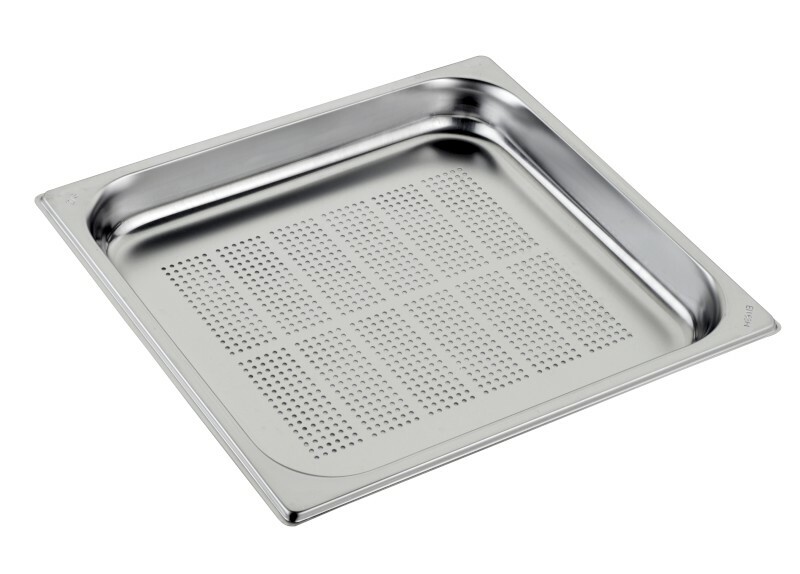 Electrolysis bath for all the height 150 and 200 containers or alternatively for the other sizes; electrolysis, typical for surgical instruments, ensures a shinier and smoother finishing. 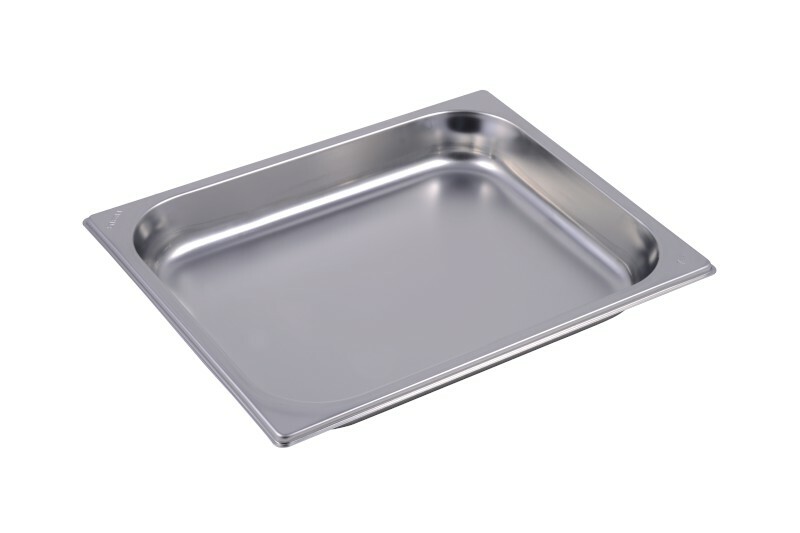 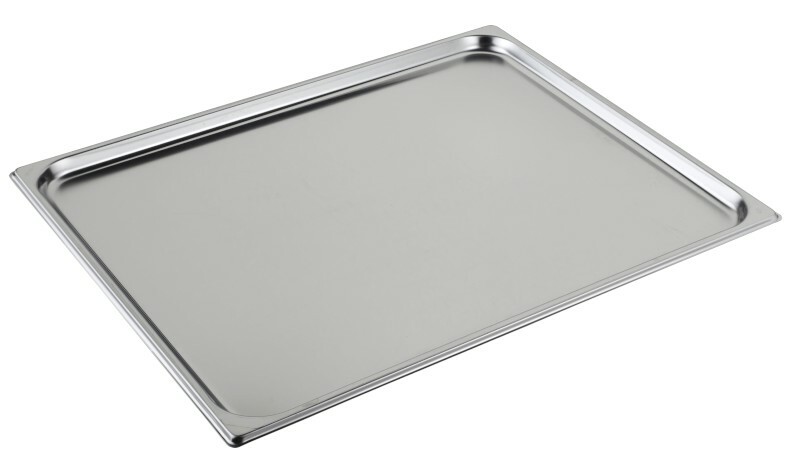 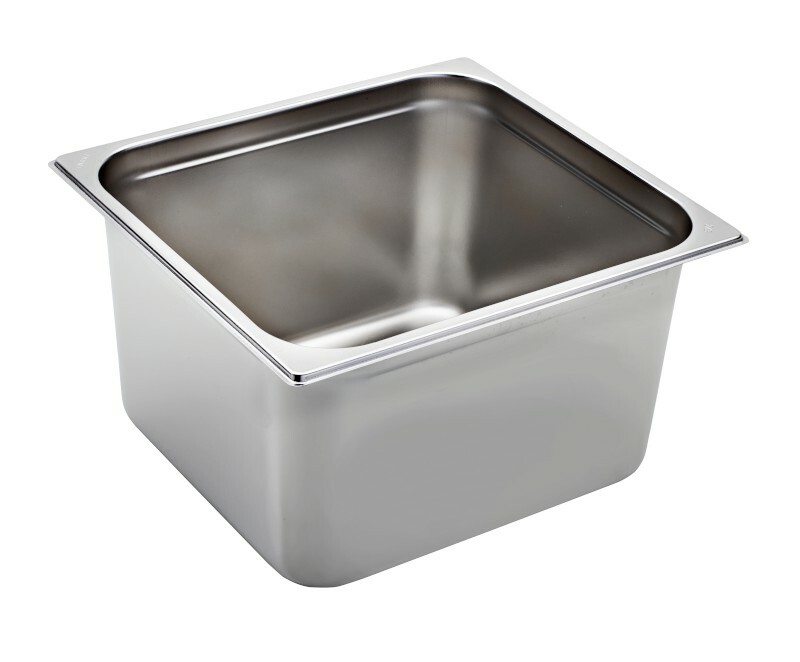 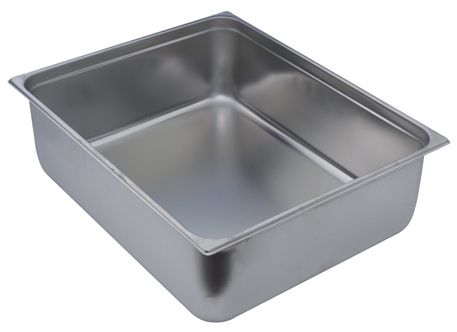 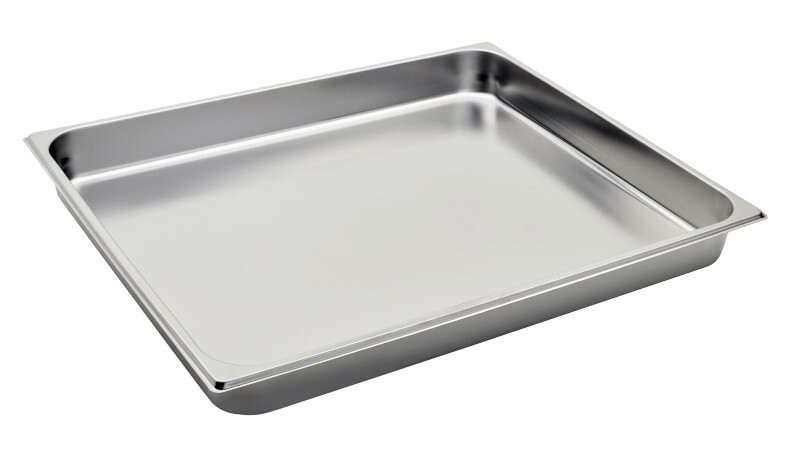 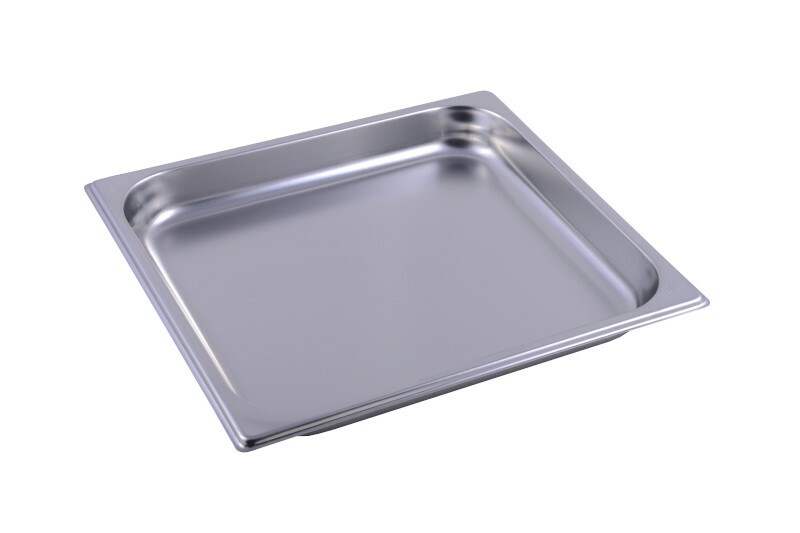 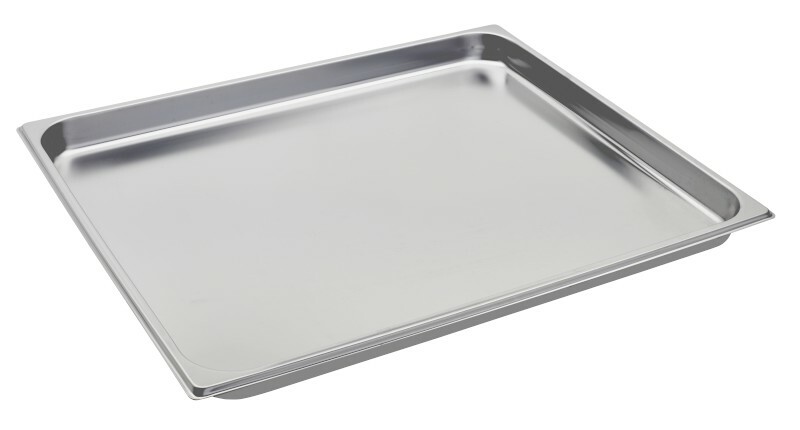 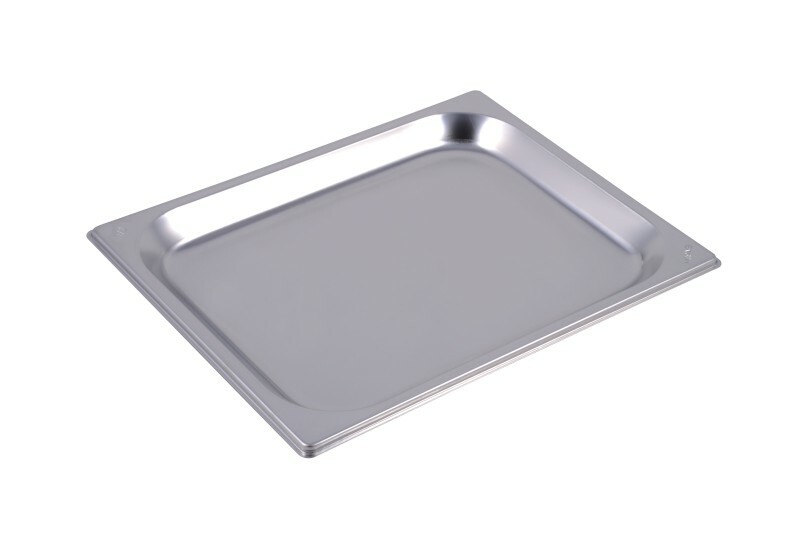 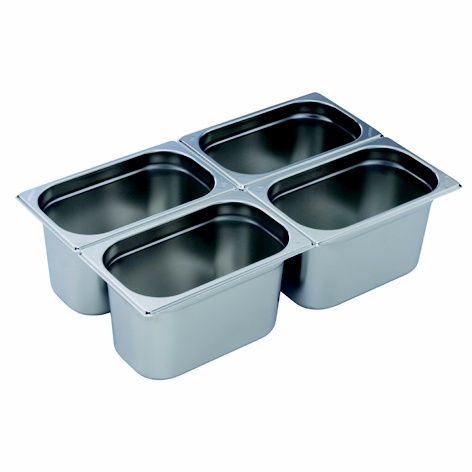 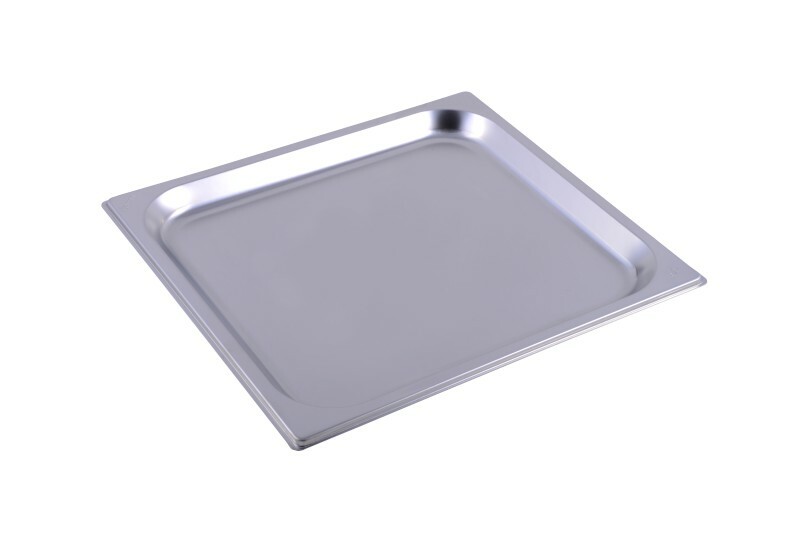 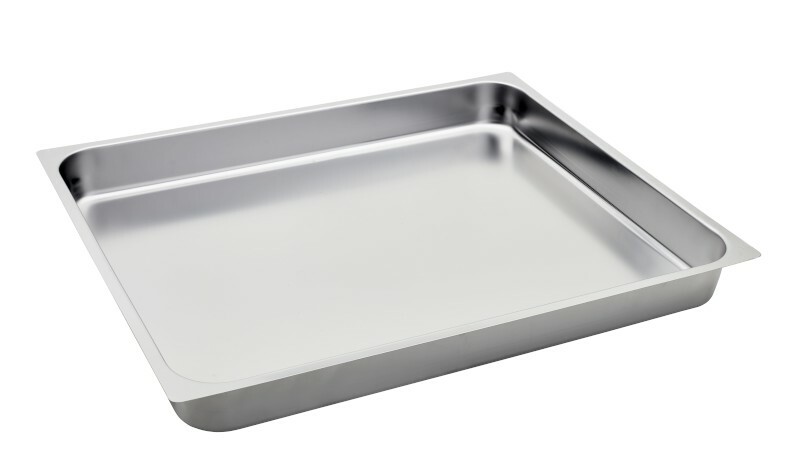 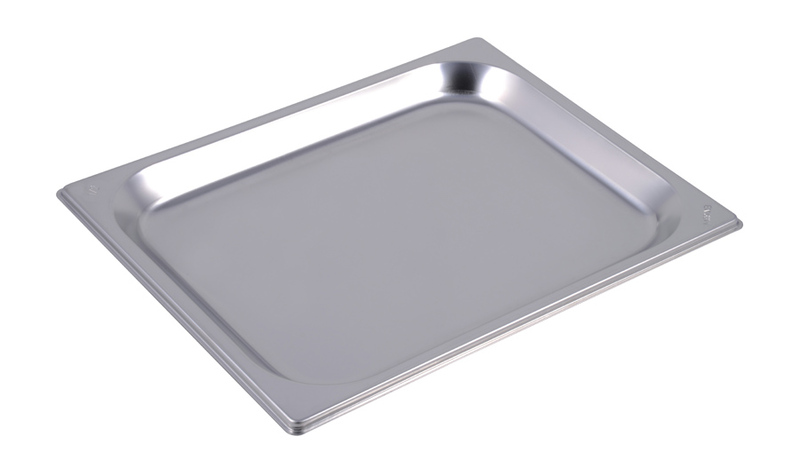 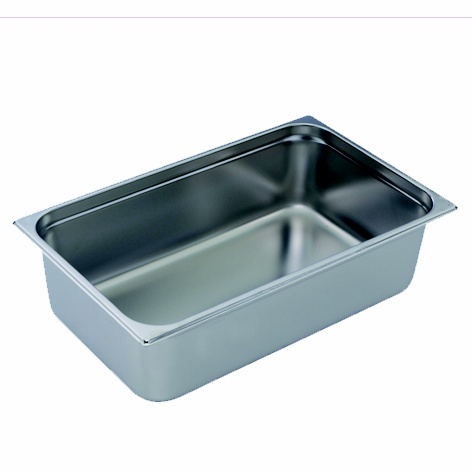 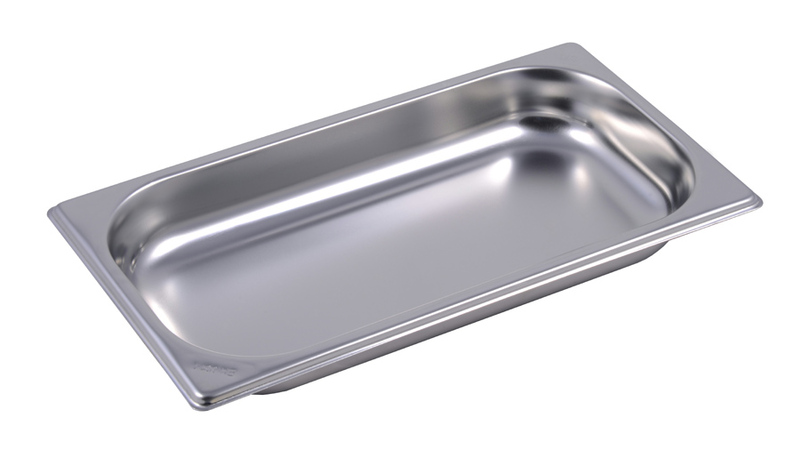 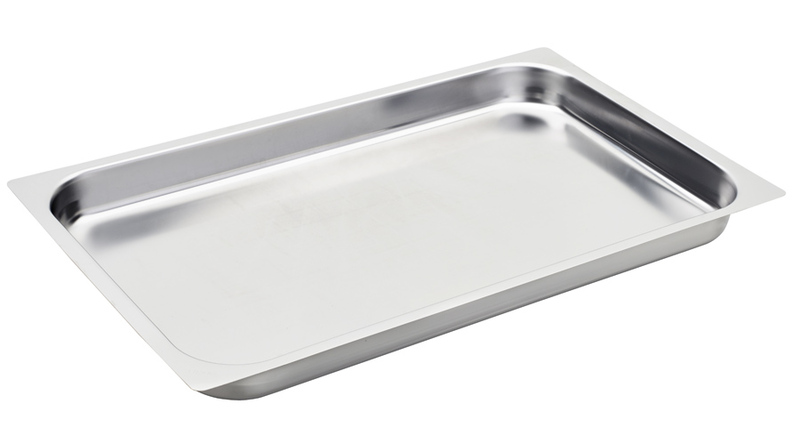 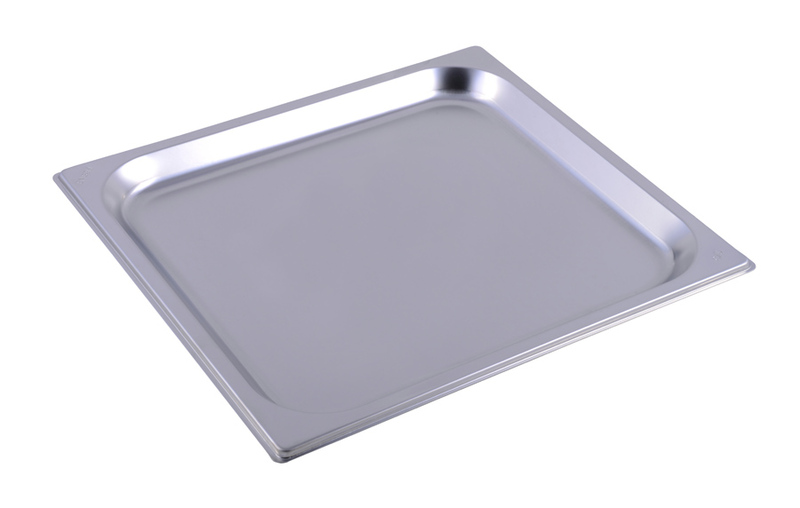 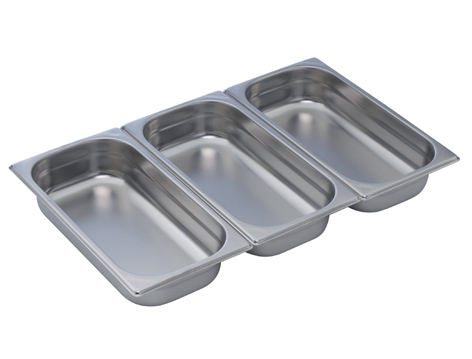 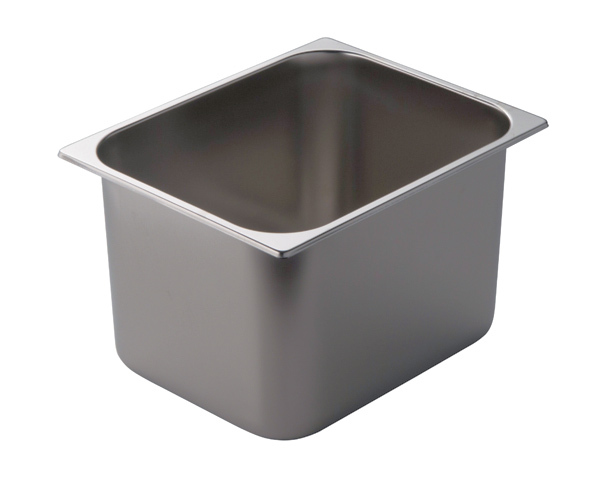 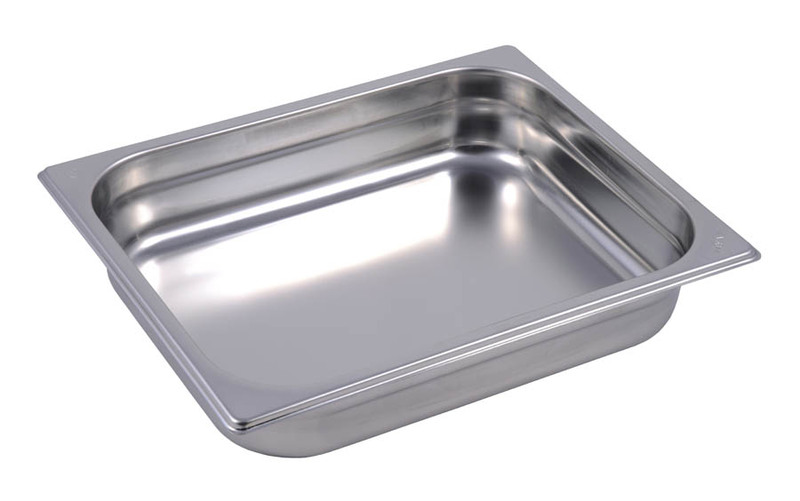 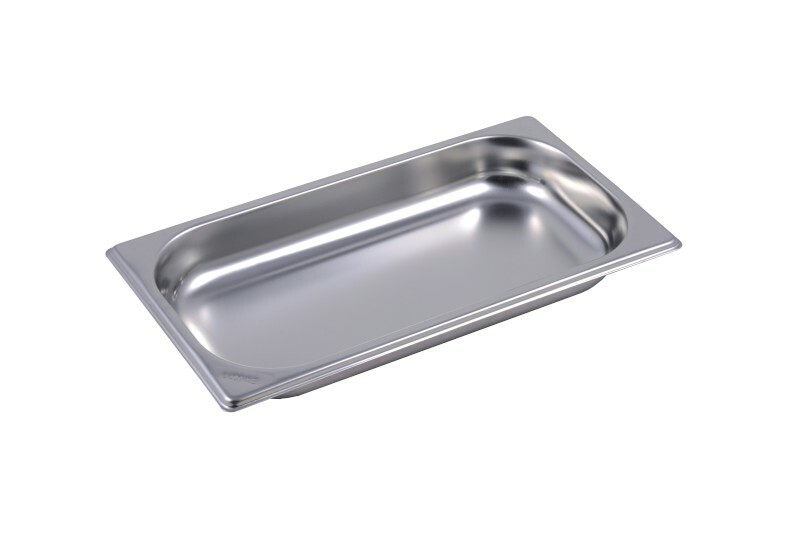 Made in AISI 304 to ensure maximum resistance to corrosion, a high quality genuine steel perfect for food contact. 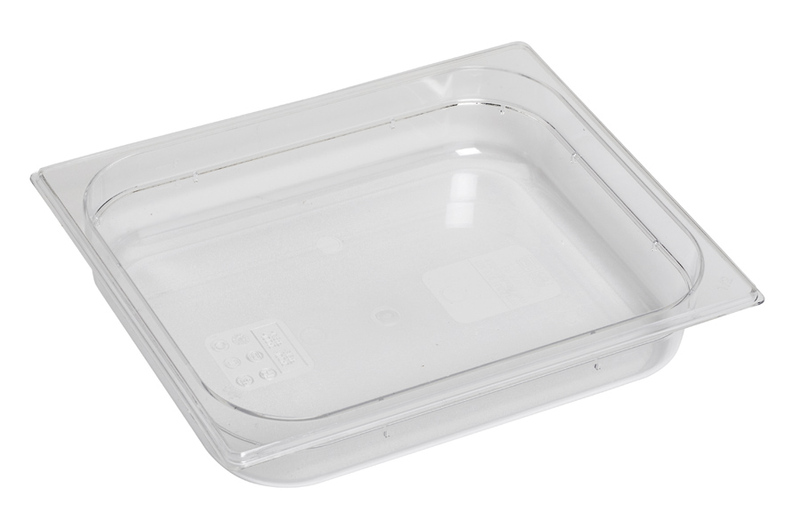 Every piece is checked and packed in bags one by one to preserve the surface and the cleaning. 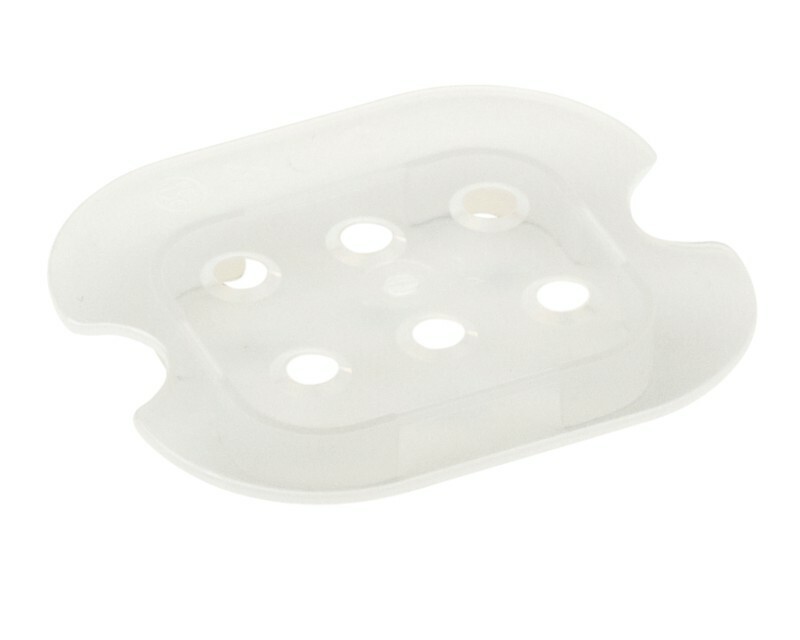 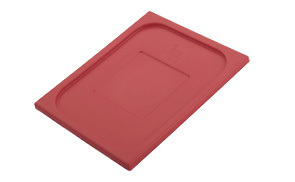 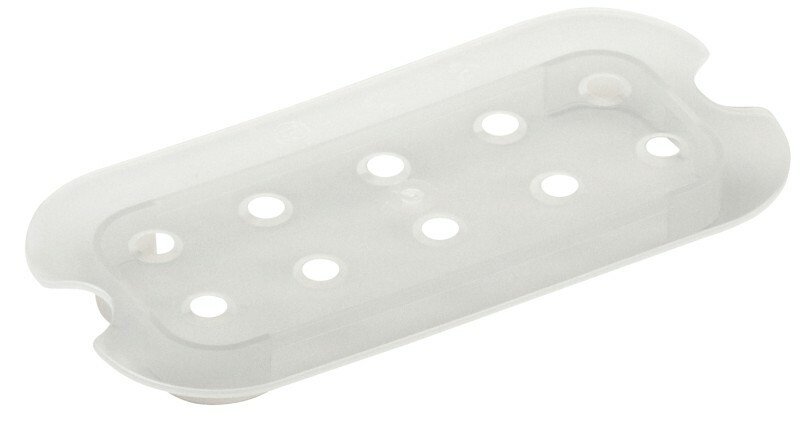 Resistant gasket up to 170°C; it is recommended to use them at lower temperatures for a better endurance over time. 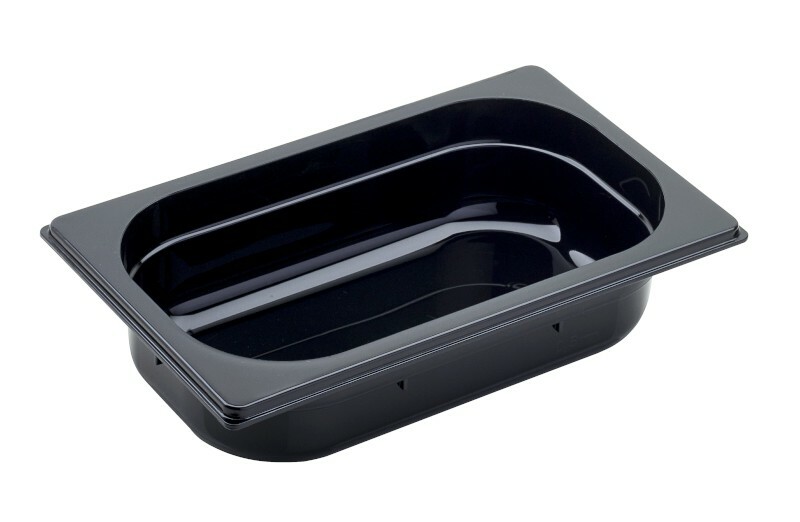 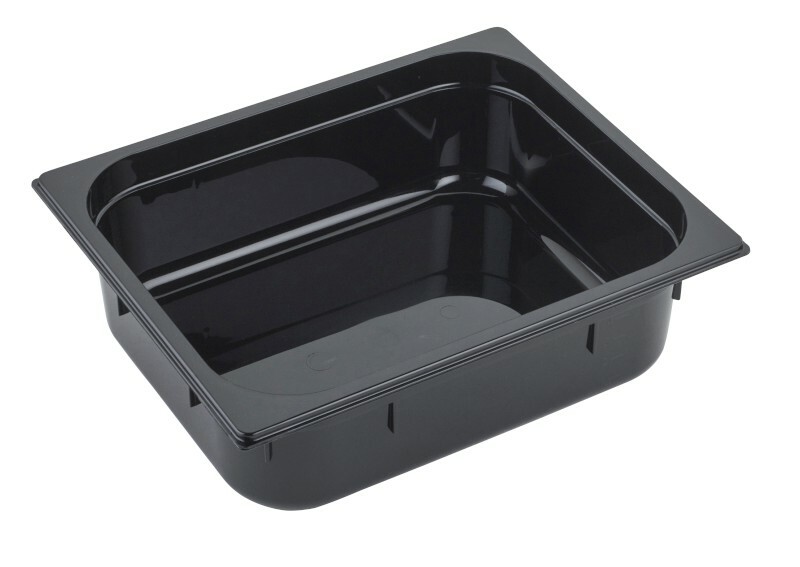 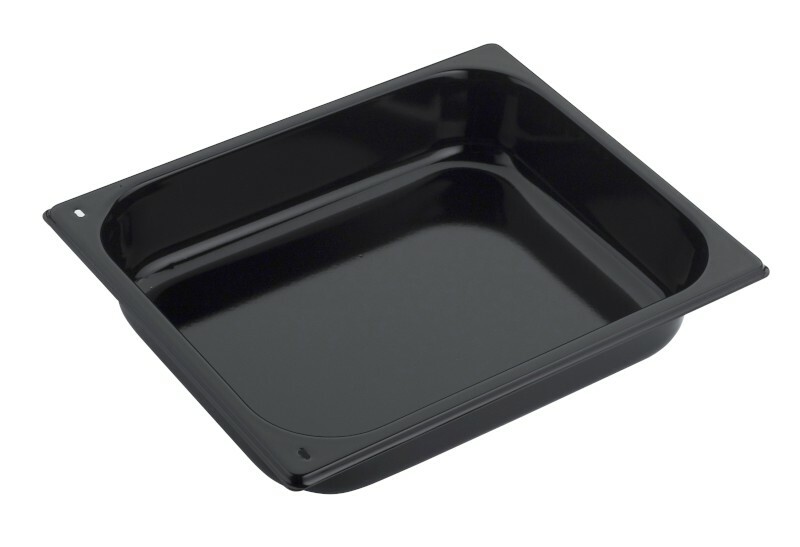 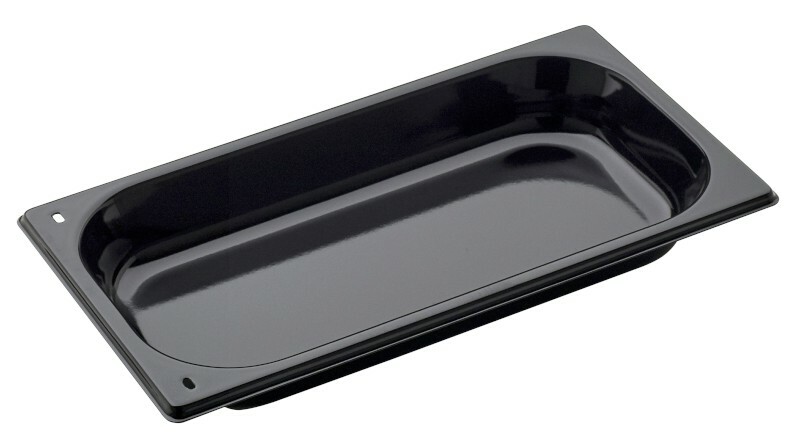 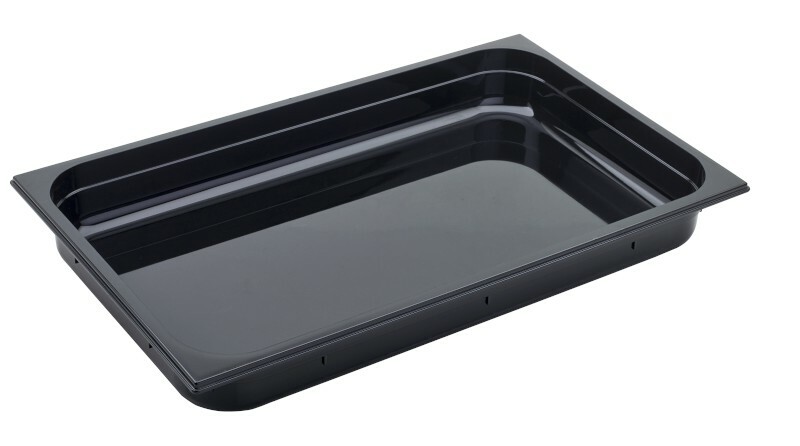 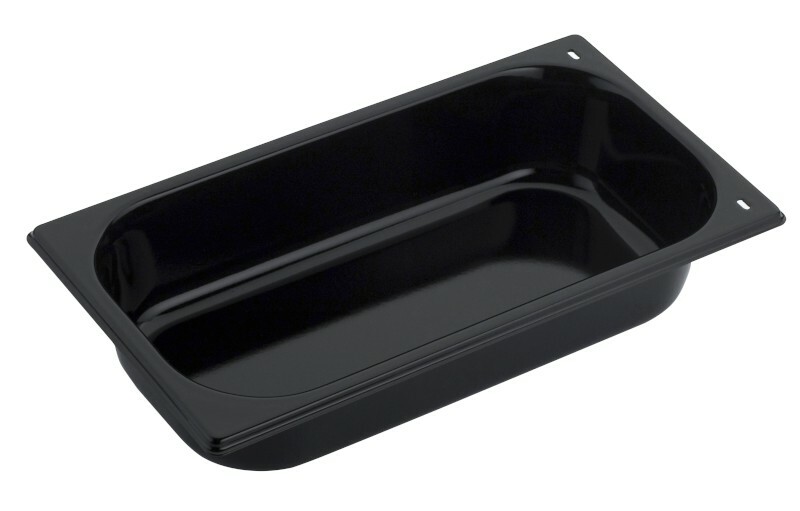 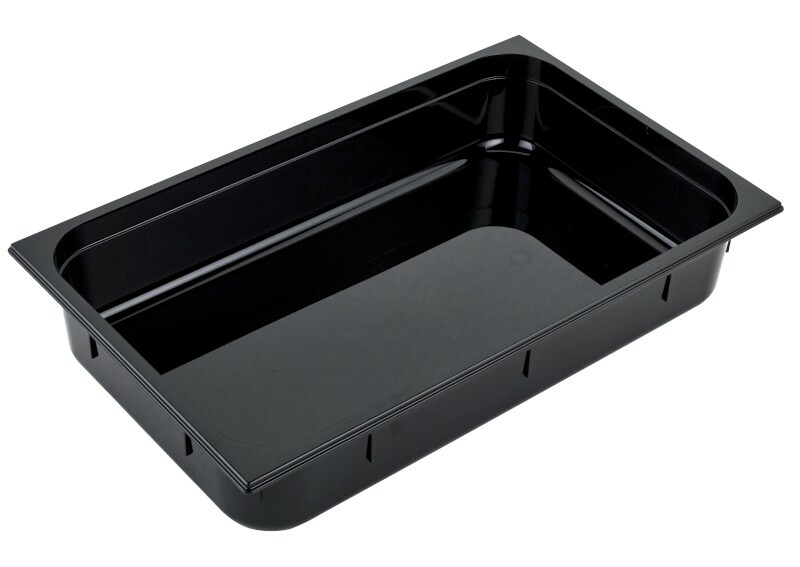 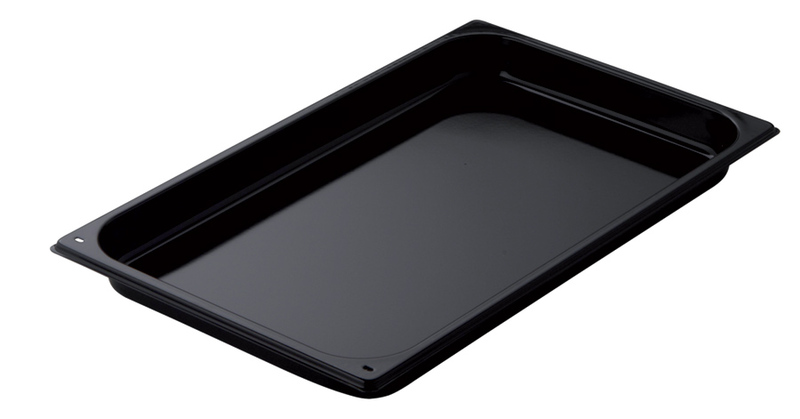 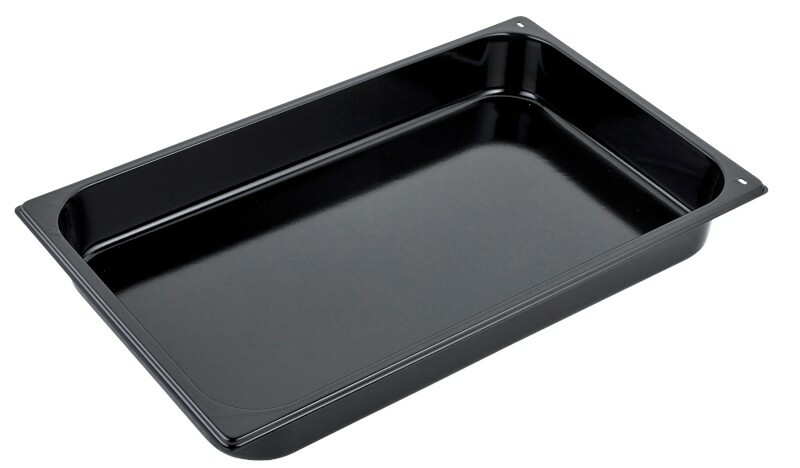 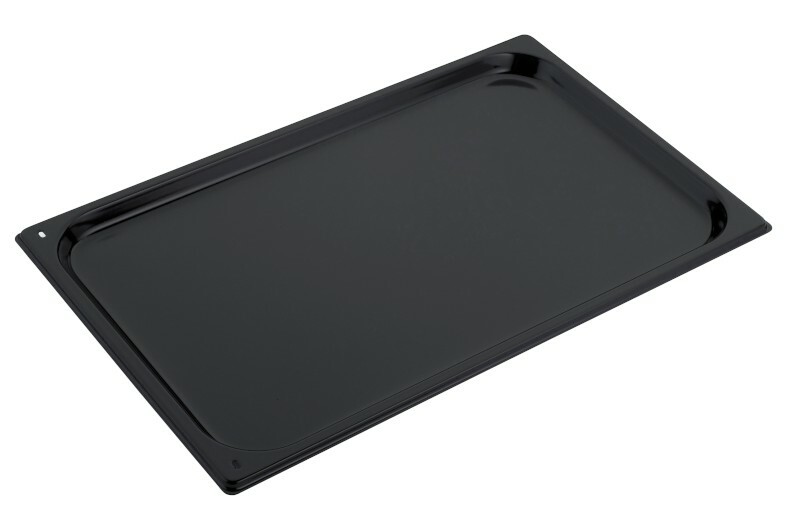 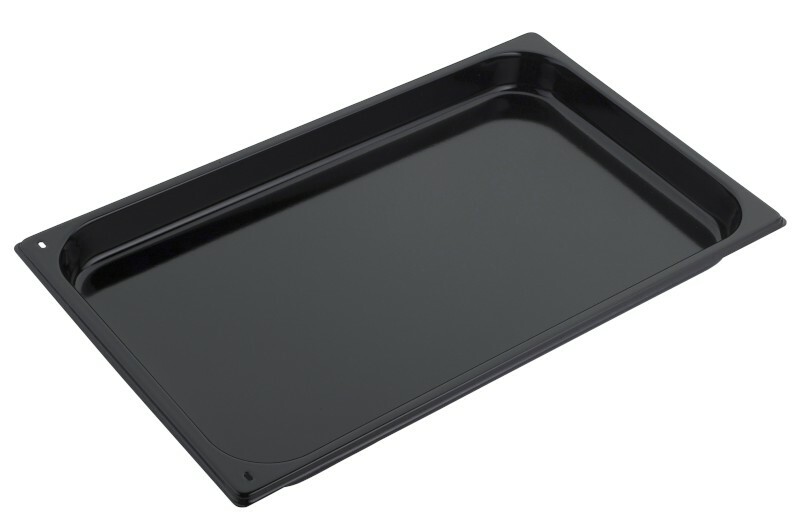 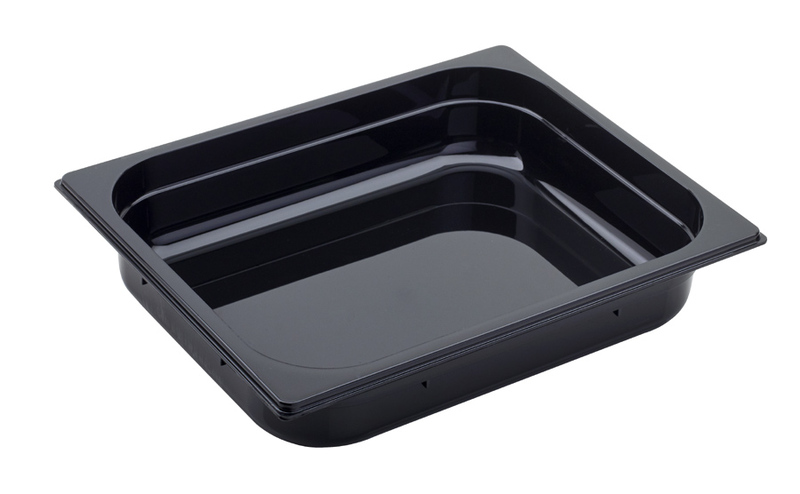 These Gastronorm trays are not only ideal for cooking, with their high thermal conductivity, but also for serving food to the table, thanks to their elegant, glossy black appearance and their smooth and refined surface. 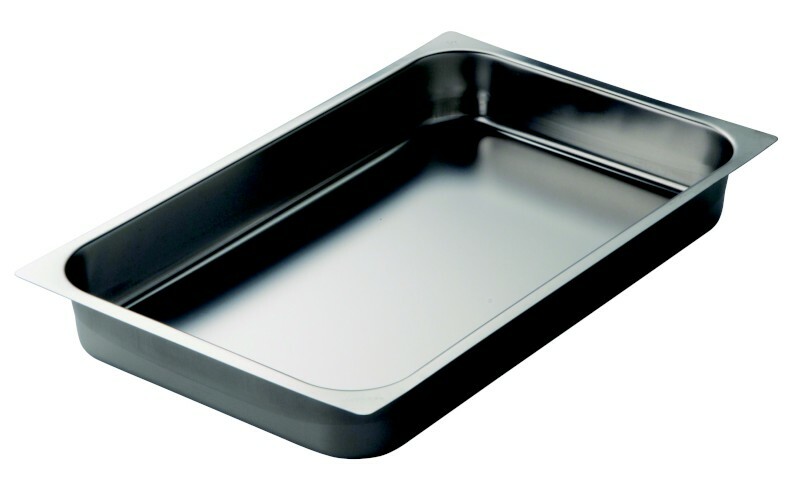 The enamel, applied at 800°C, sticks perfectly to the metal, bringing it to a solid thickness of 1.2mm. 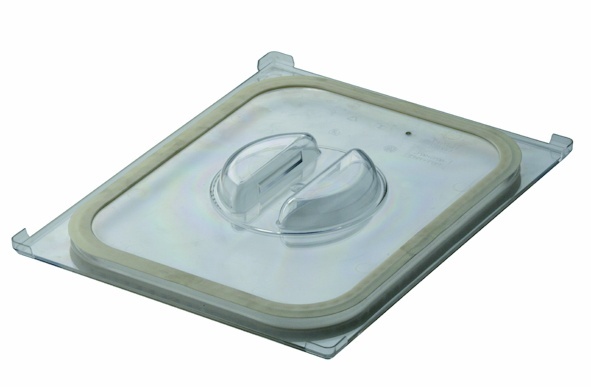 This makes the product robust and resistant, both against impacts and heat surges. 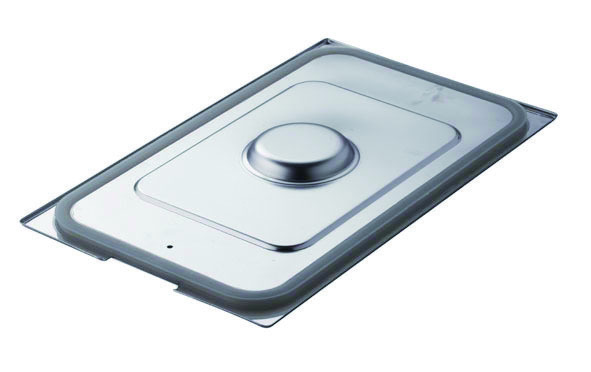 The surface is resistant to scratches and things slide easily on it, which allows a user to work on it without fear e.g. 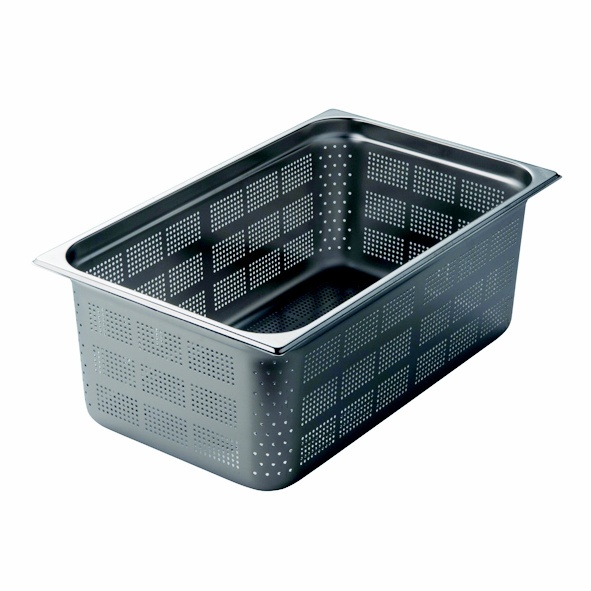 dividing food into portions with fork and knife, and allows one to clean it with ease, both manually or in the dishwasher. 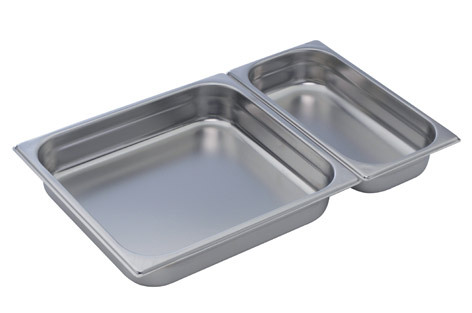 Rigorously tested, they’re harmless even after prolonged contact with aggressive food, thermal shocks and the many impacts that are common in the everyday kitchen life. 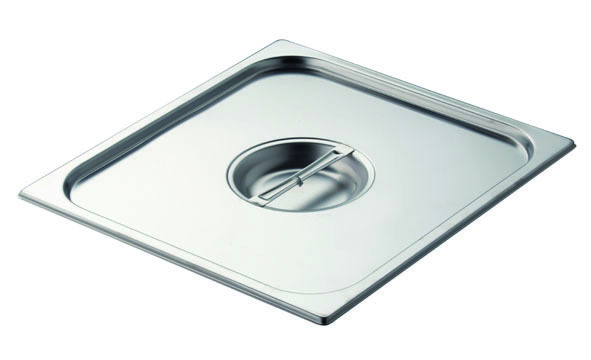 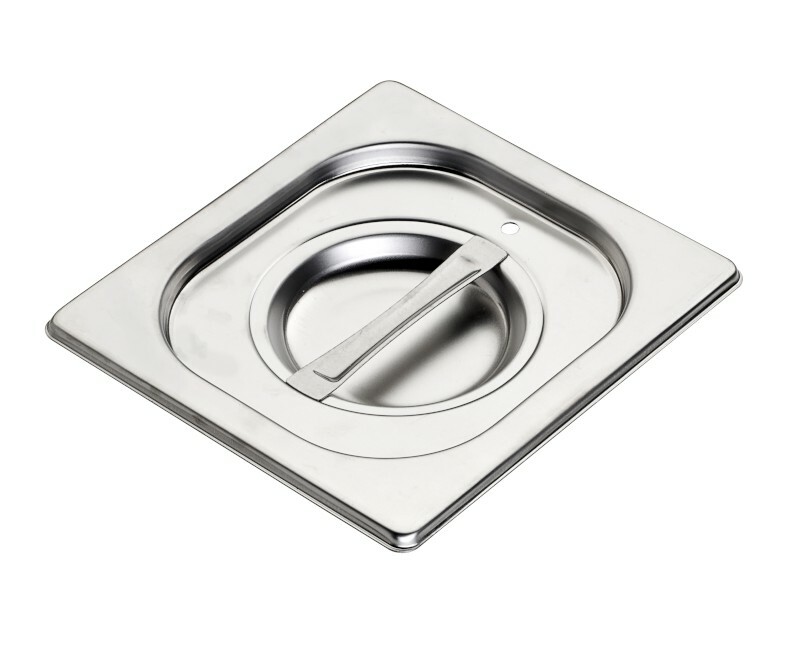 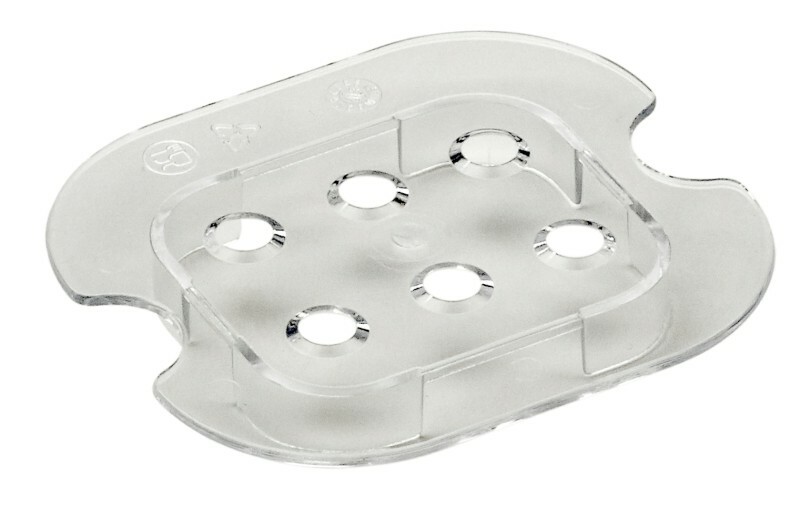 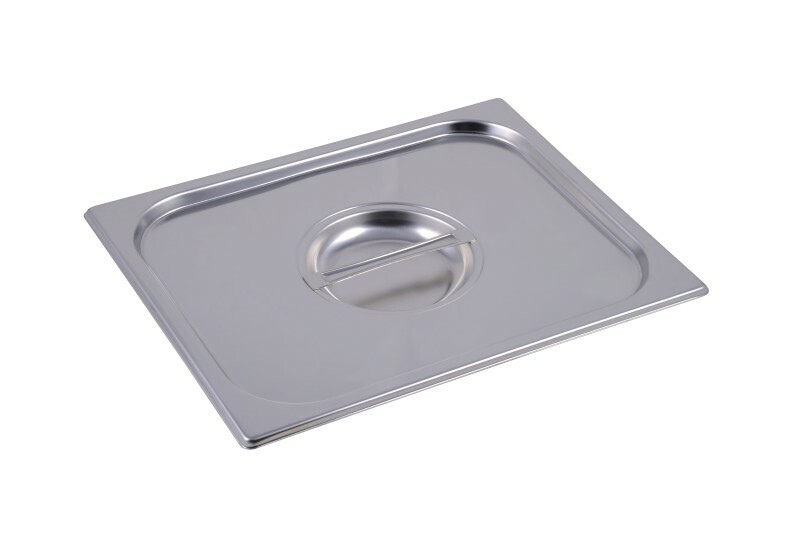 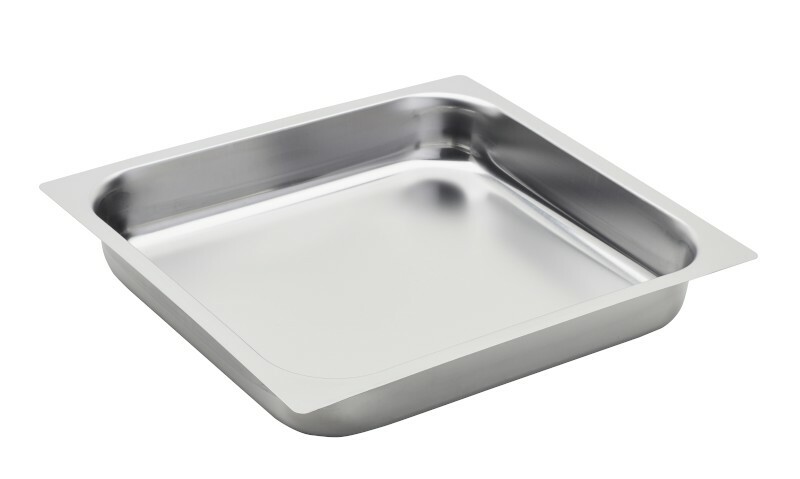 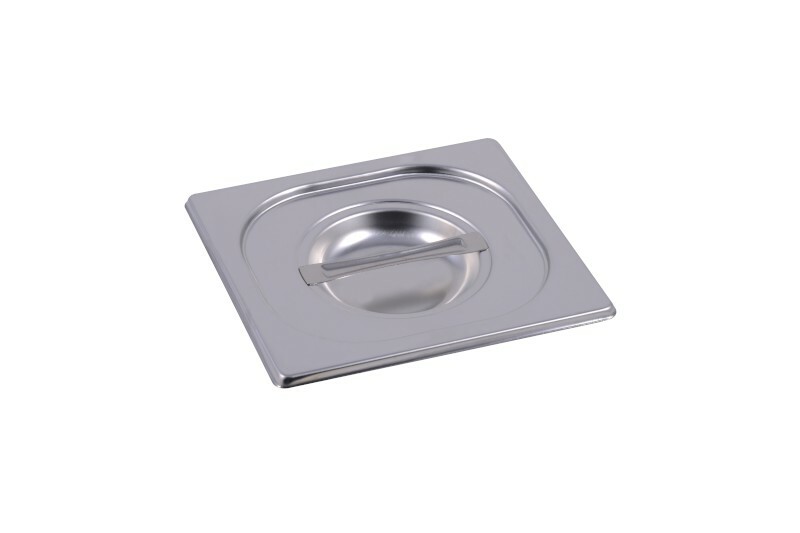 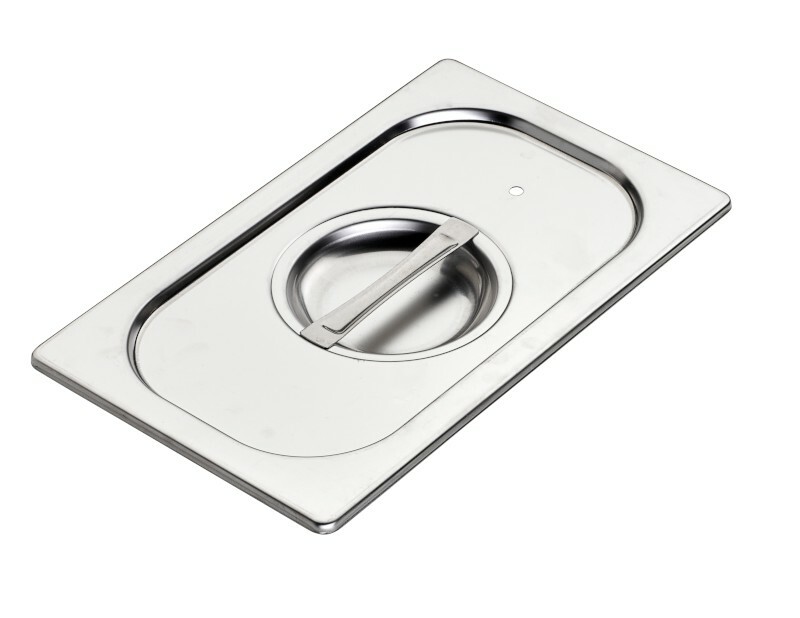 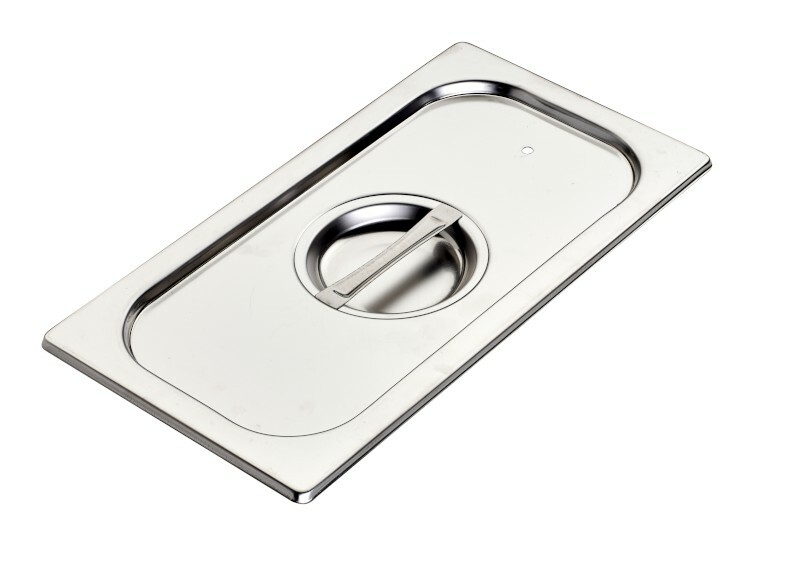 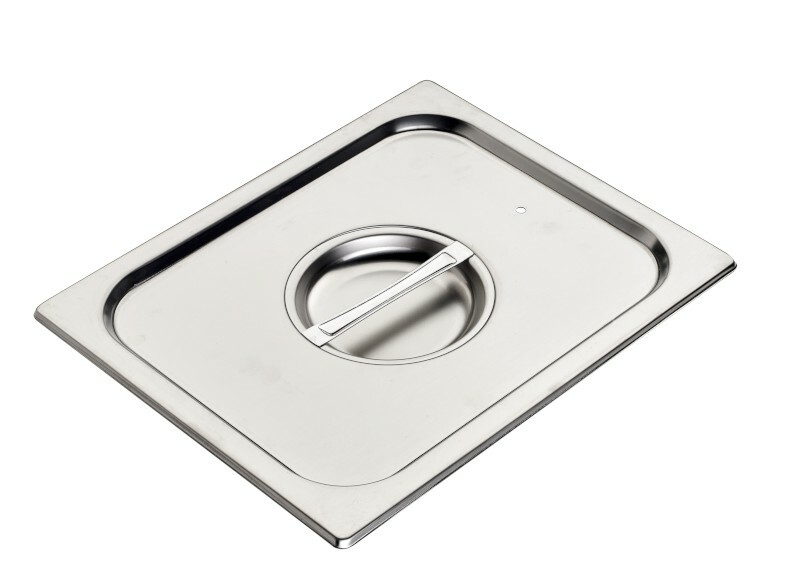 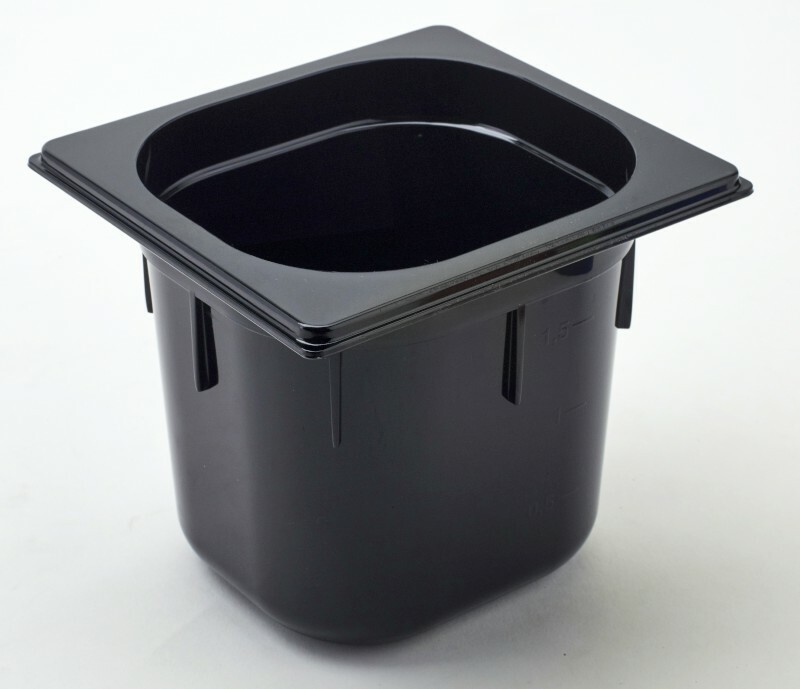 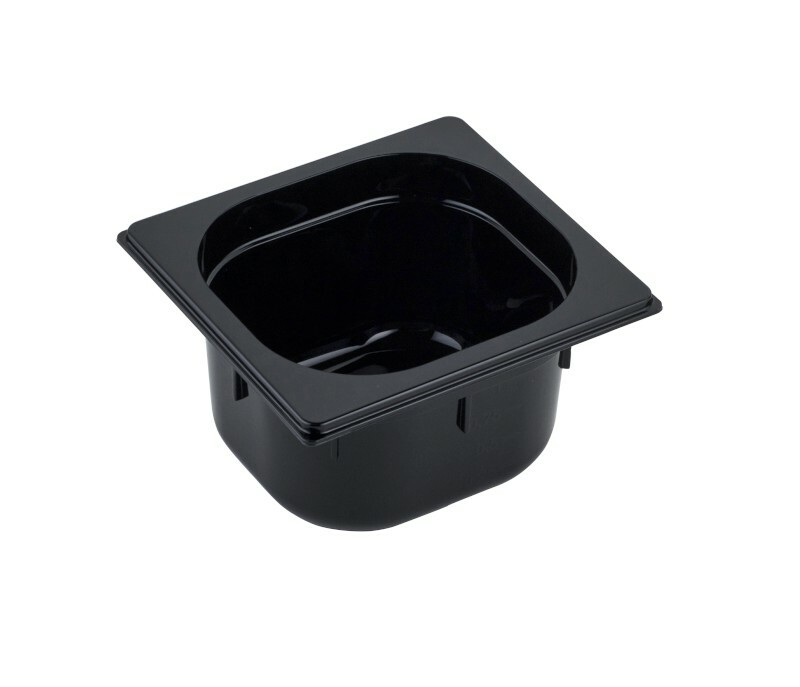 Regularly available in the most important gastronorm sizes (1/1 height 20, 40 and 65mm; 1/2 height 40 and 65mm; 1/3 height 40 and 65mm), they can be also produced in other sizes on request. 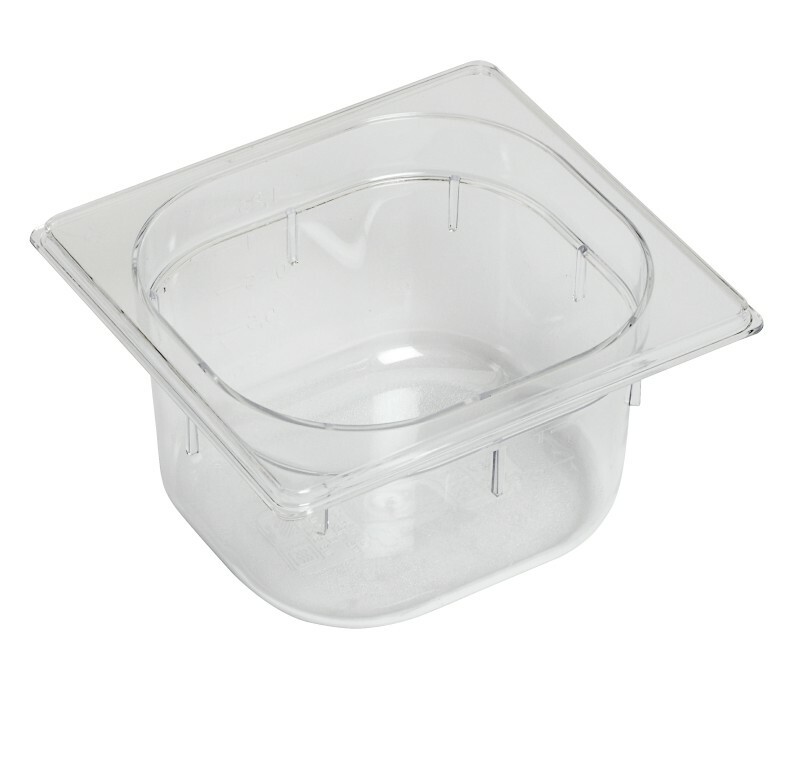 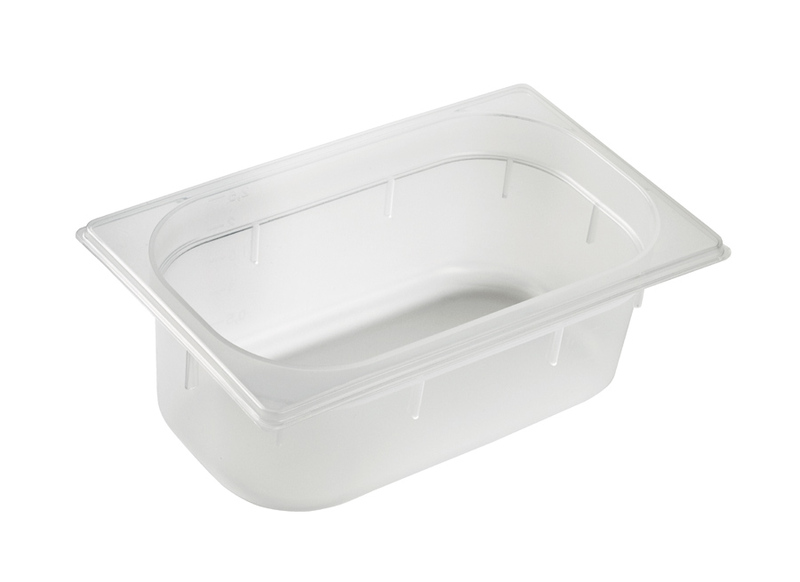 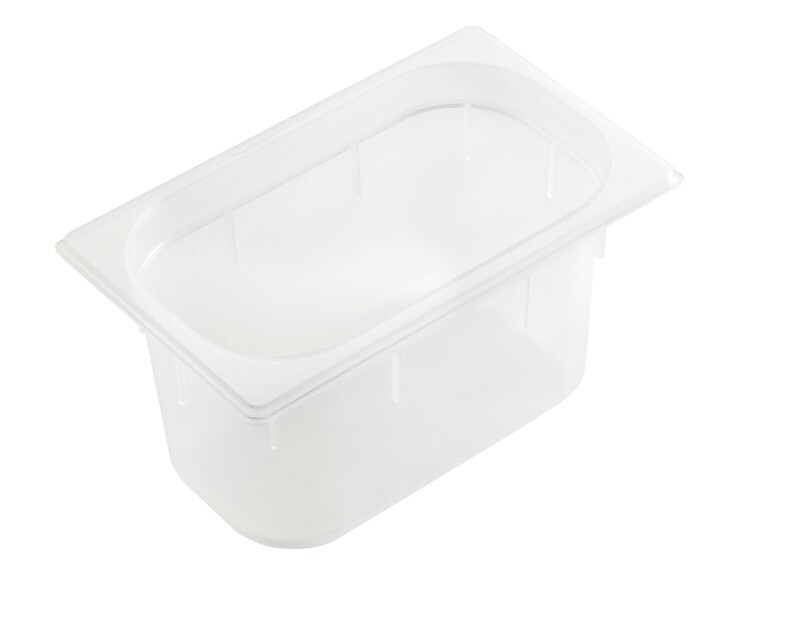 Of high quality, the Gastronorm polypropylene containers are especially apt for preserving food at excellent value for money. 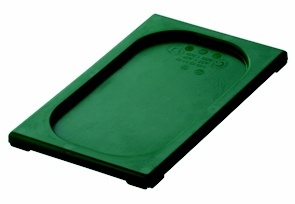 The large thickness (2mm and more) make them robust and resistant to impacts. 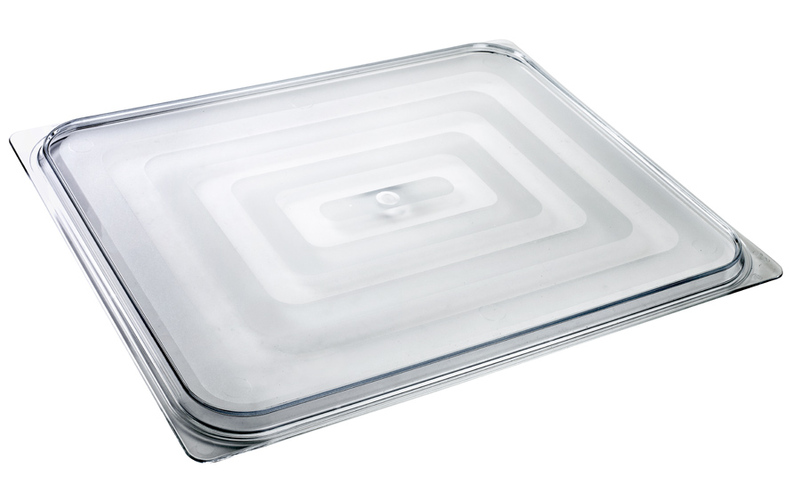 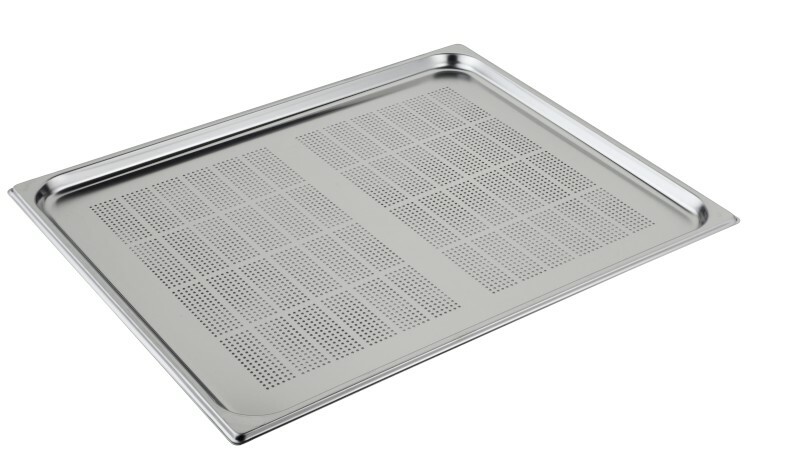 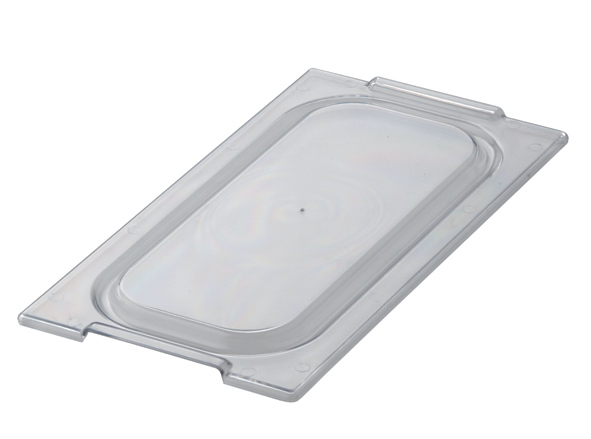 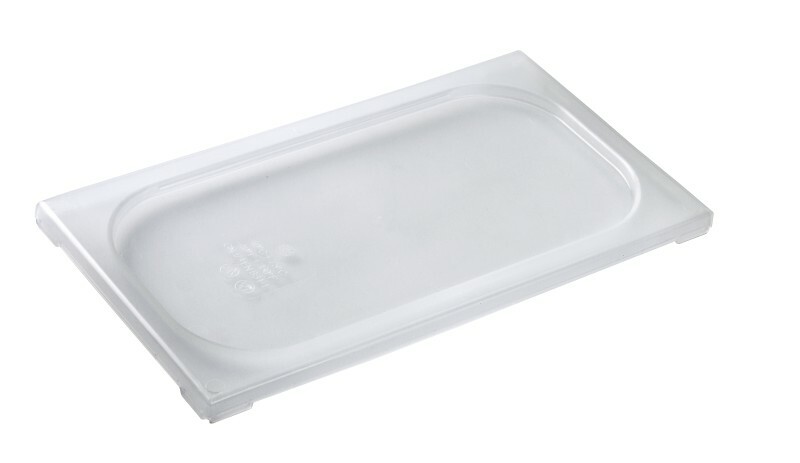 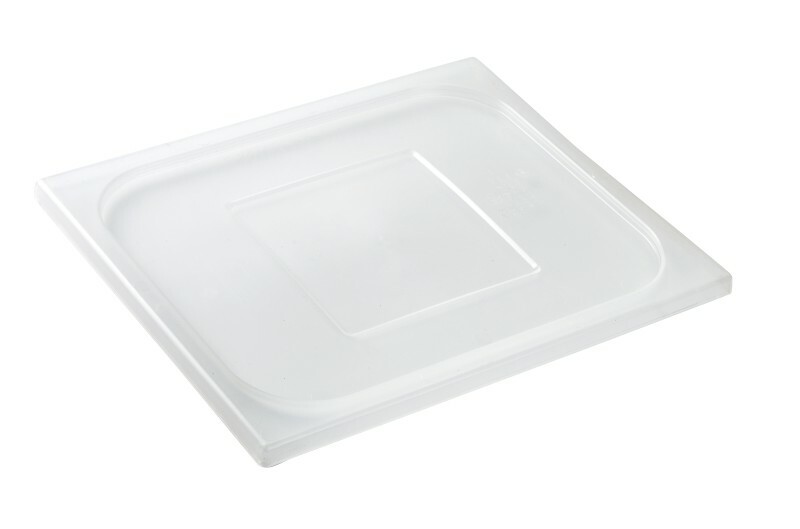 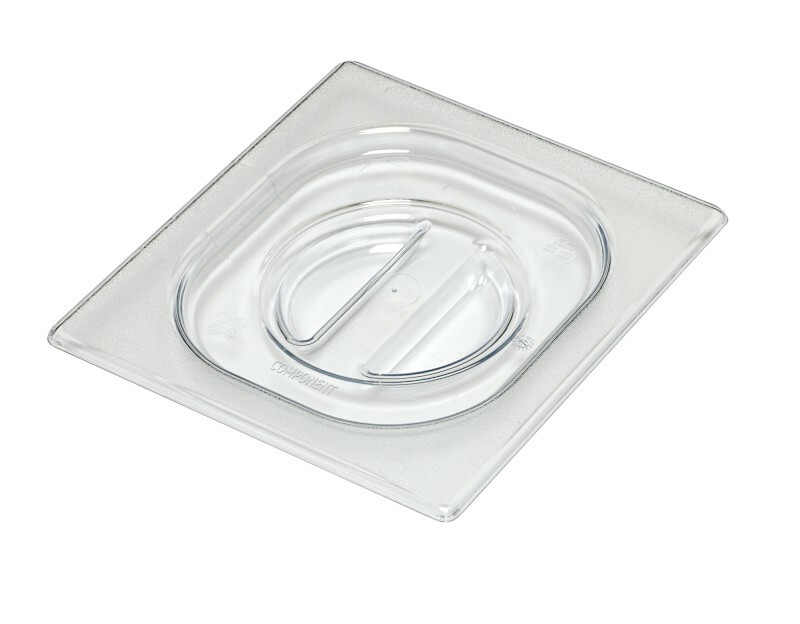 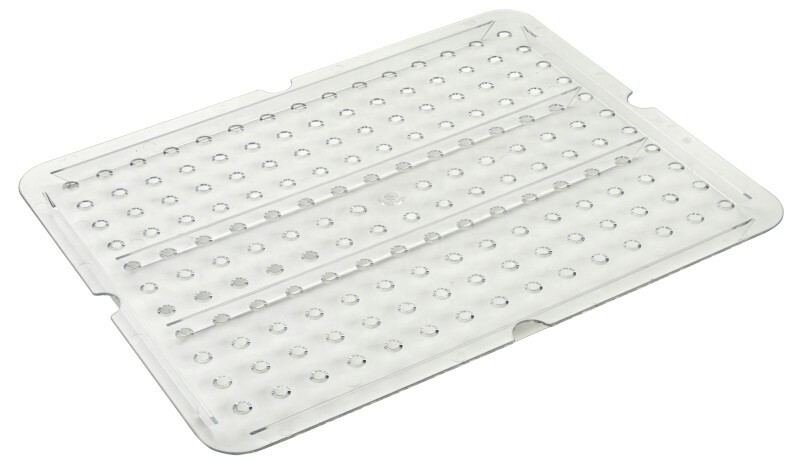 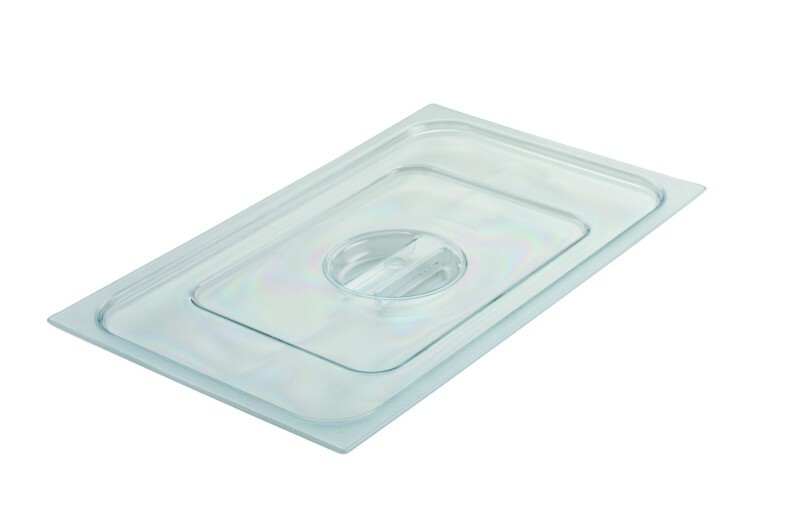 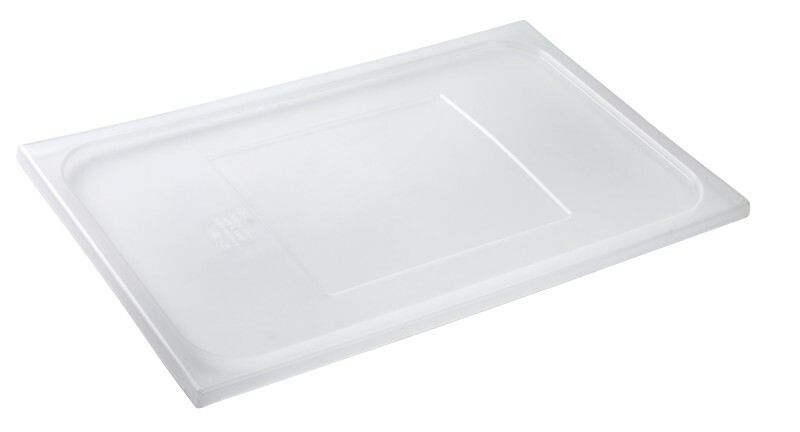 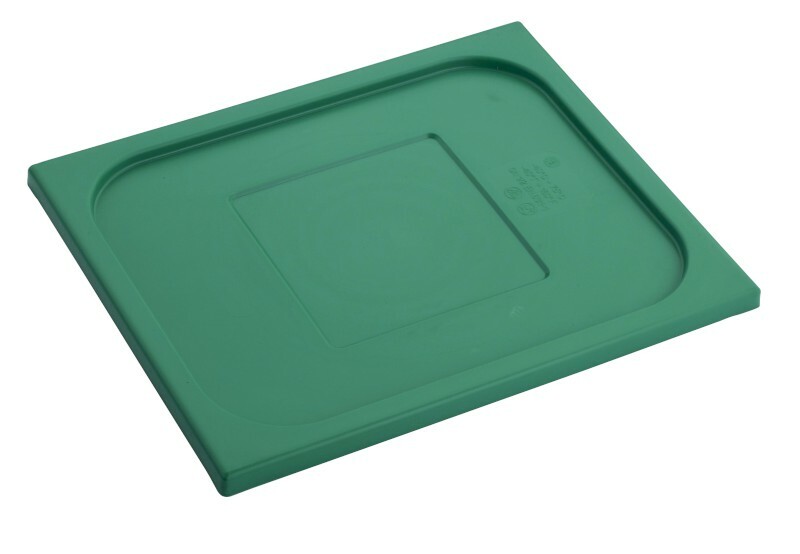 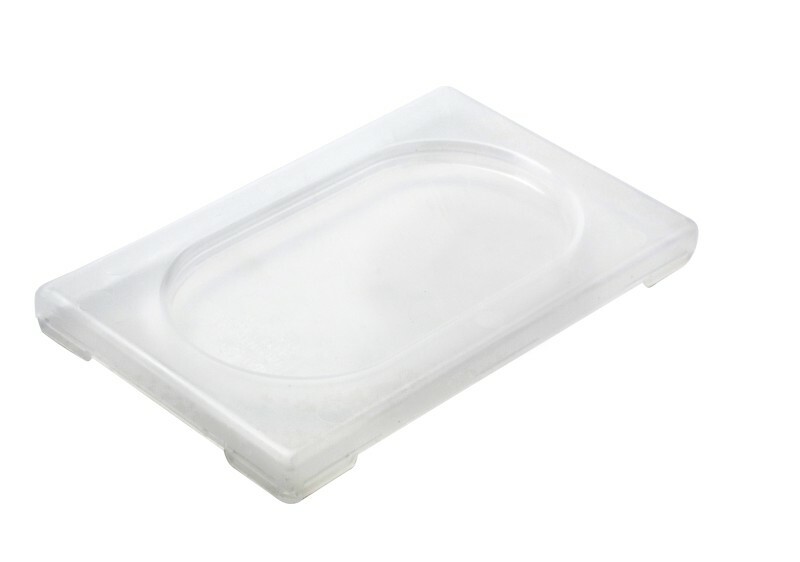 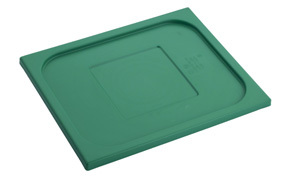 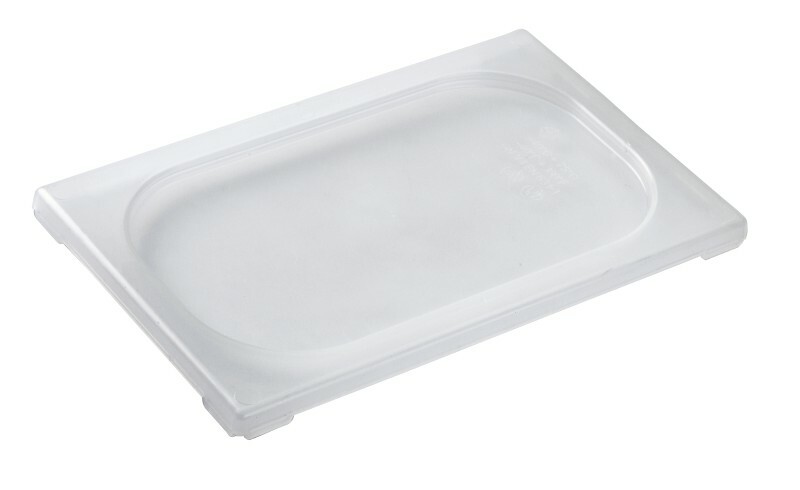 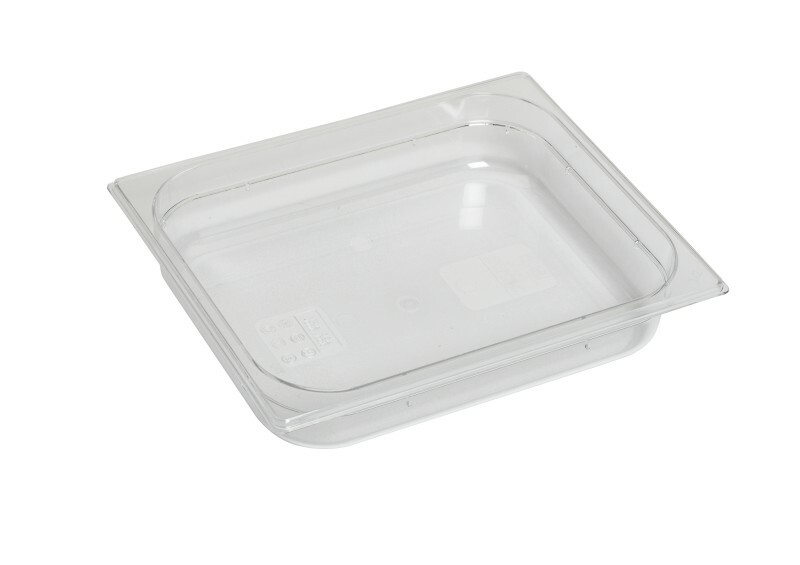 Ideal to stock and “catalogue” food: semitransparent, it’s possible to recognize the content, while the air-tight lids keep everything well sealed. 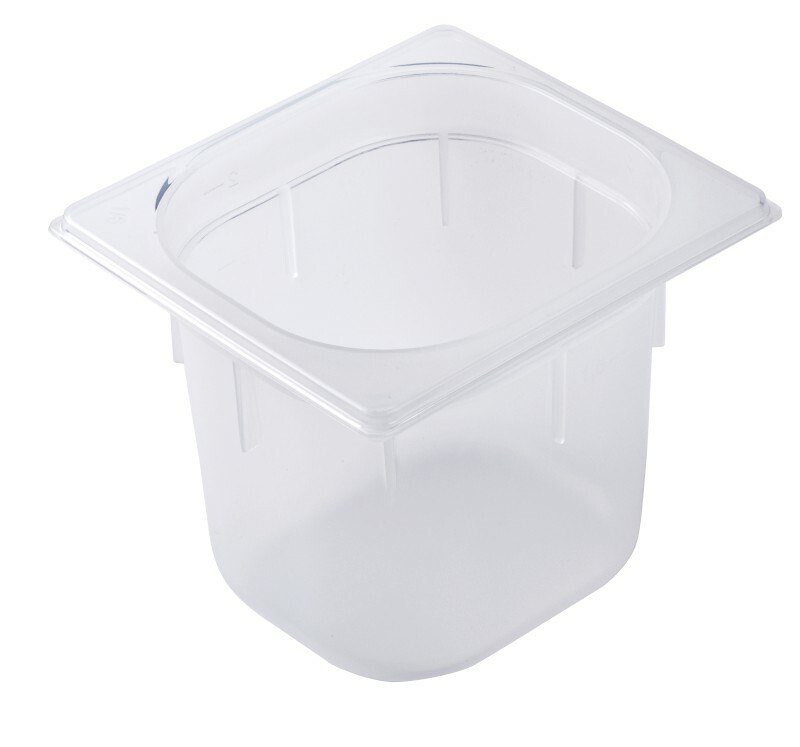 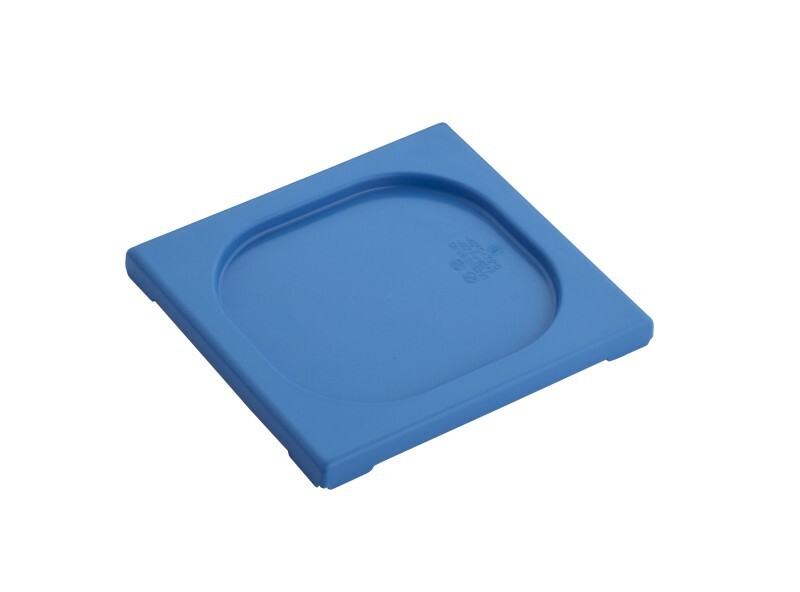 On top of that, lids are available in various colours (blue, red, yellow, green…) in order to catalogue food accordingly with HACCP norms. 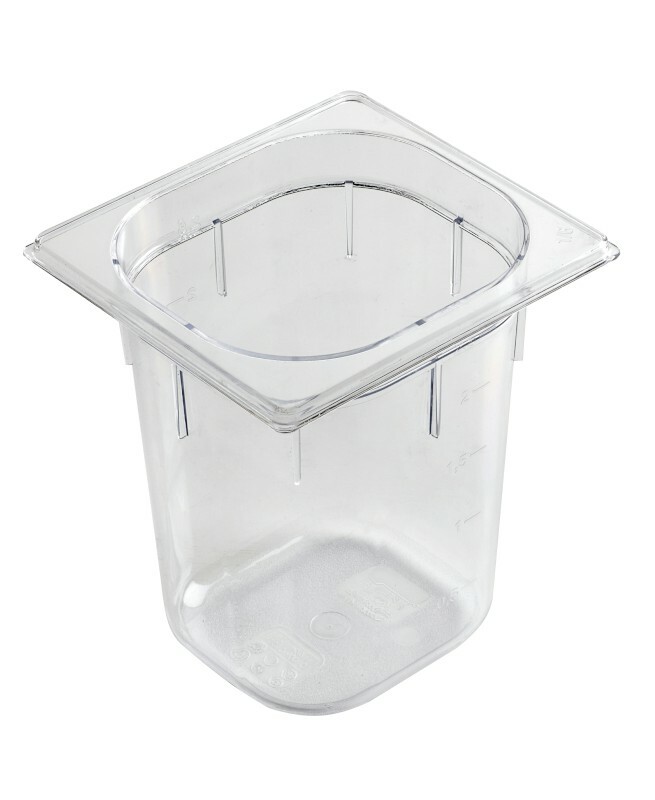 The product comes with levels on the sides to measure the liter content and is rounded off with a highly competitive price. 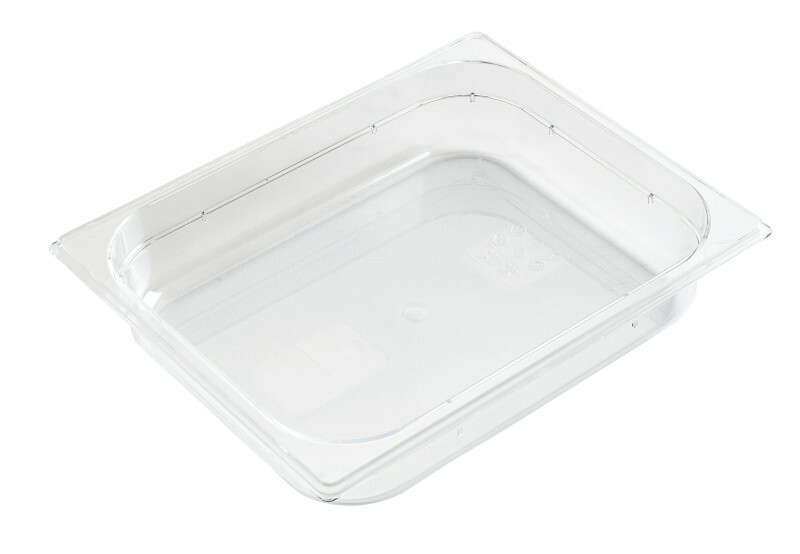 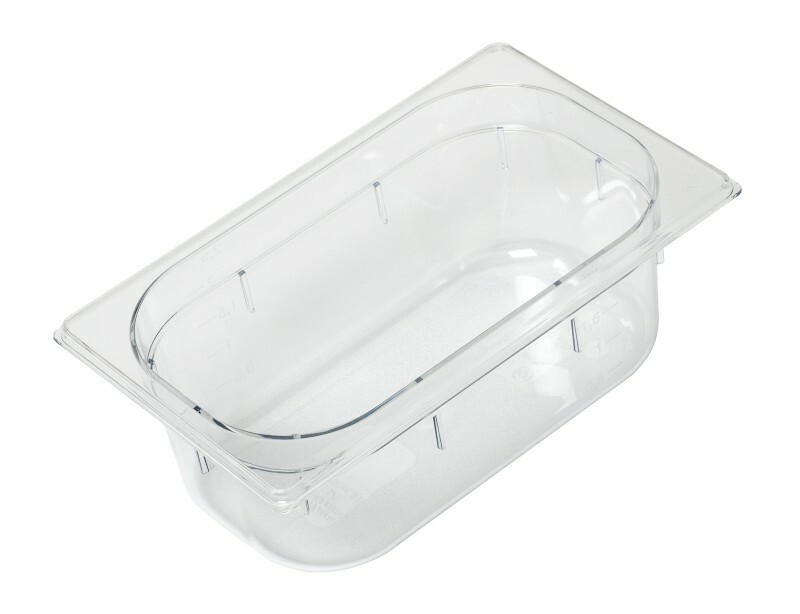 Our polypropylene GN containers have a good resistance to high temperatures (we recommend to use them from -40°C to +70°C to preserve them over time); they’re also certified to be used in the microwave, which means they can be used to store and present the food in one go. 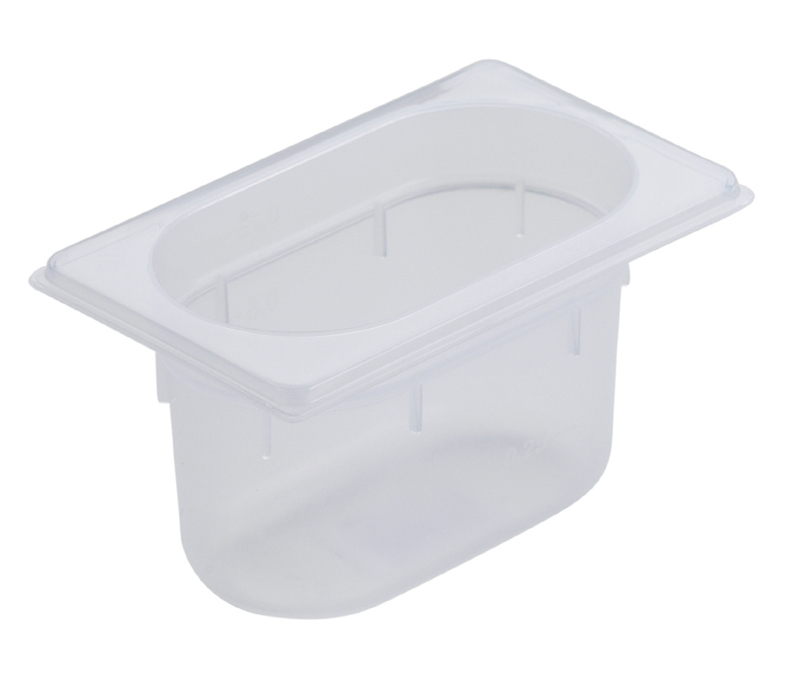 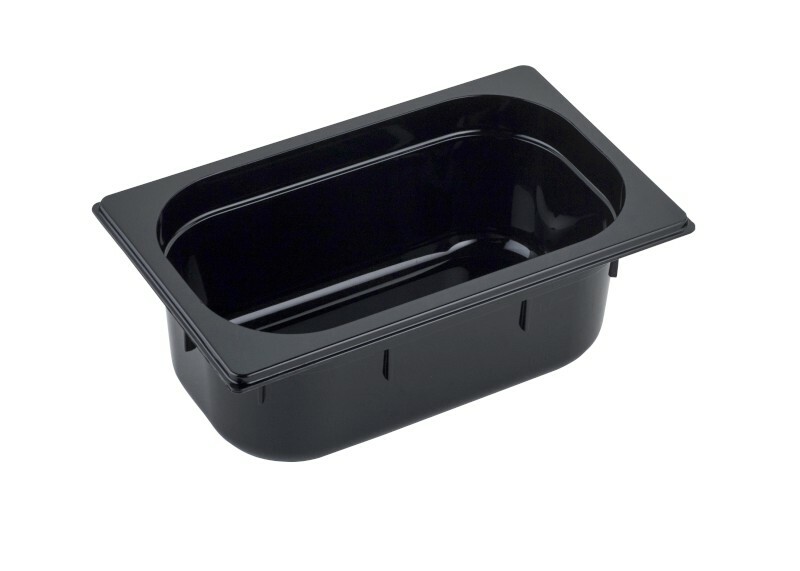 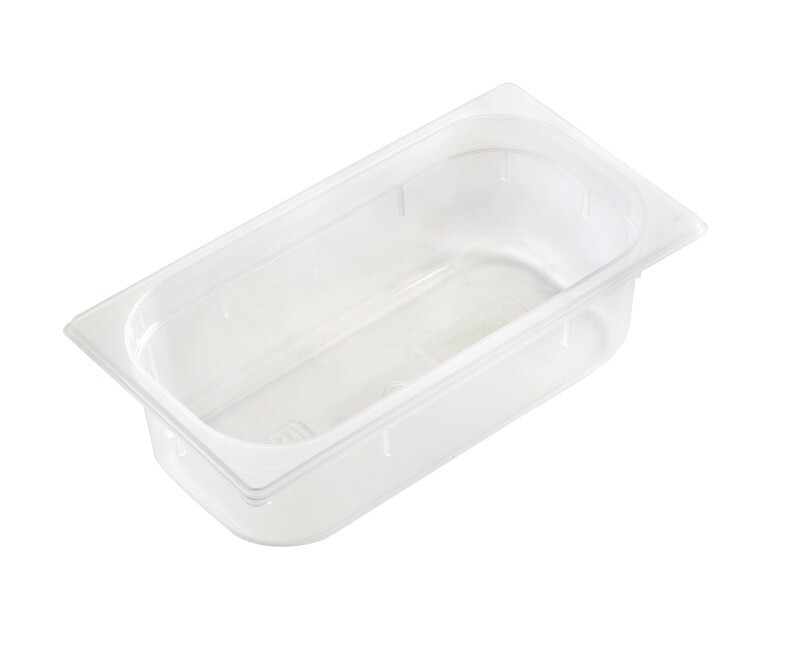 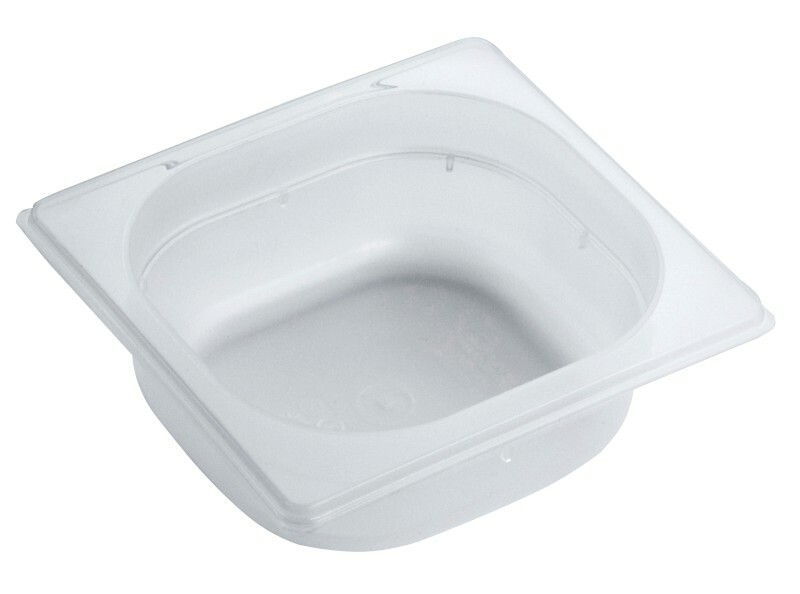 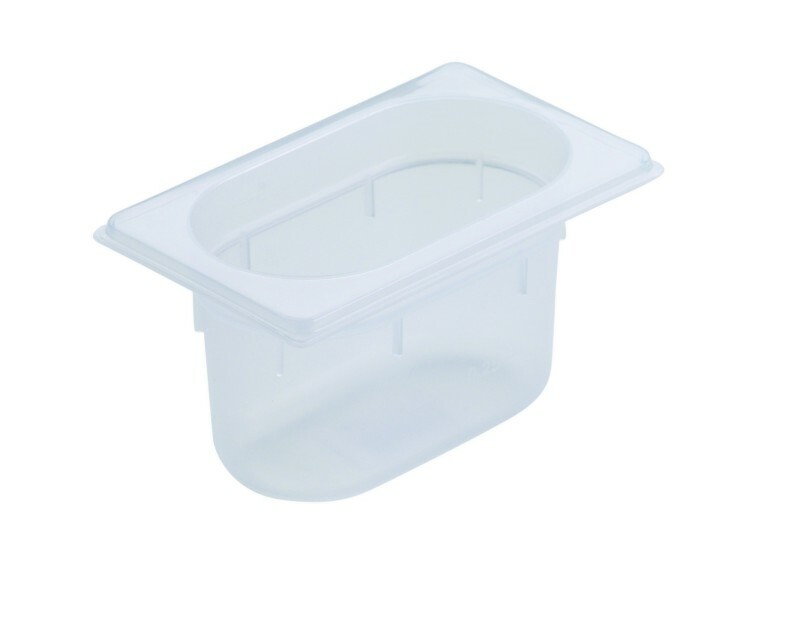 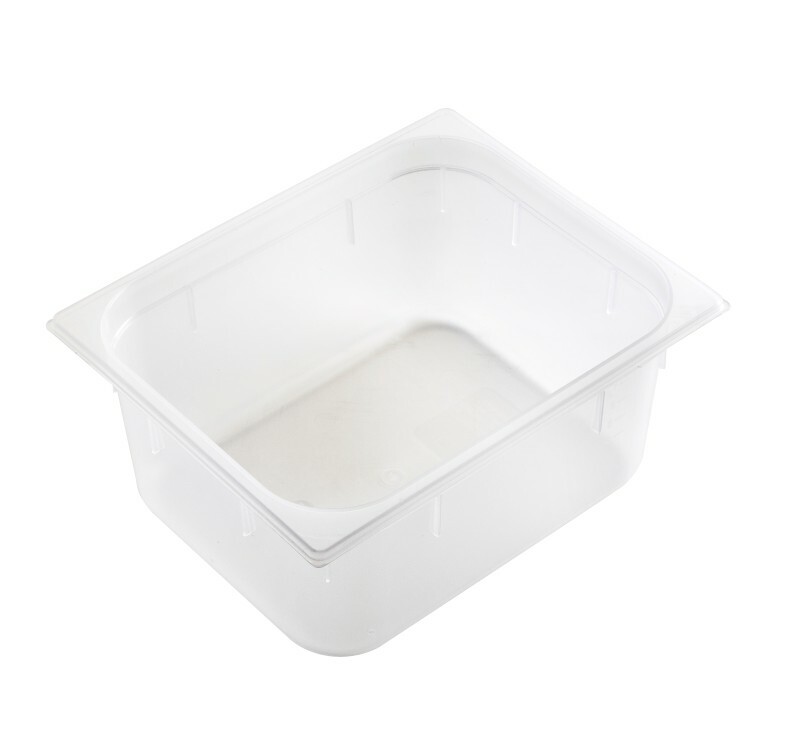 Completely free of Bisphenol A , thanks to their raw material purity and high quality the Gastronorm polypropylene containers are odourless, flavourless and pass food contact tests with flying colours, including latest indications from EFSA (European Food Safety Authority). 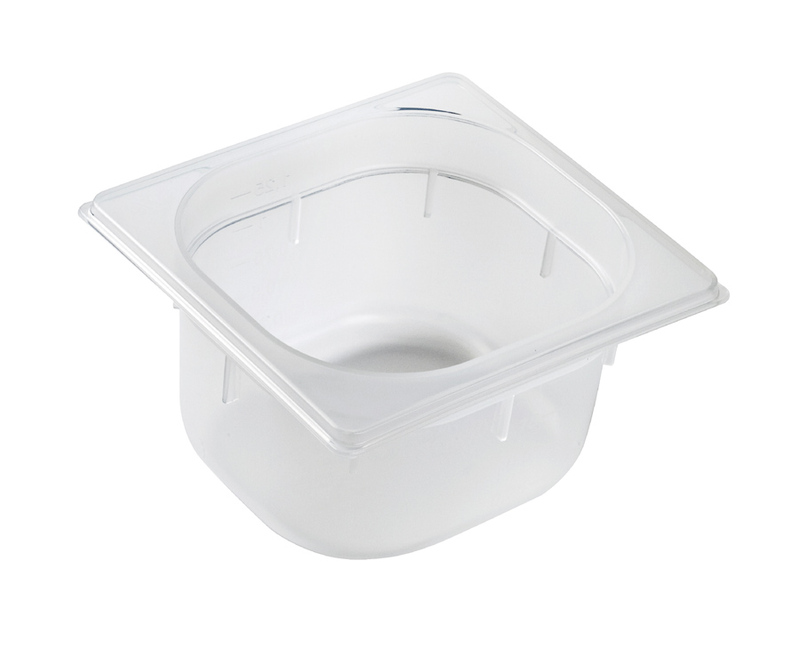 Dishwasher safe, the tight but smooth radius improves capacity and makes them easy to clean. 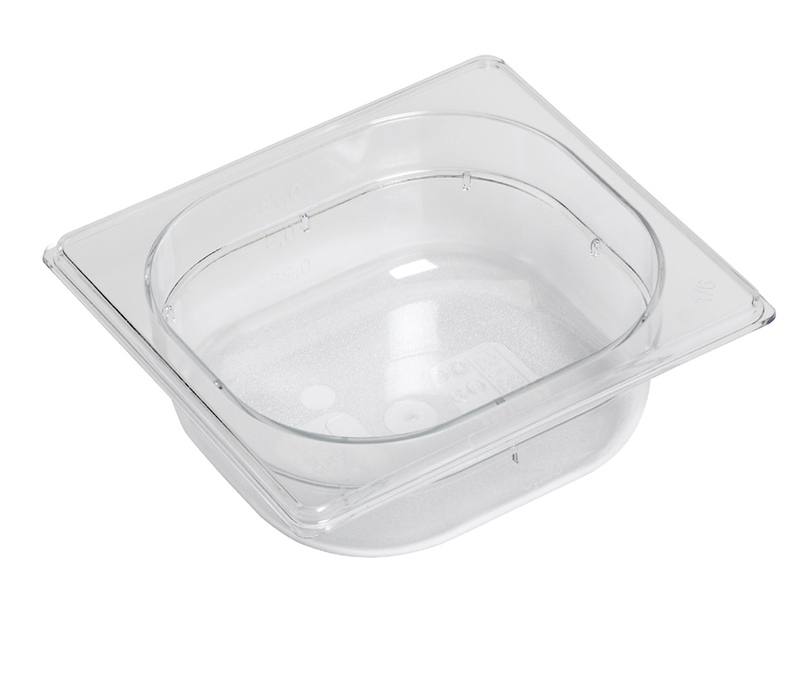 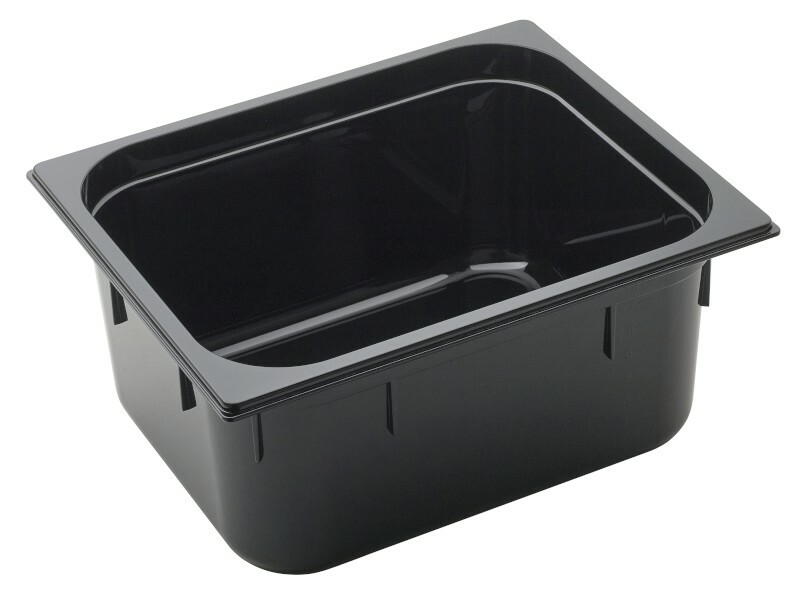 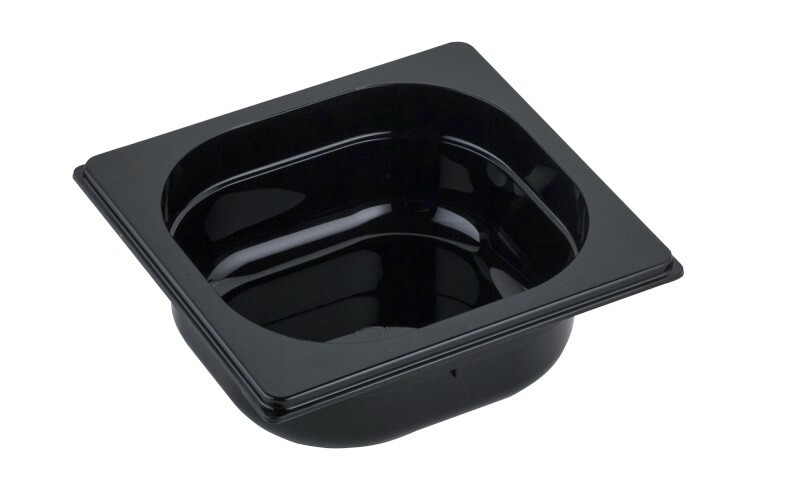 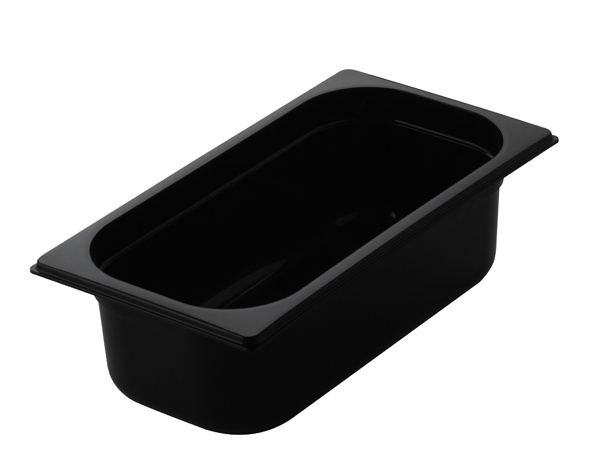 Incredibly transparent or shiny black, the polycarbonate Gastronorm containers can be used not only for stocking but also for food presentation. 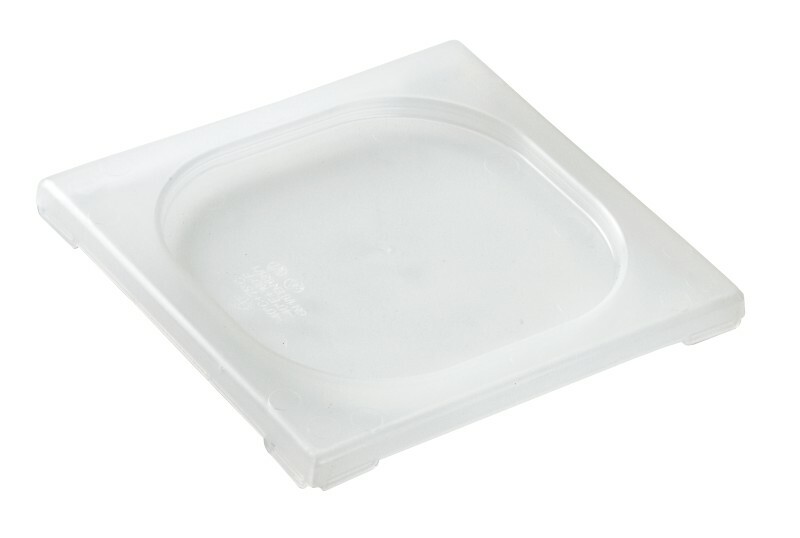 Polycarbonate is a naturally transparent plastic, with the ability to transmit light almost as well as glass. 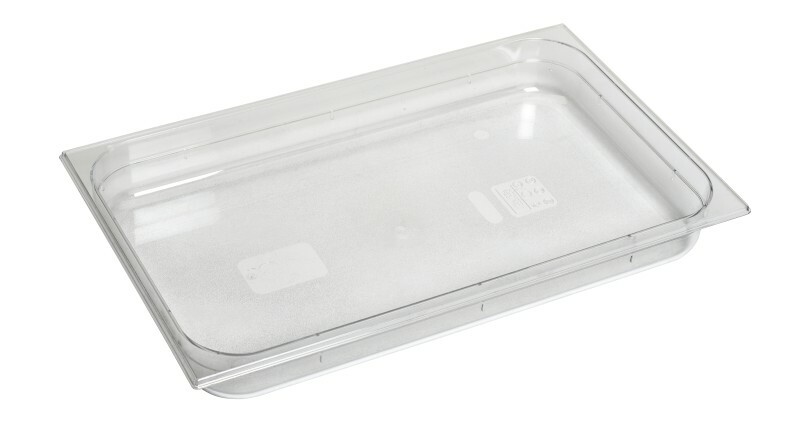 It’s also of an exemplary strength and hardness, to the point that it’s used to build bulletproof glass! 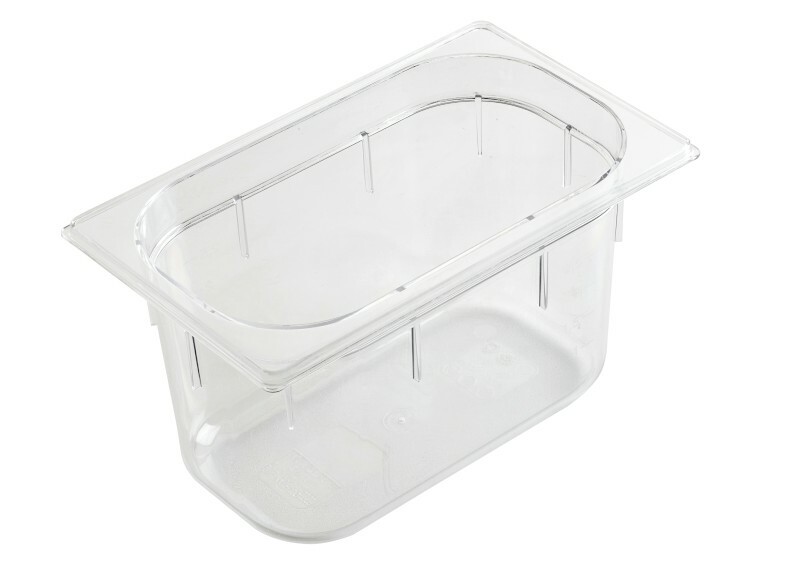 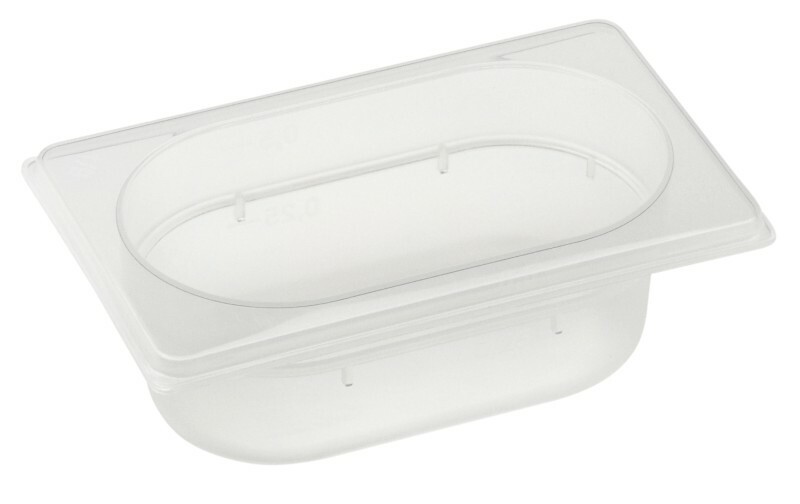 Thanks to their high thickness (2mm and more), our gastronorm polycarbonate containers resist impact easily: you can literally jump on them without fear of breaking them. 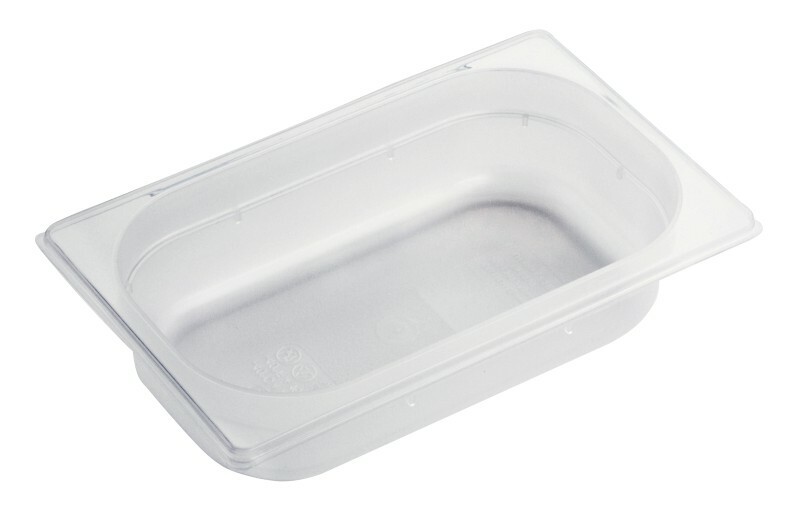 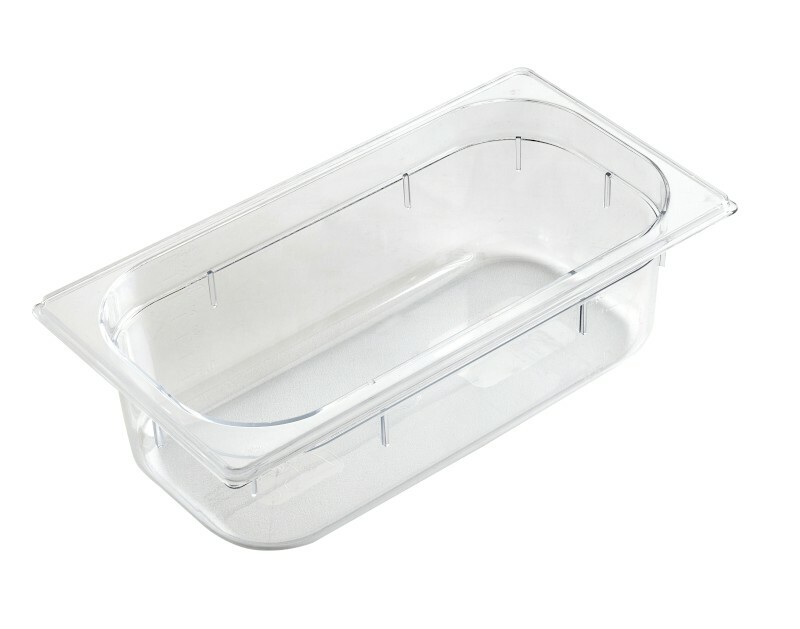 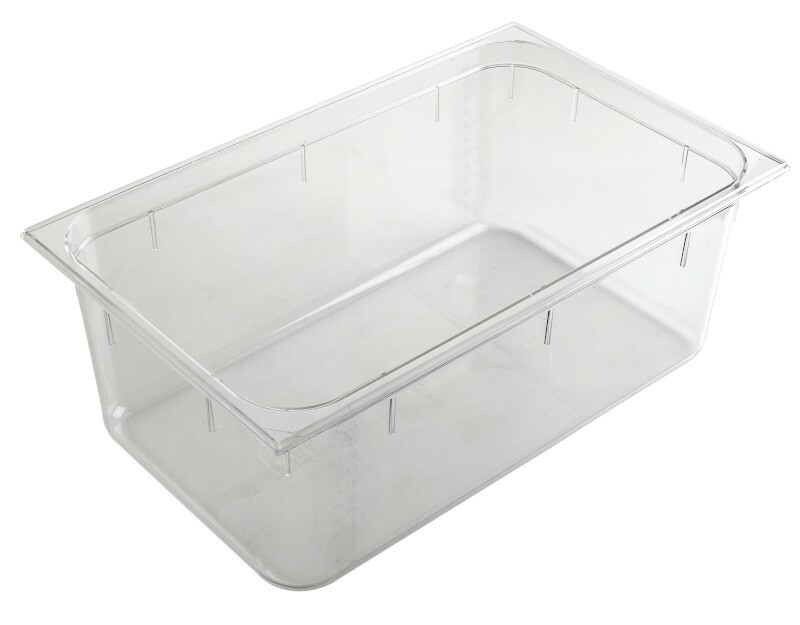 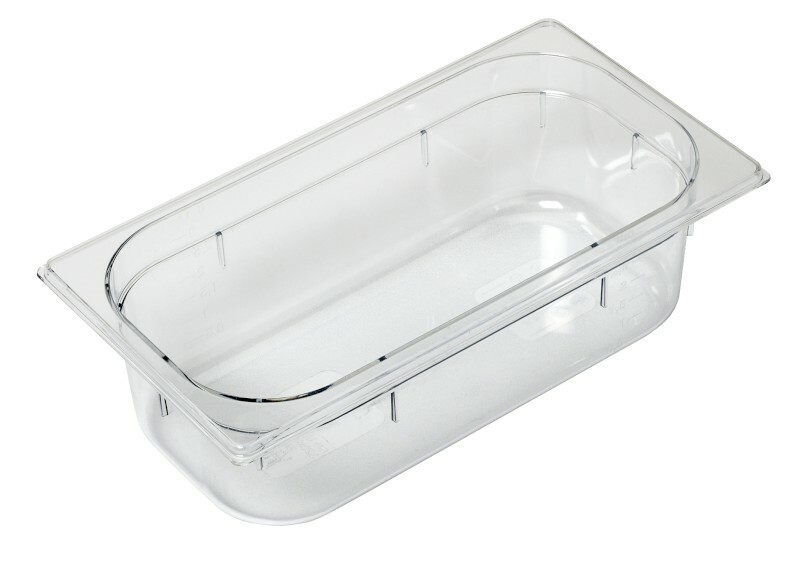 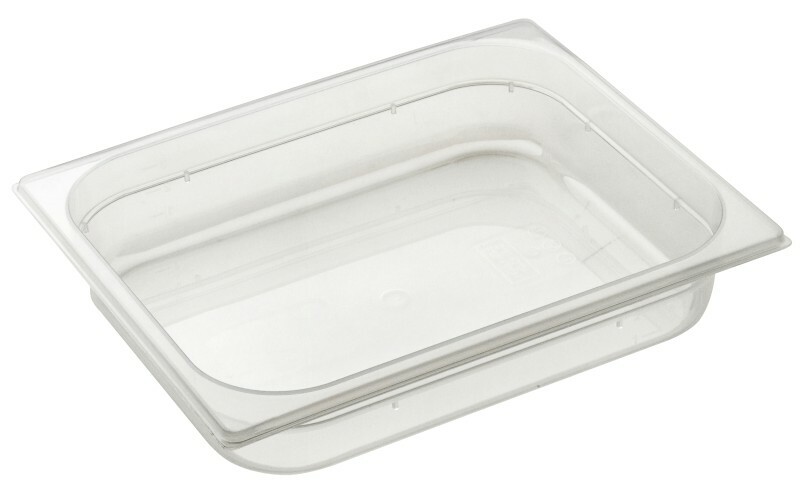 Polycarbonate is the plastic with the greatest resistance to high temperatures: we recommend not using our containers at over 100°C to preserve them over time, but their melting point is at 160°C. 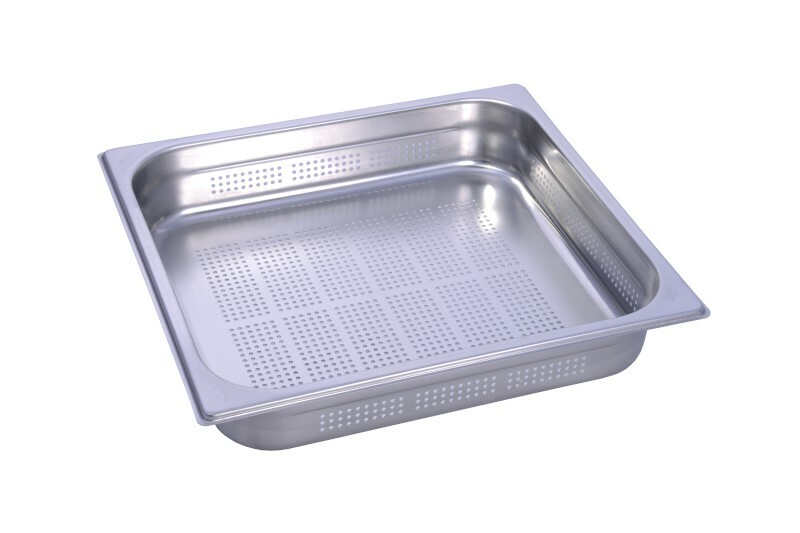 For this reason they can be used to transport hot food and liquids, or for bain-marie. 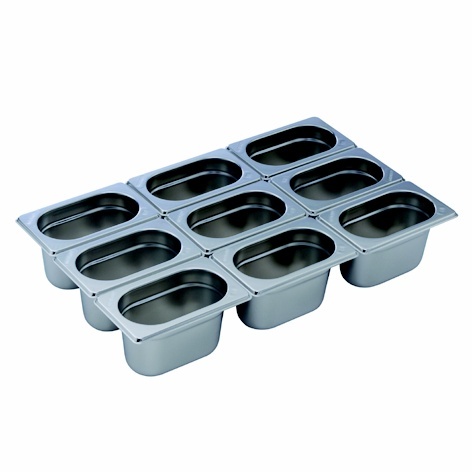 They’re also certified to be used in the microwave. 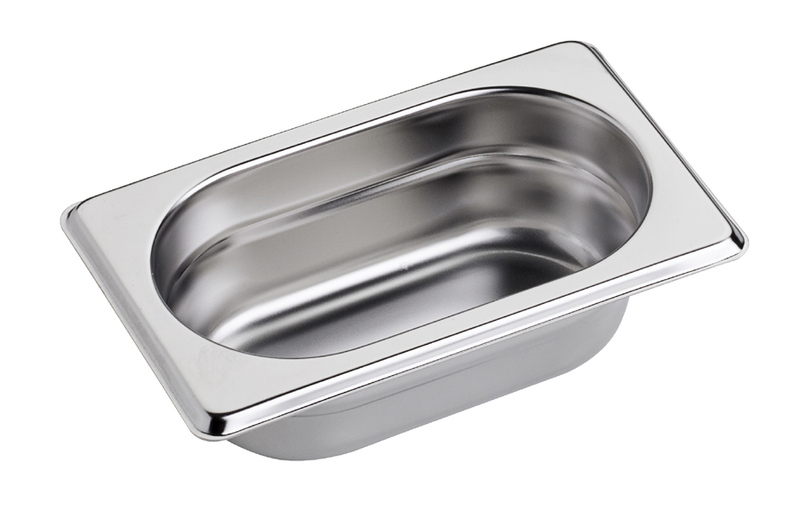 Thanks to the raw material purity, they’re odourless and flavourless and pass food contact tests with flying colours, including latest indications from EFSA (European Food Safety Authority). 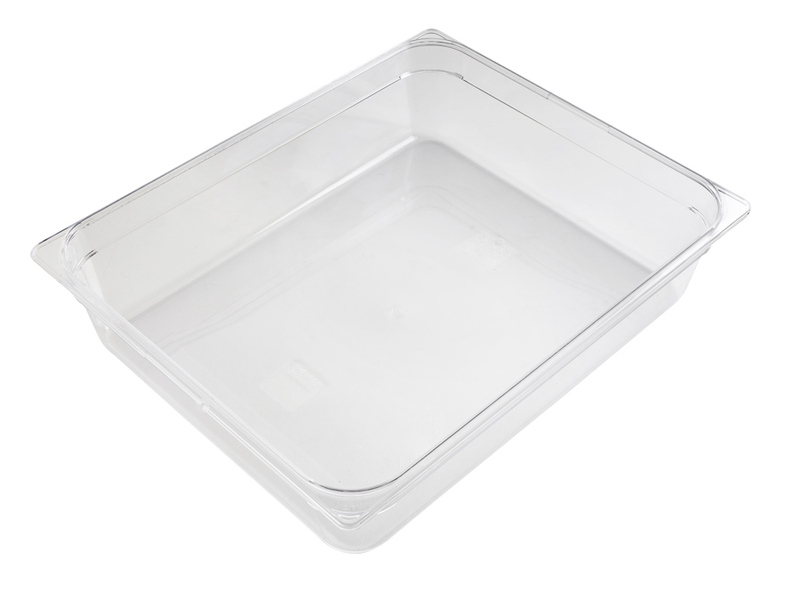 Volume is easy to measure thanks to the level marks on the sides. 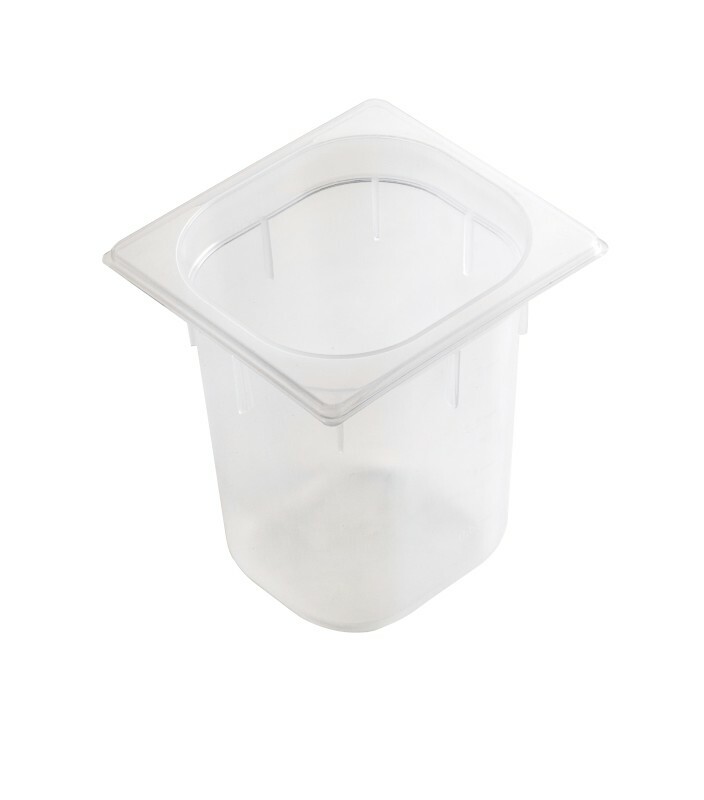 Dishwasher safe, the tight but smooth radius improves capacity and makes them easy to clean. 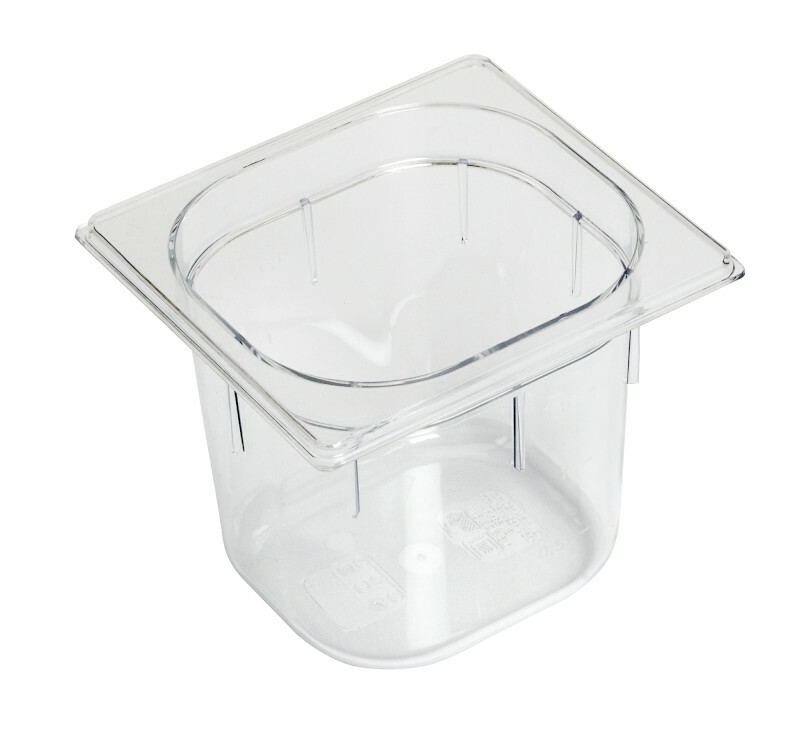 The lids are compatible with our stainless steel GN containers and their transparency allows visibility inside the container.